Is there a better MPV on sale? You can tell when a long-termer’s got under your skin when you’re having a strop like a petulant child on the day it has to be returned - and so it was with the Mercedes-Benz V-Class I’ve run for six months. During that time I’ve racked up 20,473 miles, spending 467 hours and 23 minutes behind the wheel and one thing’s abundantly clear (woo-woo, spoiler alert): this is the best MPV on sale. So how have I come to this conclusion? Is it the most engaging seven-seater to drive? No, not at all - its self-evident van-based origins mean it handles like a well-sorted commercial vehicle and, as good as that is, it’s not going to trouble something like a Ford Galaxy or S-Max over a windy B-road. Neither does it compensate by being especially economical, with an average of 31.6mpg in our hands. That’s 29.5% short of the official 44.8mpg claim. When you need to convert it into a makeshift van it’s a faff, too - there’s no such convenience as seats that fold flat into the floor. With the V-Class it’s brawn that’s required. Oh, and space to leave the five chairs while they’re not in the car. Surveying the price list and spotting this V 250 d AMG Line Extra Long weighed in at £52,470 back in March 2017 - rising to £58,260 with a suite of options - confirms that it’s not inexpensive to buy, either. 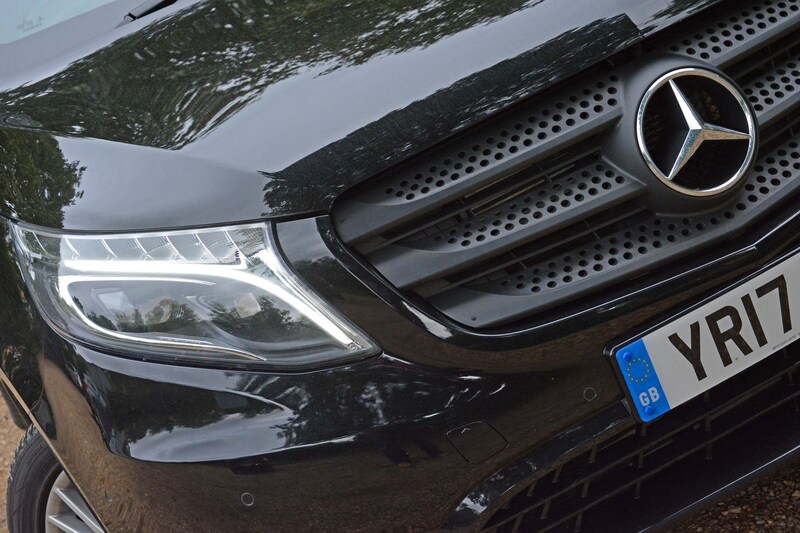 Although with that oversized three-pointed star in the grille, did you expect it to be? What’s clear is that you get an enormous amount of metal - and space within - for your money. Ford’s Titanium X-spec Galaxy with a similarly powerful 180hp 2.0-litre diesel engine and an automatic box costs £37,015 before options. 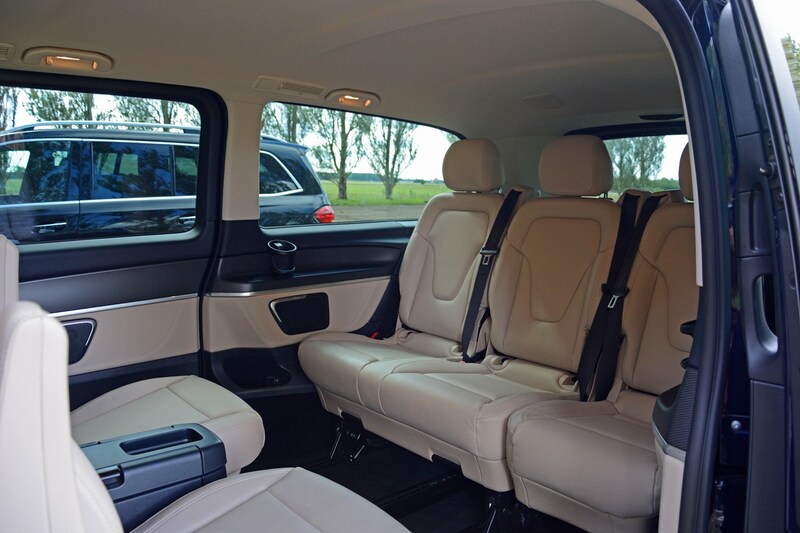 Okay, it’s not as luxurious as the V-Class, but it’s nevertheless well-equipped and its leather-lined cabin will seat seven adults reasonably comfortably, albeit with precious little space for luggage. 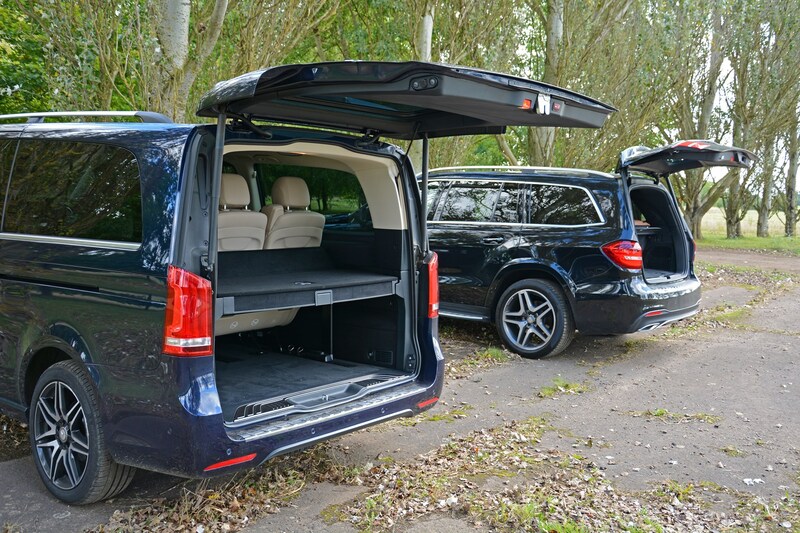 In the Mercedes you can easily carry a septet of passengers in greater comfort - with the flexibility of having the middle row seats facing backwards - and have room to carry everyone’s stuff in the enormous boot. If you can afford to stump up the asking price, it works out at a decent-value package. There’s a lot of metal and space within. 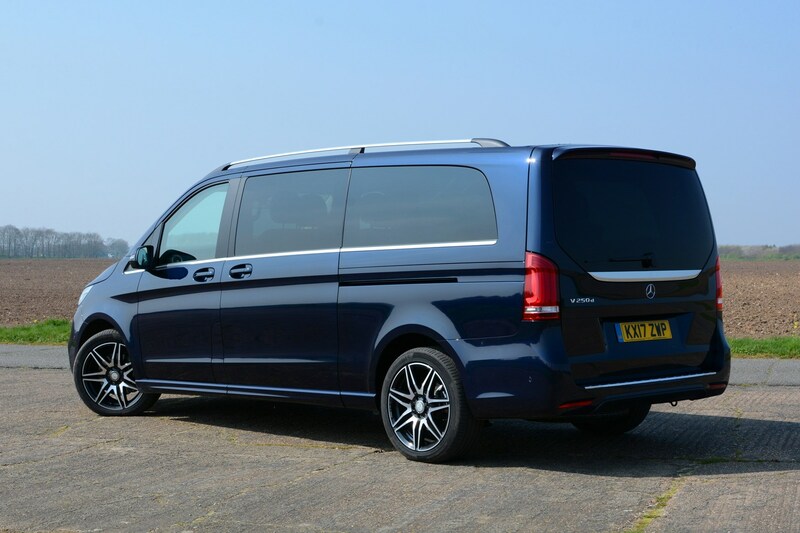 You can, of course, have the similar-looking, but less special-feeling Vito Tourer for less money than the V-Class, but its lack of plushness makes it feel more workmanlike than our V 250 d’s well-heeled-family sating cabin. Sliding doors never really took off as a must-have thing with European MPV manufacturers - most in Japan and North America have this feature - and it makes getting in and out of the back in narrow car park bays all the more easy. That they’re electric adds a little street theatre, and convenience on inclement days. At £400 the luggage cover proved to be a brilliant addition, too. It was rare I opened the whole tailgate, instead popping the glass and using the convenient storage boxes that collapse into the shelf instead. Electric front seats were welcome, but difficult to justify at £1,225 if only one person drives the car most of the time. The Comand Online package at £1,795 also appears pricey, but the sat-nav never let me down, and its live search facilities made my European trip all the easier. I’m less convinced about the £1,695 Driving Assistance Pack, but primarily because - fortunately - I never had to call upon many its Lane Keeping Assist and Pre-Safe functions. The Blind Spot Assist was fine, but the door mirrors are usefully large anyway, so you could get away without having it. Mercedes’ Distronic adaptive cruise control system was brilliant, though - I set it on almost every journey, whether it was a 30mph urban stretch or an autobahn slog through Germany. It was a little jerky from time to time at slower speeds, but not uncomfortably so. Plus the stop/start system kicked in reliably when its parameters were met, restarting with minimal fuss. And is AMG Line trim the one to have? Some colleagues winced when they first clocked the Silk Beige leather interior, but it’s stood up well to the rigours of family life. It was easily wiped down, the only grumble being dye from new jeans causing a little discolouration that was easily scrubbed off. Thankfully the carpets were contrasting charcoal grey so I didn’t have to insist that passengers kicked their shoes off upon entry. I’ll admit to being dubious about the notion of a sporty-looking AMG Line-spec van-based MPV, but if anything the bodykit is subtle and the 19-inch alloys help it look less like its Vito twin. 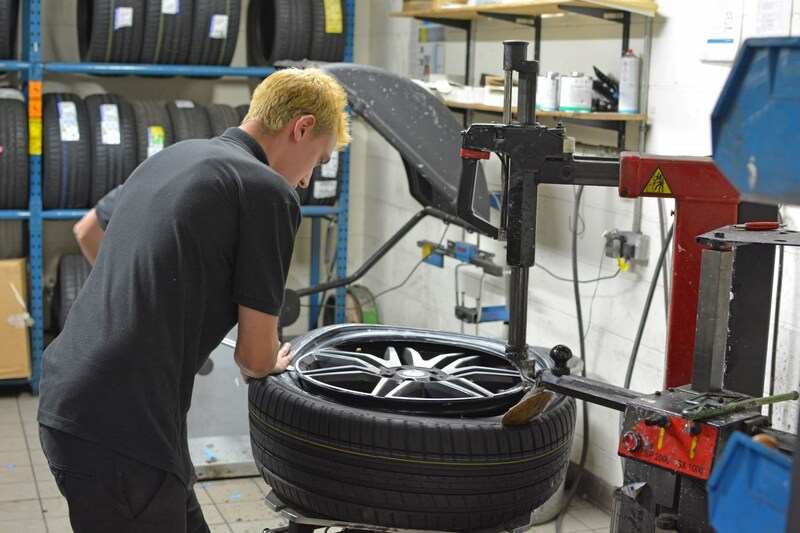 They didn’t impact significantly on the ride quality either, although be aware that you’ll likely be looking at a tad over £200 per corner when it comes to replacement tyres. Extra Long is the body I’d recommend, too. The standard (shortest) V-Class looks a bit stunted, while the middle-sized Long is the most expensive variant courtesy of its glazed roof. Normally a glass top would be one of the first things I’d spec, but given how much glass area there is anyway, it’s rather superfluous. 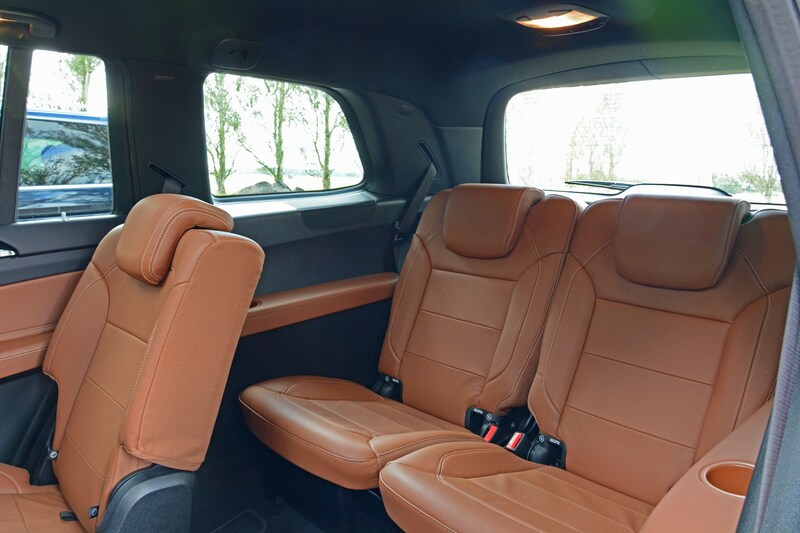 So there we have it: if you regularly transport seven (or eight depending on the seating layout) people, require space for their belongings and you can rustle-up the asking price, the Mercedes-Benz V-Class is the one to have. Now, what chance have I got of setting up a JustGiving page for the deposit..? Parkers’ six-month spell with the Mercedes V-Class long-termer was drawing to a close and, despite all the things I’ve asked of it, I hadn’t treated it - or myself for that matter - to a properly long jaunt in it. 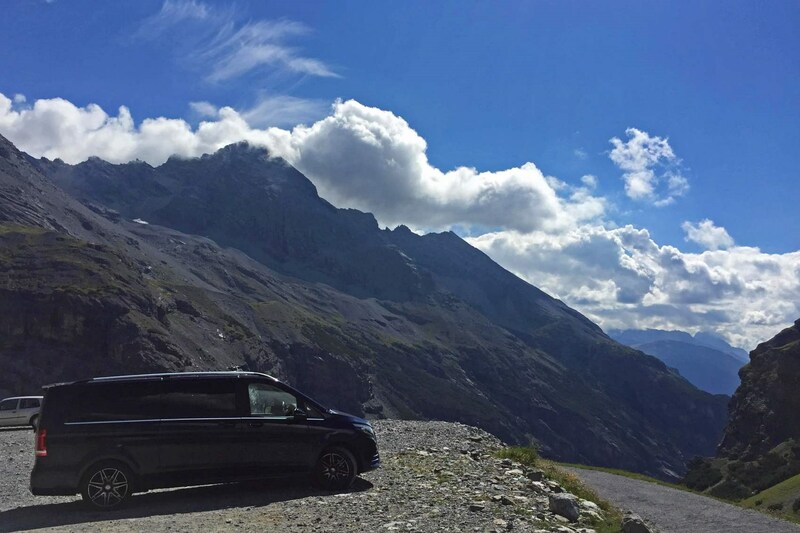 I was itching to go on a European road trip, and even though our V-Class wasn’t the belled-and-whistled-up Marco Polo version, I figured it could still be used as a makeshift camper van to cut down on hotel bills. 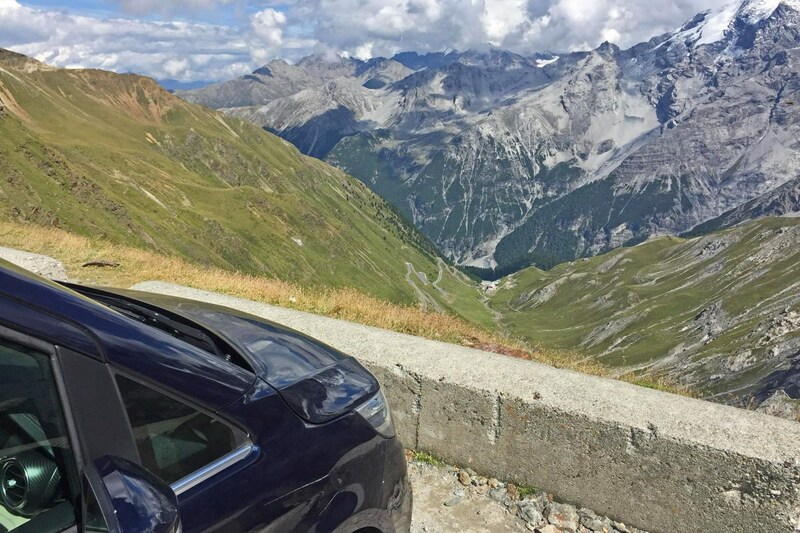 In truth, I was also jealous of my colleague Adam Binnie’s Stelvio Pass exploits in an Alfa Romeo Giulia Quadrifoglio over the summer. Okay, the Extra Long V 250 d wasn’t the ideal choice for experiencing that squiggly ribbon of asphalt for the first time, but a good road’s a good road, right? A week before the journey was set to take place I pored over the V-Class to ensure it’d be up to the task, discovering the tyres weren’t at their best after a little over 17,000 miles in five months. 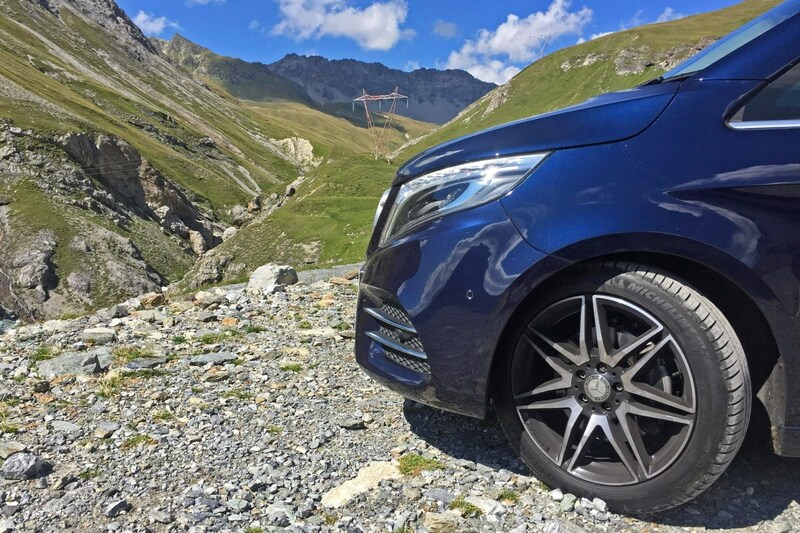 The rear pair were still above their wear markers, but putting this rear-wheel drive leviathan through its paces over a punishing trans-Alp route, let alone the 2,000-mile round-trip getting there and back, would likely take them into the realms of illegality. Up front it was a sorrier tale: those two needed swapping for new rubber imminently, not least because some exuberant cornering (ahem) had smoothed-off the outer shoulders of the tyres. It was soon booked in at my nearest Mercedes retailer to have all four tyres replaced. Being 19-inch alloy rims shod in 245/45 rubber (wide tread, shallow sidewalls in layman’s terms), they weren’t cheap - depending on the brand (and retailer) you go for expect to pay £180-£230 per tyre. Progress down to the Channel Tunnel from deepest Lincolnshire proved oddly easy, with no hold-ups and few Sunday-driving middle-lane hoggers sullying the experience. This was my first time in a tall train carriage - single-decker units designed to accommodate loftier vehicles such as high-roof vans, coaches and 1.88m-tall V-Classes. 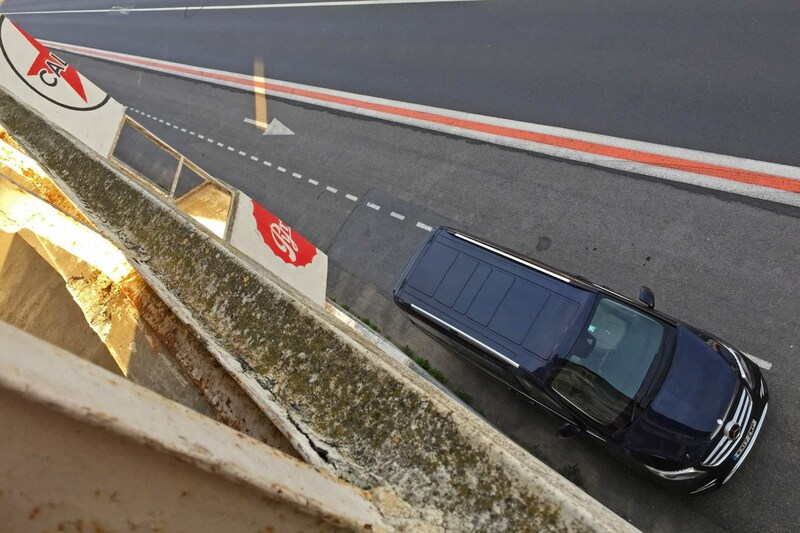 As well as the extra roof clearance, because there’s no need for staircases to access the upper deck there’s greater width for vehicles too, meaning less sucking in air through teeth as you do you damnedest not to kerb those aforementioned rims on the metallic kerbs. Of course, the 360-degree camera helps no end. Just over 30 minutes later I manoeuvred the V-Class back out of the train and set about pressing on through north-eastern France, Belgium, a slither of the Netherlands and down into Germany. It never ceases to amaze me that in under five hours after leaving the UK you can be zipping past Aachen and embarking on some high-speed runs on derestricted autobahns. Reaching Germany had been uneventful, if swift, with the only real point of note being that I never remember to have any Euro cents in change to use the facilities in Belgian service areas. How I held onto that pee from Brussels until I sprinted across the border I’ll never know. If you’ve yet to experience driving at high speed on the German motorway network then make it one of your to-do things to get ticked-off in 2018. Even in a car - such as the V-Class - not designed to crush continents with its sheer speed, it’s nevertheless a satisfying way to drive. Edging up from 130 to 200km/h in 10km/h increments allowed for nuances in the way the V 250 d handled at speed to come to the fore. Predictably, as I got nearer its 129mph (208km/h) top speed the Mercedes felt little different. Quicker, obviously, but no sudden increase in vibrations, sway from gusts when lorries were overtaken or lightness in the steering. The brakes? I’ve always been impressed by the V-Class’s stopping power and on the autobahn it proved no different, quickly scrubbing off speed whenever anyone decided to overtake a truck in lane one with barely any notice. 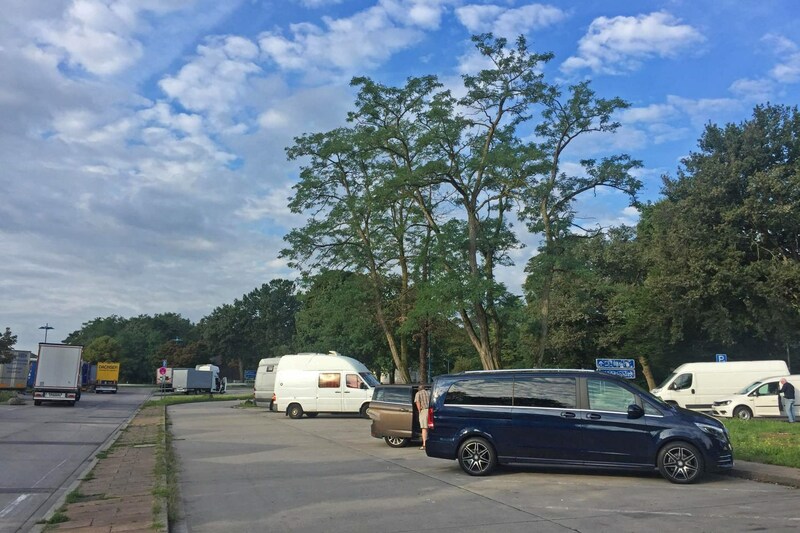 In an ideal world the top of my CV would celebrate my ability to sleep at a moment’s notice, and having enjoyed a couple of rear-row naps in the V-Class in the past, I figured nestling into one of the camper van bays at a German service area would prove to be the ideal overnight kipping zone. It wasn’t. Maybe it was because of the external noise, the lack of blinds to shut out the light, or simply that however comfy the seats were they weren’t as accommodating as a bed, but I just couldn’t get off properly. I still managed to squeeze in my usual five-and-a-half hours, but it was almost 8:00am when I rose, so I’d missed valuable time on the motorway avoiding the Monday commuter traffic. A quick shower, latte and a pretzel later and I was ready for the next leg. I’d barely set off when the V-Class indicated it’d rather appreciate a refill of diesel, the trip computer suggesting that despite those high-speed shenanigans it’d averaged a steady 35mpg. It was also a relief to realise that the majority of the German workforce had already made it to their places of employ, meaning the route to Austria was pleasantly swift. 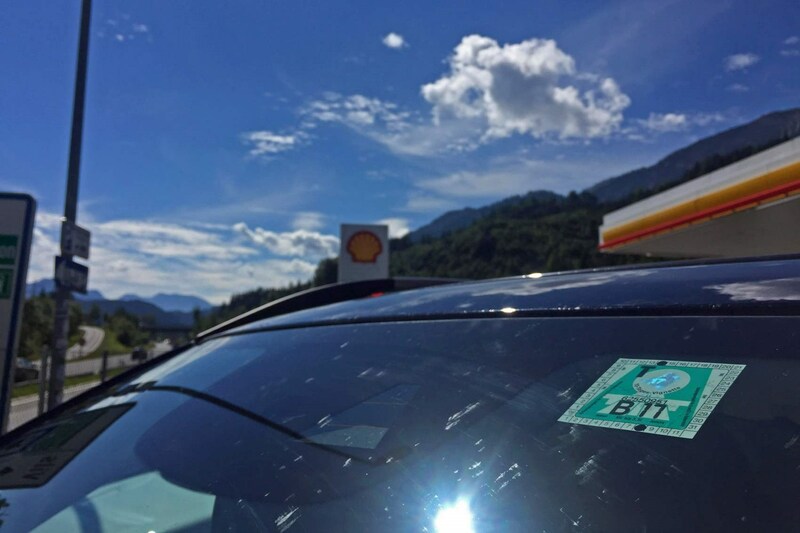 Upon crossing the Austro-German border you’re greeted with a packed service area, with the majority of drivers stopping for a vignette sticker signifying that you’ve paid to drive on Austrian motorways. Vignette applied to the top of the screen I headed for the hills; whichever direction you look it’s archetypal chocolate box scenery, with snowy peaks skirted by verdant lushness. It’s best to absorb it while you can, because you’re in and out of tunnels with a high degree of frequency as you wend your way around the mountains towards Italy. Even without clocking number plates, you can tell other drivers’ country of residence by how they tackle these ever-twistier, ever-undulating mountain schleps - the locals are the ones who overtake based on hope into unsighted bends, while the uninitiated are keeping an eye on the drop down into the valley below. Still, aside from the white-knuckle steering wheel grip and sufficient expletives to make Malcolm Tucker blush, the journey was an enjoyable warm-up to the 48 switchbacks en route to the Stelvio Pass summit that I now faced. I approached slowly - not entirely through choice - as the initial ascent was thick with a swarm of cyclists, it in turn being separated at regular intervals with aggressively charging motorbikers. As the inclines increased, the peloton dispersed meaning there was sufficient space for squirts of acceleration on the short and narrow straights. Dodging on-coming cars in the middle of the road soon becomes second nature, although you’re never entirely comfortable by how close they get. Twirling the wheel this way and that with your left hand, while hovering your right over the horn seems to be the way it’s done. Then came that sickening feeling as a cyclist hurtled towards me with seemingly no braking capacity left. I halted, shut my eyes and waited for the inevitable thud as he hits the Mercedes’ nose... Nothing. I squint out of my left eye to see his reflection getting smaller in the mirror, still wobbling from side-to-side as he sought to regain control. While it might have been out of the V 250 d’s usual territory, it coped perfectly well: 440Nm of torque from just 1,400rpm ensured that it wasn’t a slouch as the distance above sea level increased, but its length combined with an unimpressive turning circle ensured that the hairpins remained tricky. I had to resort to three-point-turns in a couple. The Mercedes’ high seating position afforded a decent view of whether the road was clear around the next sharp bend, allowing me to swing out wide in a manner vaguely reminiscent of Big William’s bus exploits in the original (and best) Italian Job film. Frequently this also resulted in much scrabbling of the inside rear wheel before the traction control curtailed the gravel-spitting fun. A tad over 40 minutes after the ascent began and I was at the summit. It’s a strange place. On one side you’re drinking in the majestic beauty of what nature’s created, your eye-line tracing that wiggly road that led you to where you now stand. Behind you is a mass of bikers and cyclists gathered in a clump, penned in by bustling souvenir stalls. I swig casually from a bottle of Pepsi Max by way of toasting myself, continuing the party as I munch a KitKat Chunky while examining the bodywork for damage and bikers’ lost fingertips. All good. It seems a shame to leave so soon, but it’s not the kind of drive you can afford to hang about too long - my plan was to be heading west across to France before long to begin the drive back to Britain. Descending the Bormio side of the Pass is a little underwhelming after the glory of the drive to the summit. It’s not without stimulation, switchbacks or smiles, but similar to the east coast of Scotland on the North Coast 500, it just doesn’t feel quite as involving. Imagine getting home after a day of excitement and chilling out to Phil Collins - you’re about there. It feels like a slog getting to the autostradas bypassing Milan and Turin, but before long I’m in France. The plan had been to sleep in the car again, but with darkness upon me and wanting to kip reasonably well, I instructed the sat-nav to find me a cheapish hotel for the night. Directions set, I found myself somewhere near Grenoble and in my best French (I took that to AS-level), I secured a room for the modest sum of €65. Coffee and croissanted-up, I’m soon back on the road (with a third diesel refill of the trip), progressing north past Dijon. I never cease to be amazed by the quality - and quietness - of the French autoroute network. Sure, they’re far from cheap, but it seems a pittance to pay considering how swift and unruffled you progress. Kilometre after kilometre of asphalt that out-smooths Leslie Phillips is a small price to pay for having to get out and wander around to the left side car to ping your credit card into the toll machines. 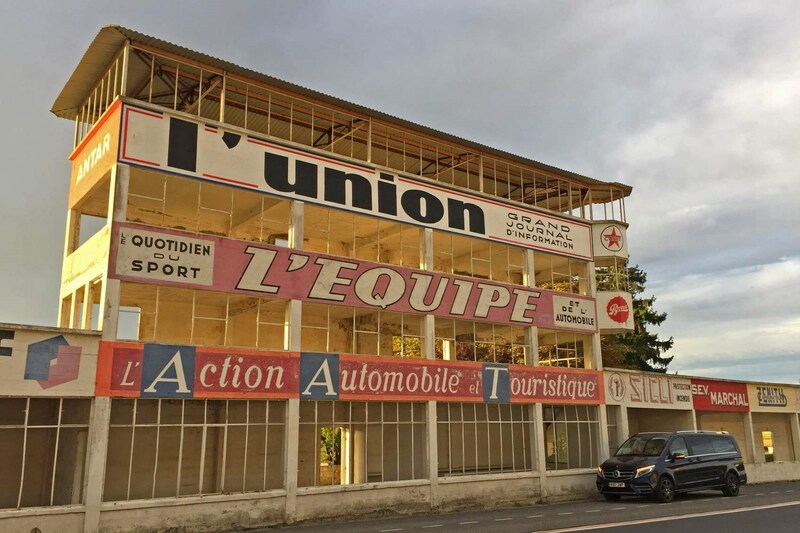 One motoring journalist cliche I’ve happily subscribed to is the pilgrimage to the old pits straight between Reims and Gueux whenever I’m in the vicinity. It’s an evocative place and worth YouTubing some period race footage - quite what Juan Manual Fangio - an F1 winner for Mercedes here back in 1954 - would have made of the V 250 d parked up in his pit box some sixty-odd years later is anyone’s guess. I suspect he’d have been less impressed by me sat on the wall eating my baguette where his mechanics would have once leaned over cheering him on. 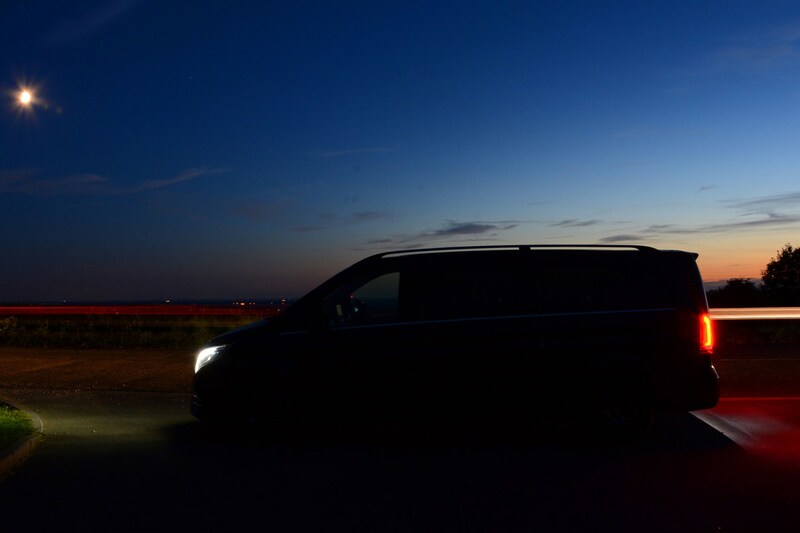 As daylight begins to fall, I’m on the final stretch of the A26 - or l’Autoroute des Anglais - reflecting on how impressive - sleeping conditions aside - the Mercedes V-Class had been over its European jaunt. An indicated 33.5mpg was agreeable, if still someway short of the official claim, and it would have doubtless been lower had there been six passengers and their luggage alongside me for the trip. 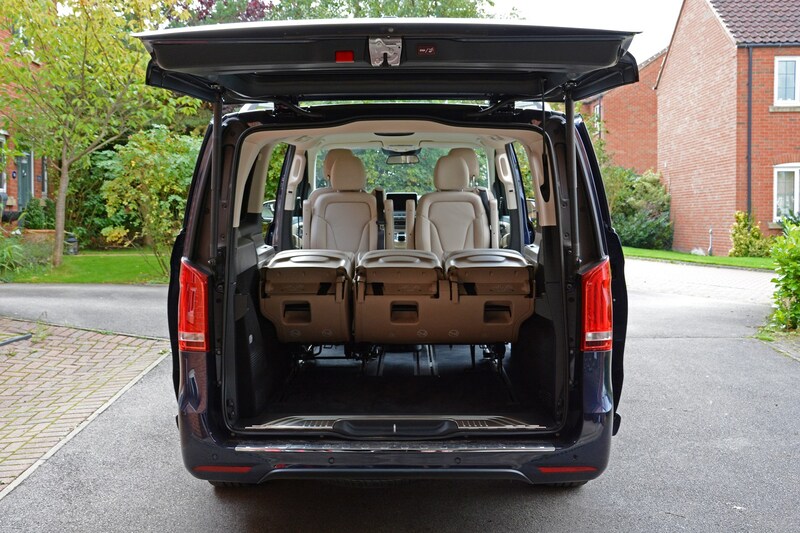 That said, there isn’t another seven-seater that could have managed the journey for seven folk and their belongings in such comfort. It might not have been designed with high-speed Germanic runs or Alpine exploits in mind, but its further proof - if it were needed - that cars are what you make them: for those few days our long-term V 250 d was an intrinsic part of the adventure and the memories it created. If it sounds too good to be true, it usually is – or so the old adage goes. 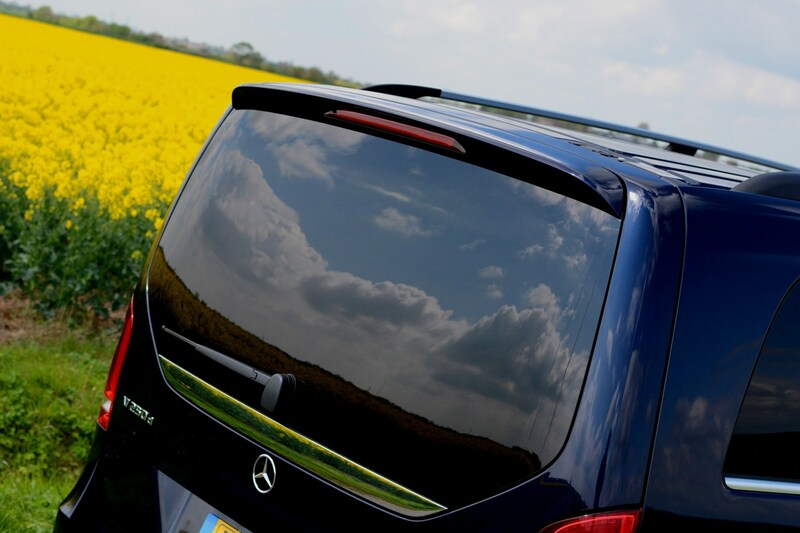 Browse the Mercedes website and you’ll find something that looks remarkably like our V-Class long-termer going by the Vito Tourer name, at a substantial cost saving. Too good to be true? 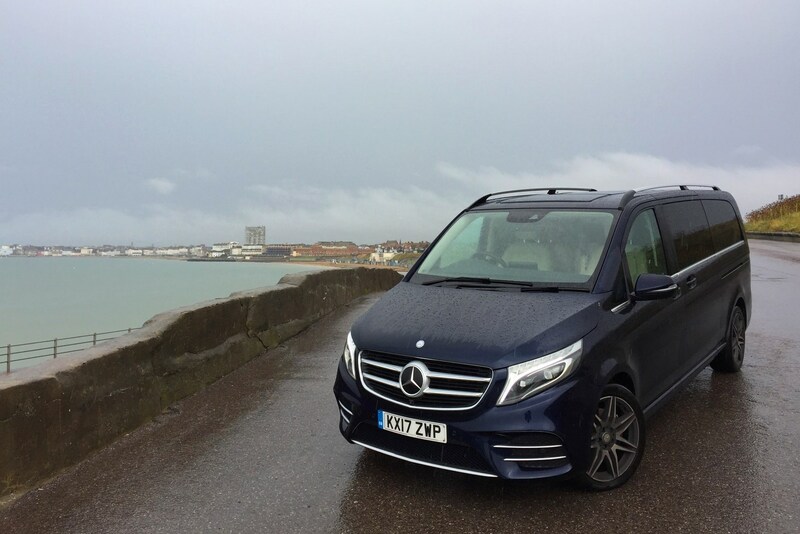 What is the Mercedes-Benz Vito Tourer? 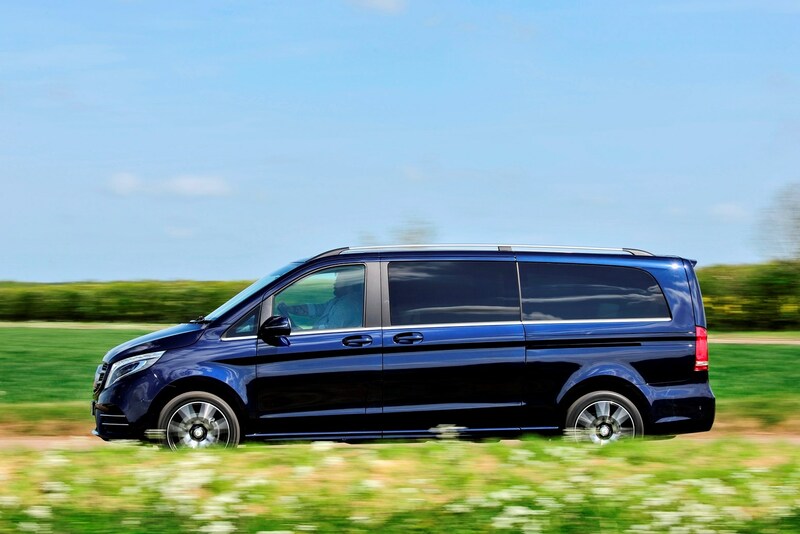 Okay, prepare to be confused: the V-Class is a luxuriously appointed seven- or eight-seater car based on the Vito panel van. 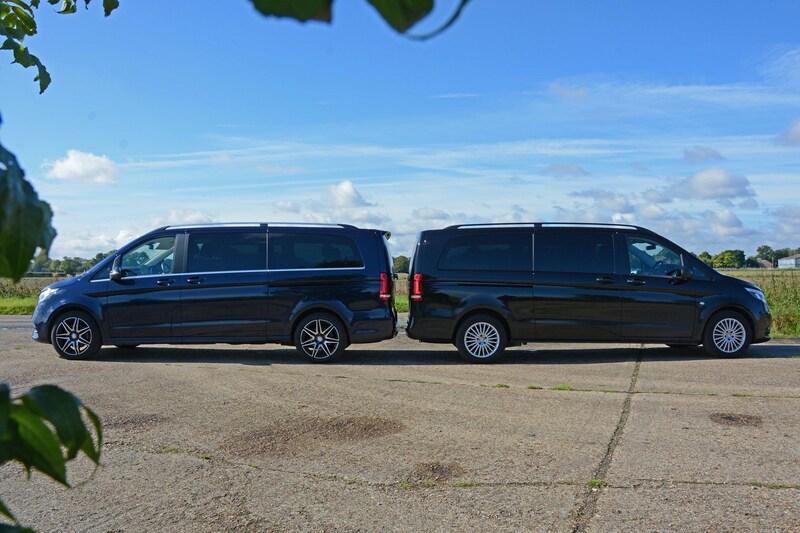 The Vito Tourer is a less lavish version, with seven, eight or nine seats, sold through Mercedes’ van dealer network. Think upon it as a [whispers] minibus version of the panel van and you’re about there. 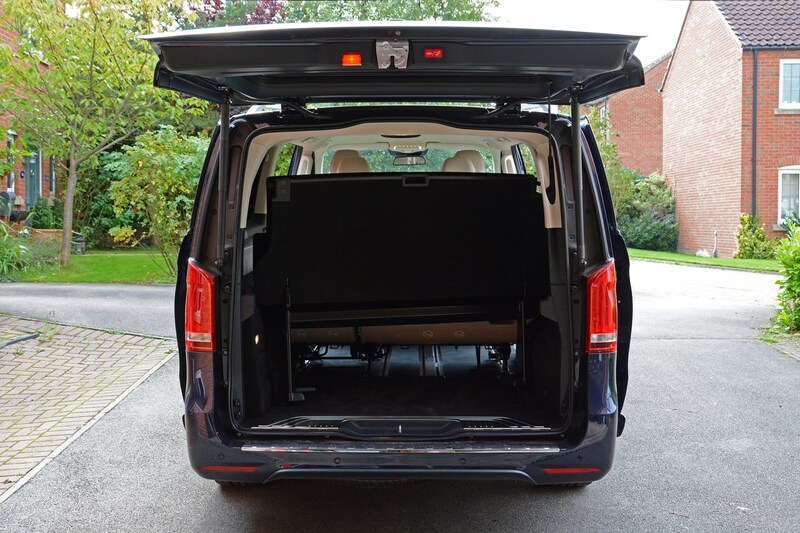 Externally, there’s little to separate the two, with identical Extra Long bodywork, window apertures, doors and roof rails (although they’re black on the Vito Tourer, and a £360-plus-VAT option). The only marked difference is the more aggressive bodykit our AMG Line specification V-Class is sporting. 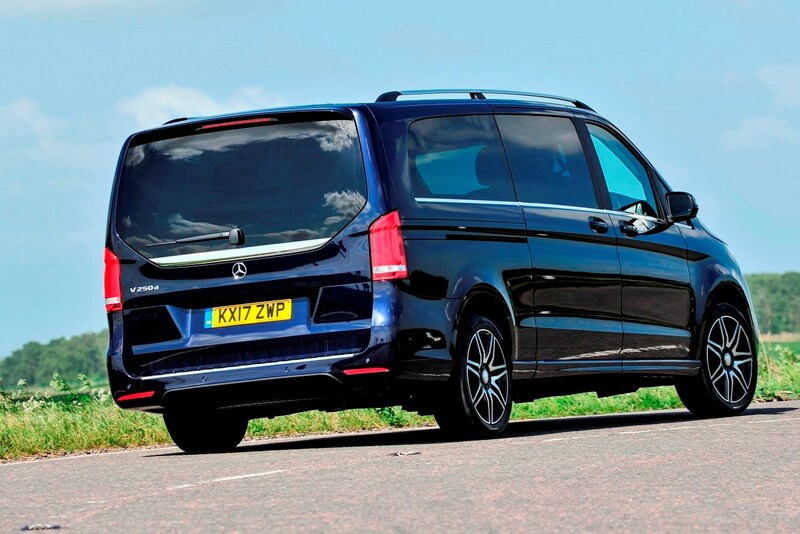 So what’s different about the Vito Tourer? 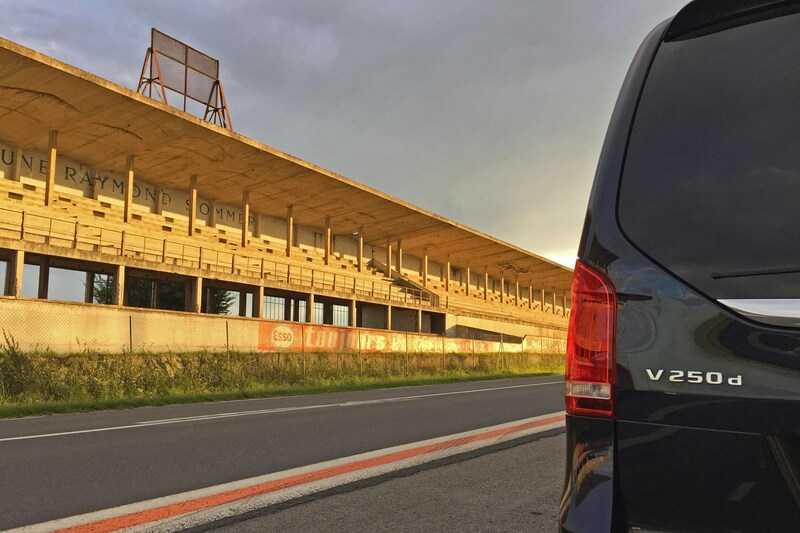 In order to preserve the plusher ambience of the V-Class, the Vito Tourer has a dark, less appealing cabin that matches that of its van twin. 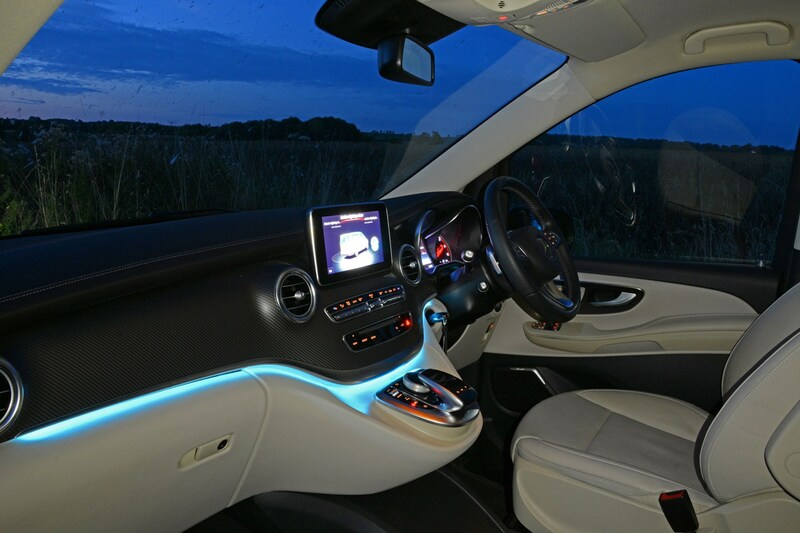 Gone is the C-Class-aping swoopy dashboard with its iPad-alike multimedia screen, its place usurped by a cliff-face of tough black plastic, with switchgear largely borrowed from a mixture of less expensive and previous-generation Mercedes cars. The Vito’s multimedia screen – and its operation in particular – feels like a step back to 2007. 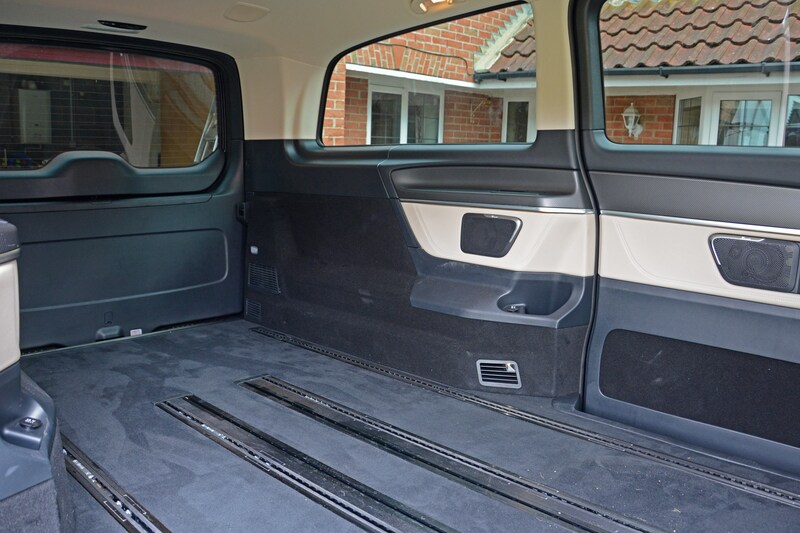 This Vito Tourer’s in range-topping Select trim (it sits above standard and Pro), but it feels decidedly downmarket compared with our V 250 d. There’s dreary cloth trim instead of soft nappa leather, although the Select does have carpets instead of the vinyl flooring on cheaper models. 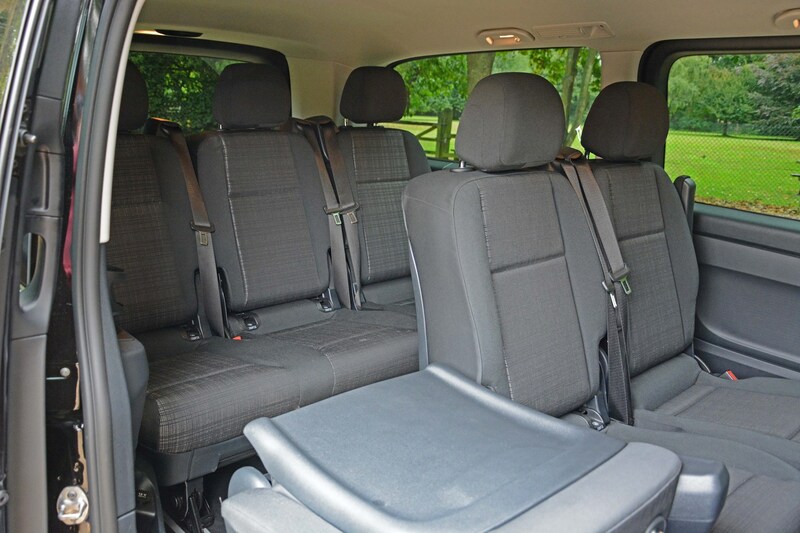 It's worth noting that the front seats adjust manually and that Tourers lower down the Vito hierarchy have a cosy twin-berth front seat, hence the aforementioned ability to carry nine passengers. 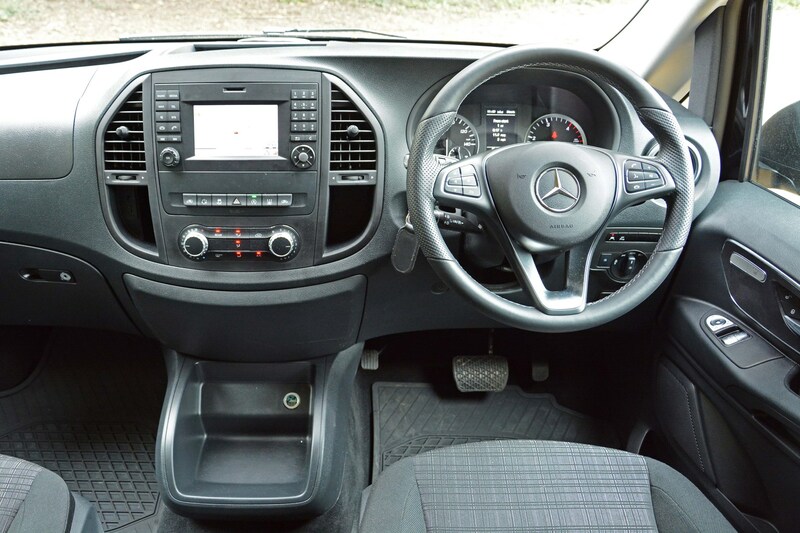 There’s a wealth of options fitted to this particular Vito that come as standard on the V-Class, including electrically sliding side doors (£460 per side), rear privacy glass (£450), LED lights front and rear (£1,425), air-con in the rear – albeit a manual system – (£695) and heated front seats (£130 per side, or £65 per cheek). Being a commercial vehicle, all of those prices require VAT adding at a rate of 17.5%. 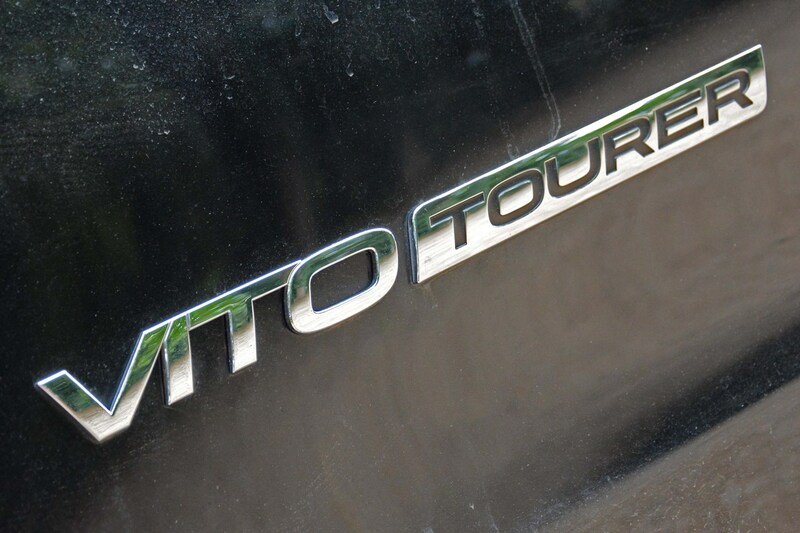 Is the Vito Tourer like the V-Class to drive? Likely to the dismay of V-Class drivers, the Vito Tourer feels more-or-less identical to its more expensive cousin out on the road, riding with a similar degree of comfort. Pace feels on par, too, largely because this Tourer’s a 119CDI – Mercedes van-speak for the 190hp 2.1-litre diesel installed in our V 250 d.
As with the V-Class, it also sends its power to the rear wheels (entry-level Vito Tourers have a 1.6-litre diesel and front-wheel drive) via a seven-speed automatic transmission (manuals are also available lower down the Vito food chain). 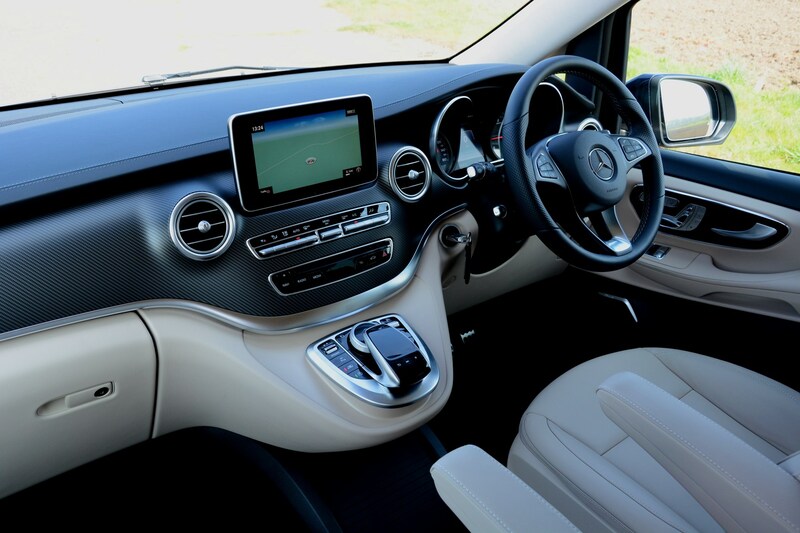 Driving both Benzes back-to-back the most immediate difference you’ll appreciate is that the Vito has a standard cruise control system, whereas the V-Class has the optional Distronic Plus adaptive package that monitors the gap to vehicles in front adjusting its speed accordingly. Go on then, how much dearer is the V-Class? 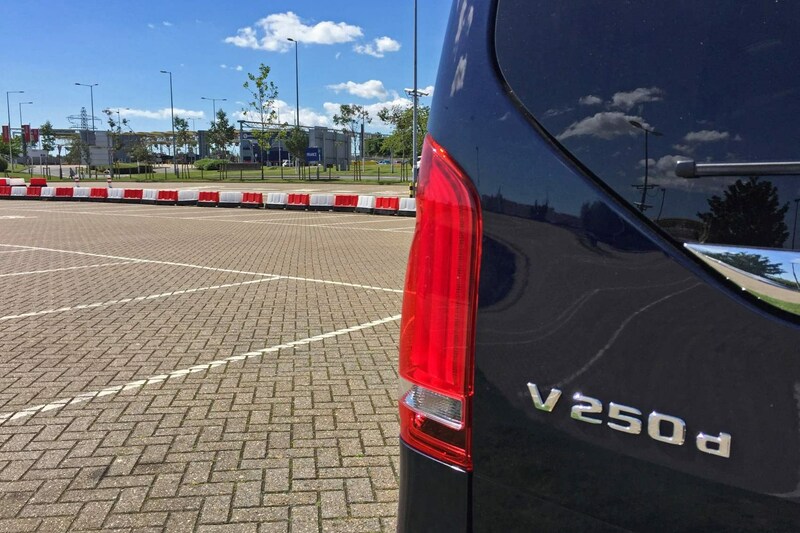 There’s no escaping that the V-Class is an expensive MPV to buy: our V 250 d AMG Line Extra Long weighed in at £52,470 before options, rising to £58,260 with a selection of useful extras fitted. That said, if you can afford the outlay, you do get a huge amount of metal – and space within – meaning high-spec Ford Galaxys and Volkswagen Sharans look worse value in the low £40,000s. So how much cheaper is this downgraded alternative? 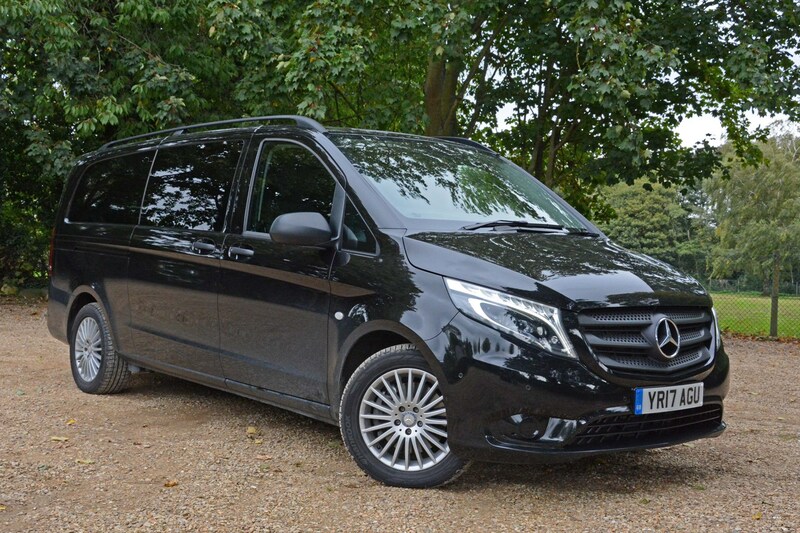 Before options, the Vito Tourer Select 119CDI Extra Long has a list price of just £33,415. Ouch, that’s quite a saving. Oh! I forgot about the VAT – now the saving doesn’t look quite as attractive at £48,833 – or a shade under £10,000 with both Vs specced as they are. Sure, you can have the most basic Vito Tourer Compact for £29,328, but that’d be a rather miserable – and slow – driving experience. Too good to be true? Indeed it is. 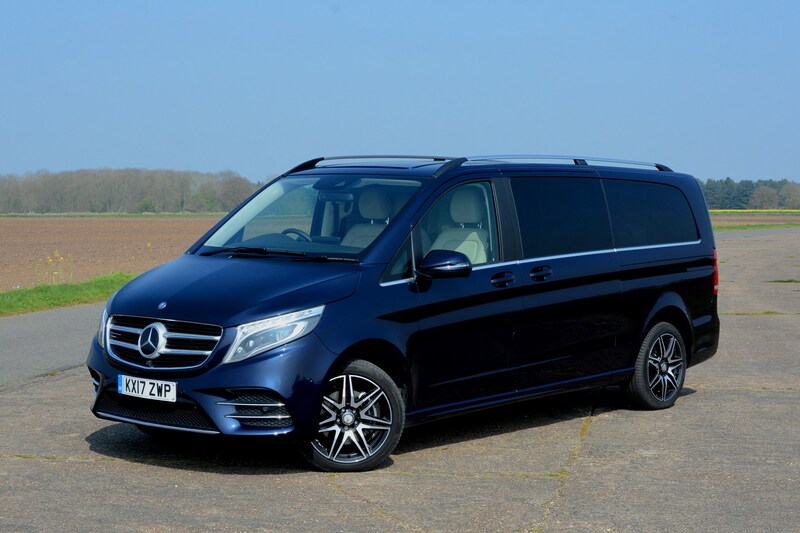 The V-Class is so much nicer than the Vito Tourer inside that we’d still recommend the ‘car’ version over its cheaper ‘minibus’ alternative if you can afford the difference. 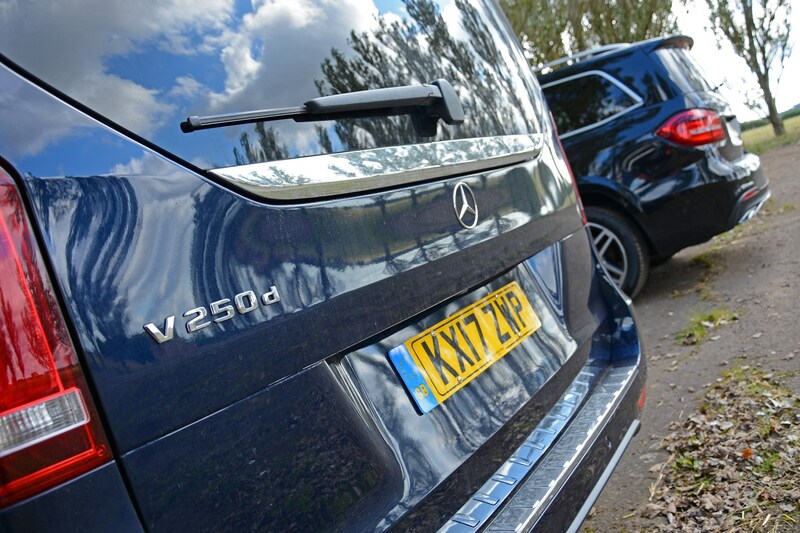 And if you can’t, go for a nearly new V-Class instead of a box-fresh Vito Tourer – you won’t regret it. I’m unusual among my male peers in that whenever I buy a new piece of electrical equipment or flat-pack furniture, I pore over the instructions at least twice before I begin to use or assemble my purchase. Cars I handle differently, though. For me they should be intuitive and – frequently jumping from one make and model to another – it seems that by and large they are. Maybe I was spoiled by the ease of converting my previous Citroen Grand C4 Picasso long-termer from a seven-seater to a makeshift van, but the V-Class seems wilfully awkward to switch from being a people- to stuff-carrier. After a few weeks with the Citroen I’d sussed the knack of lowering all five rear seats into their respective floor wells in under 60 seconds. Self-evidently, with its adult-sized seats, substantial frames and no function to fold them away into the floor, meant they were going to have to come out. How hard could it actually be, particularly if I don’t refer to the owner’s manual..? If I say that it would have felt entirely appropriate to have Gordon Burns commentating on my endeavours such was the Krypton Factor-degree of challenge involved, you get the idea. Shouldn’t be too hard, then. The rear parcel shelf was selected first for removal, as I’d decided working from the back forwards at least had logic at the heart of the undertaking, based on nothing more than this was how the aforementioned Citroen worked best. 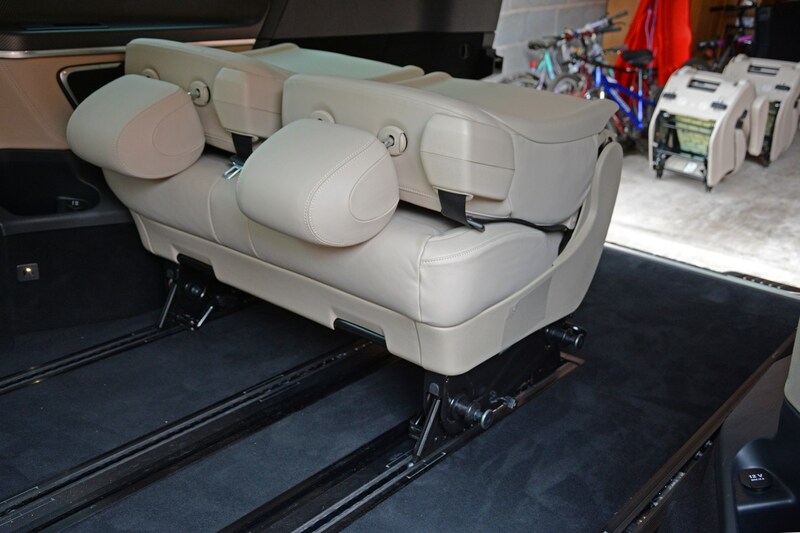 It’s supported by two metal legs, each with a catch that requires a 90-degree turn to unlock the feet from the same rails the seats lock into. That was the easy part – manoeuvring it out proved trickier. Fortunately I quickly twigged that in order to get it turned to aid its removal, I’d need to fold the third-row seatbacks forward. Huzzah, it was out. Unfortunately, it’s feet are too small to keep it balanced when free-standing, so I then had to clear some garage space in order to prop it against a wall in there. 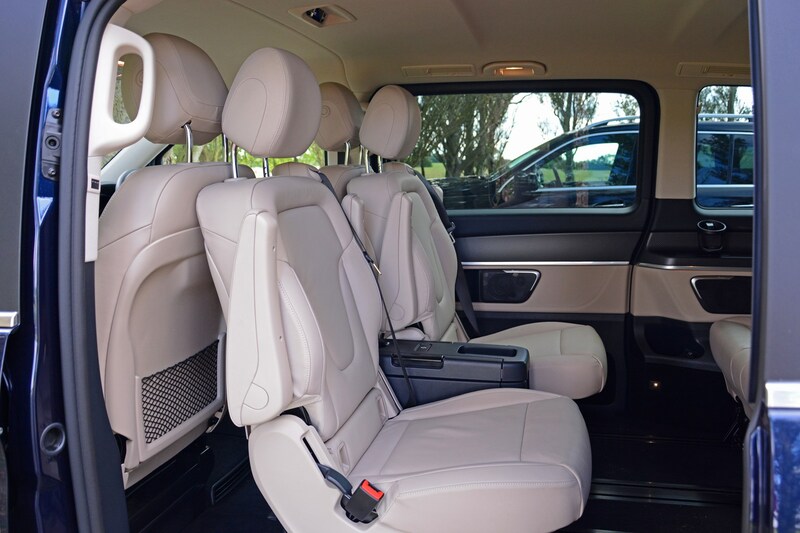 Releasing the levers at the base of the third row seats confirms that the single seat on the nearside of the V-Class only has legs on one side for clipping into the rails – the other side attaches to the two-seater part of the assembly. Trying to remove it immediately highlights a problem: as it tips forward in its folded state it fouls the middle row seat in front of it. This necessitates a change in tack – the middle-row seats will have to come out first. This should be straightforward, releasing the levers at the back to tip them forwards, before unclipping the clips at the front of the seat from the rails. Spoiler alert: it wasn’t straightforward. The armrests foul the pop-up table meaning the seats won’t tip forwards as required. Aaargh. So that has to be removed before any of the seats. How the table comes out isn’t immediately obvious as there are no release handles on it. Sliding it backwards on forwards on the rails eventually reveals a couple of plastic infill sections on the metal tracks – perhaps removing them enables it to be released? A quick hunt around for a suitably broad flat-head screwdriver soon prises out the polymer pieces and by moving the centre of the table over the gaps allows for a slot large enough for the retaining pins to be freed. 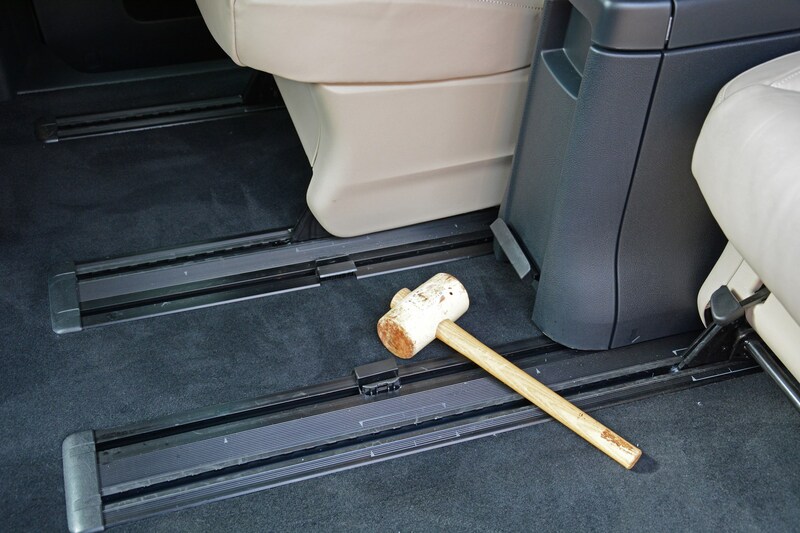 Here on in, it’s relatively easy to figure out – you just need the strength of Geoff Capes at his prime to lift the chairs out of the car and walk them to a suitably large space to store them in. Middle row seats out, I then tackle the single part of the rear bench. As expected, it’s now a (relative) doddle with space to stand inside the car to further ease its removal. Which leaves the two-seater bench. In theory, it’s easy to remove because it works exactly the same way as the other seats. In reality, you need the strength of two Geoff Capes, both of whom had consumed Popeye’s annual spinach quota for breakfast. Geeez it’s heavy, but just about manageable – I suspect the manual suggests that removing it is a two-person job, so stick with that advice. Four carpet-burned knuckles, one broken nail and 90 minutes after I started and the V-Class has become a two seater van. Albeit one with windows and carpets. It’s inescapable how, plushness aside, it really is like a Vito in the back and, unsurprisingly, it drives more like one without the seats in it. 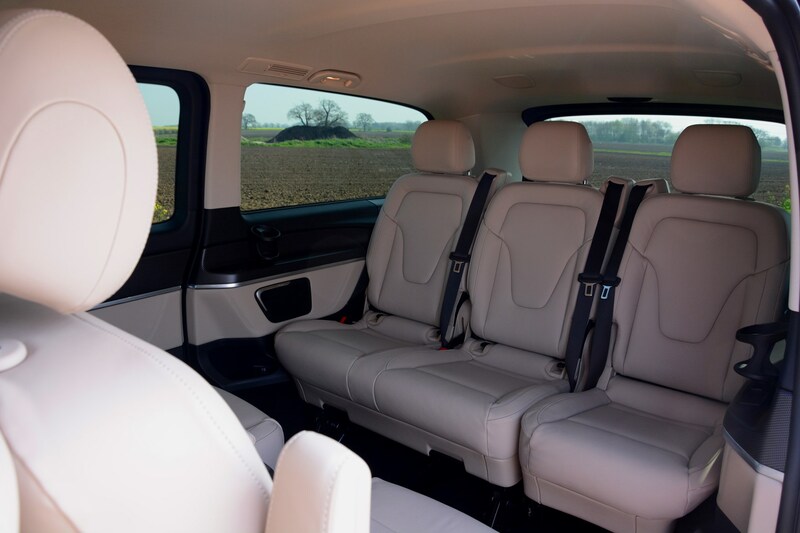 The V-Class rides best when it’s full of people, meaning without even the weight of the chairs in the back to press down over the rear axle, the ride’s rather jittery over poor road surfaces. But unlike its commercial vehicle cousin, it’s remains pleasingly quiet and refined – presumably the carpets, interior side panels and headlining absorb a significant amount of the noise that typically make large panel vans akin to mobile echo chambers. A strong, sweet cup of tea swilled down and an industrial-strength truss donned, I was ready to lift the two-seater bench back in. That was the easy bit – reattaching it to the clips in the rails was significantly more of a faff. In my haste to remove it I’d twisted the seat, meaning that the rail clips were no longer aligned. They’re formed by two transverse bars and a longitudinal spring clip behind. Initially, I tried to shuffle the errant one back into place by clipping the front of the seat into place, but it resolutely refused to budge, meaning the rear seat clips were coming down at an angle on top of the rails rather than satisfyingly slotting into the gap between them. I then remembered seeing a funny-shaped plastic handle when I’d been poking around the V-Class some weeks earlier and not knowing what the component was for. Re-familiarising myself with it, it was immediately obvious it allowed the rail clips to be moved by pressing down on the release spring at the trailing edge. Thinking ahead I checked all the remaining rail clips were aligned with each other and soon had the rear bench re-assembled. See, I’m not as stupid as I look. Re-attaching the middle-row chairs is equally easy, despite this time they’re being faced forwards. Once in, it’s immediately obvious how much more space efficient this arrangement is for passengers in this and the back row, with the downside of it being much less sociable. 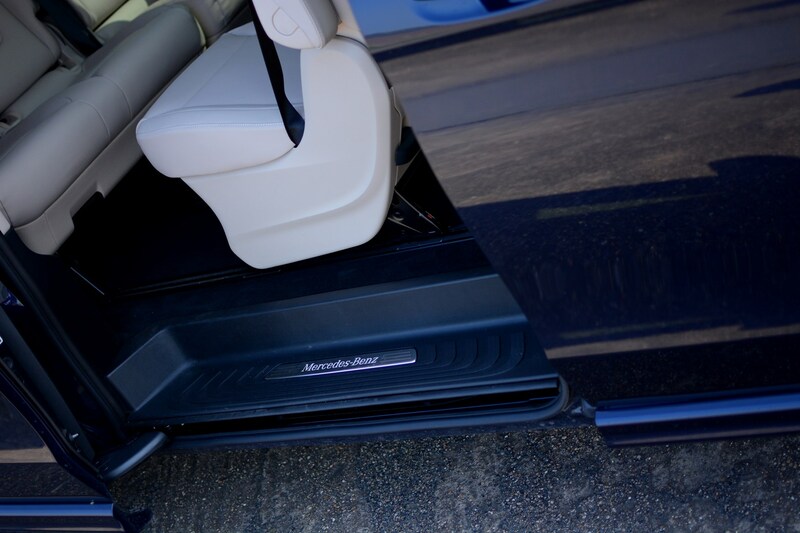 It also makes the rear of the passenger compartment feel darker, plus it’s more of a hassle getting into the third row: the middle row seats have to be tipped forwards to allow access – one of the few manual actions in the Mercedes. Slotting the table back in is a relatively quick process although you’ll need a mallet or hammer to press the plastic widgets back into the rails – the heel of your hand and a hefty shove is unlikely to be sufficient. 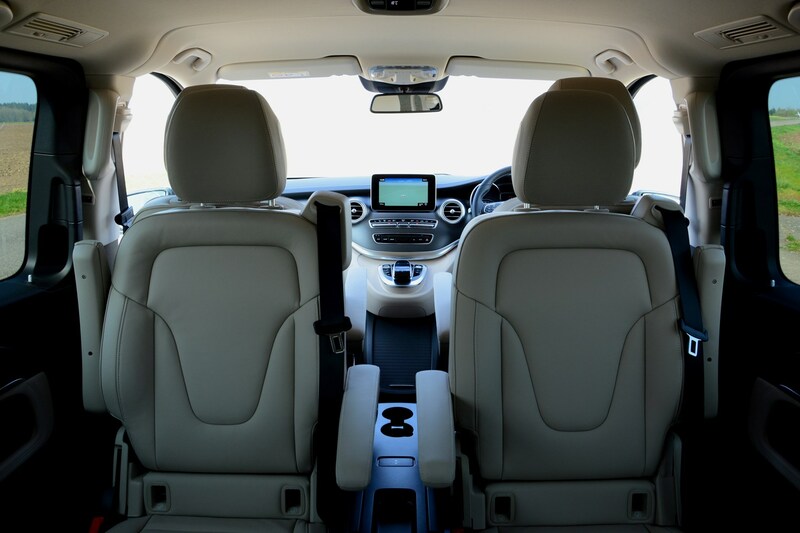 Tip the third-row seatbacks forward – see, I remembered – and the parcel shelf is soon cajoled back into place. Its feet locked and I stop the clock: 38 minutes. Herein lies the most significant flaw I’ve yet discovered with the V-Class: yes, it’s great at carrying people and their luggage, but genuine ease-of-use flexibility is not something that’s intrinsic to the Mercedes’ design. 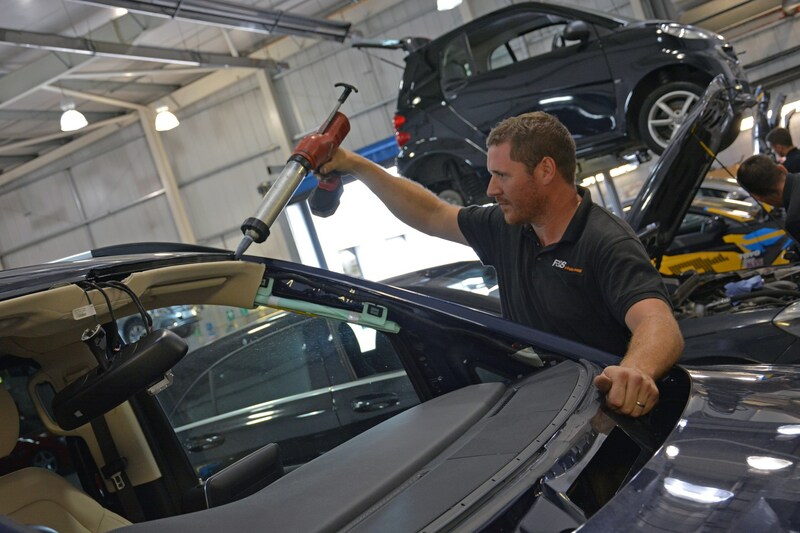 I suspect with a few more practice runs I could nail both the seat removal and reinstallation in 20 minutes apiece – quicker still with an assistant – but you still have the hassle of storing all the components somewhere, and they take up the space of, well, the back of a V-Class. Digesting the contents of the manual may well have quickened the process as well. My advice: choose a seating arrangement that suits the needs of your family best and from that point onwards pretend to anyone who asks that the seats don’t come out. Easy life. If, like me, you’ve whiled away many a lunchbreak poring over the Mercedes website and configuring different permutations of model, one thing won’t have escaped you: despite the demise of the MPV as we came to know it from the early 1980s, there are four seven-seater options within the brand’s car range. The latest E-Class Estate sees the return of the rear-facing child-seat option, while the GLE SUV (nee M-Class) can also be specced with an extra set of seats that appear suitable for teens. So, alongside the V-Class, the only other Mercedes car capable of ferrying about seven adults is the gargantuan GLS SUV. More disparate these two three-pointed star-wearing leviathans couldn’t be. Remind me, what’s a GLS again? If you’re still unfamiliar with Mercedes’ revised nomenclature, the GLS is the gently facelifted and renamed GL-Class. Since 2015 the GL prefix signifies the car is an SUV (apart from on the flagship G-Class which remains, err, G-Class) with the third letter representing the size of the car in more traditional Mercedes ‘Class’ terms, the GLA being an A-Class-sized crossover. So, the GLS is the S-Class-dimensioned SUV, which is more or less true, but the feel inside is more like previous-generation E-Class, but more of that later. 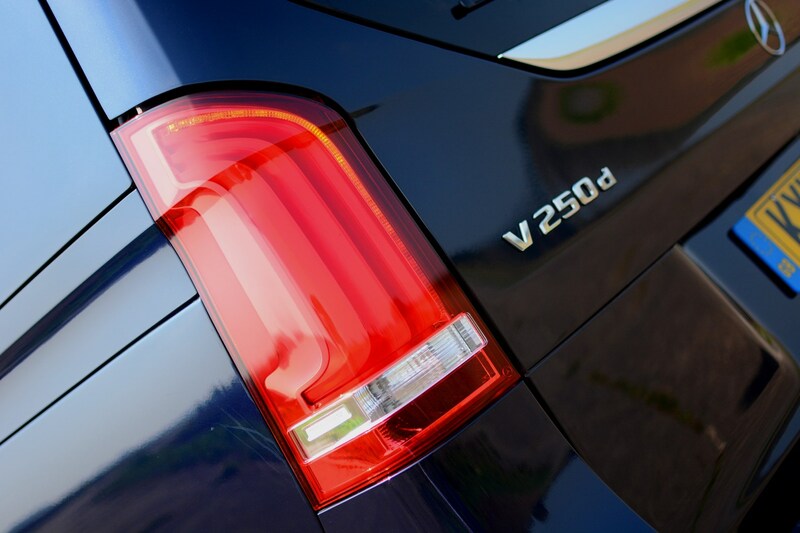 Remember clarification in an early V-Class update about how the 250 d part of its model badging meant it had a high-power 2.1-litre diesel? 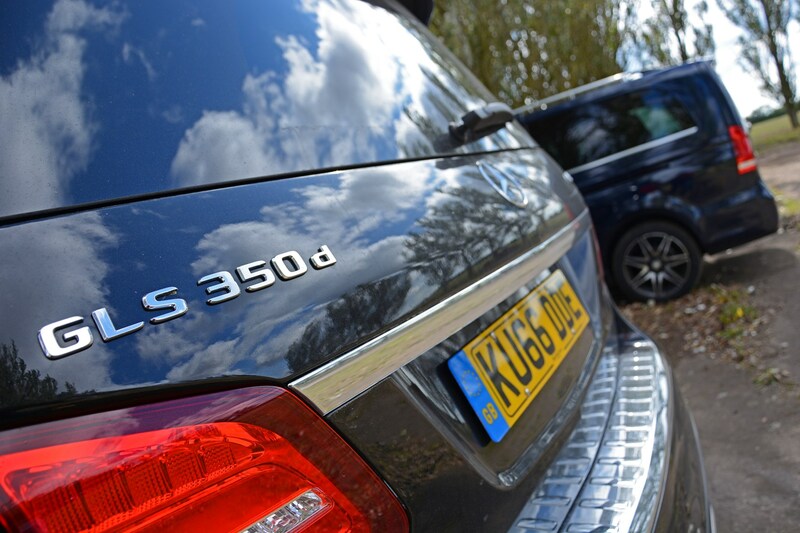 Well, there’re similar naming convention shenanigans here: this GLS 350 d is propelled by a 3.0-litre V6 diesel, producing 258hp and a walloping 620Nm of torque from just 1,600rpm. Despite weighing 300kg more than our V 250 d largely thanks to a robust four-wheel drive system, this GLS can scorch to 62mph from a standstill in 7.8 seconds and on to a top speed of 138mph. The V-Class is quoted at 9.1 seconds and 129mph for the same benchmarks. That heft – and more power – inevitably means the GLS is thirstier, but probably not by as much as you’d think. 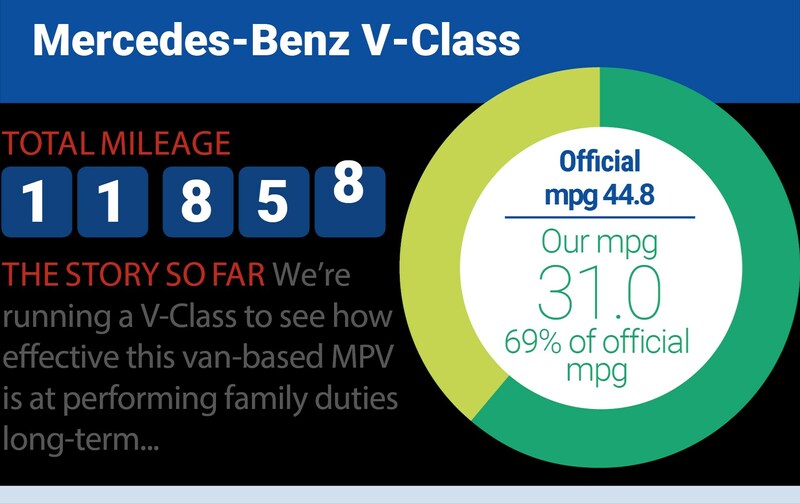 So far the V-Class has averaged 31.3mpg versus a claimed 44.8, while the GLS returned 29.6mpg against its official figure of 37.2. The SUV’s more modern, efficiency boosting nine-speed automatic gearbox doubtless helps here, with two ratios more than the V-Class’s transmission. More stark than the performance differential is that the GLS highlights how much more van-like (there, I’ve begrudgingly admitted it) the V-Class is to drive, in terms of ride, handling and driving position. Similar to – but certainly not as agile as – the S-Class, the GLS feels isolated from the environment, its air suspension system, with different firmness settings, cushions the blow of ruts in the road, while the steering offers little by way of feedback. It’s a little disconcerting at first, but gradually you learn to embrace its land-yacht demeanour. 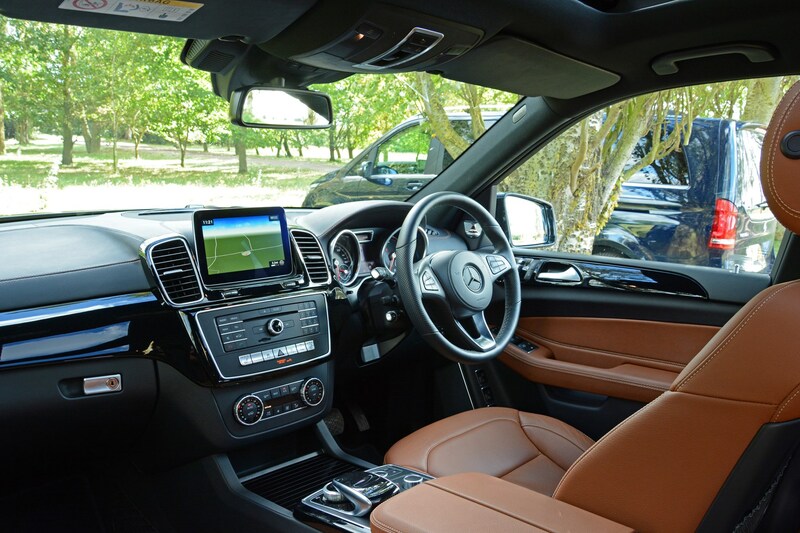 You also feel sat in, rather than perched upon, the driver’s seat, despite how high your eyeline is, making you feel more at one with the GLS than you every do the V-Class. Body roll is kept much more in check, too, giving you more confidence to press on, especially on windier country roads, despite the sensation that you’re piloting something akin to Nelson Mandela House. Another contrast is how the two Mercedes behave when loaded with passengers: the V-Class becomes much more settled and less jittery than when it’s the driver alone in it, but the GLS’s changes are much more subtle, as it rides so sveltely even when there’s only one person in it. 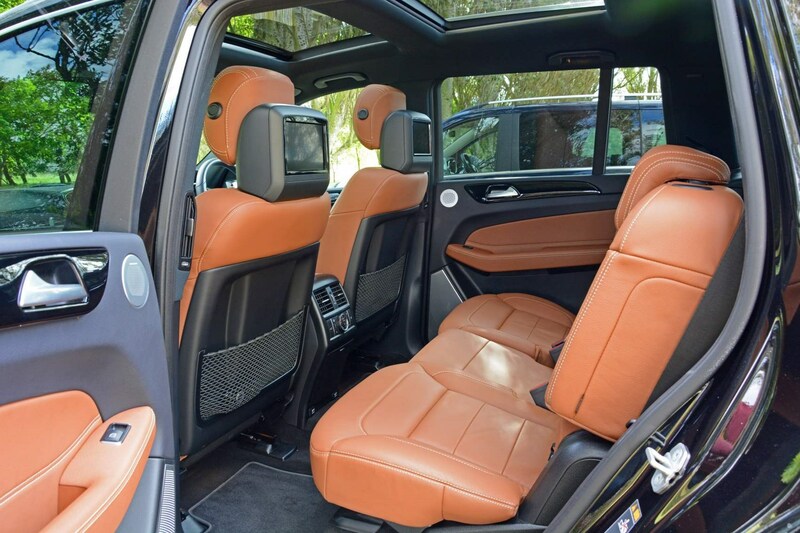 Inside, the V-Class and GLS are like chalk and cheese, and not just because of the respective colours of their leather upholstery. Therein lies one tactile difference, with the V 250 d’s Nappa leather feeling softer than the GLS 350 d’s rather ordinary hide. I had to double-check the spec sheet as initially I thought it was Mercedes’ man-made Artico alternative, such was the latter’s texture. 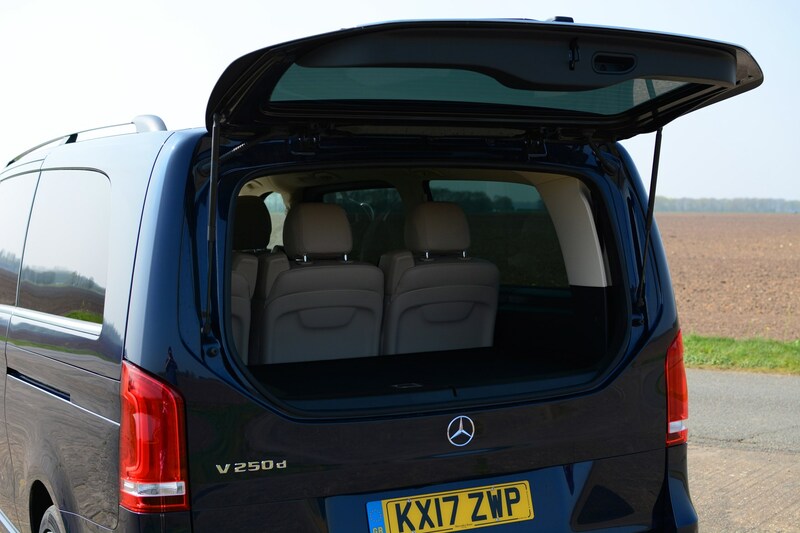 Thanks to its perpendicularity (as well as its pale hued hide), the V-Class feels – and is, self-evidently – the most spacious and easy to access, thanks to its sliding doors. Having the middle row of seats facing backwards also means that nobody has to be inconvenienced when getting in or out. By contrast the GLS’s middle row is spacious for two and a bit of a squeeze when sat three abreast, but there’s ample head and legroom. It’s the third row where the SUV is less convincing: not only is access more convoluted with a two-stage process to fold and then tip the outer second-row seat, the pair of chairs back there simply aren’t as comfortable as the sixth and seventh passenger would experience in the V.
They’re shorter in both the seat base and backrest, but there’s space for adults to cope with a long journey. Those up front will spot the GLS is less of a contemporary Mercedes than the V, with a dashboard that’s reminiscent of that found in the previous-generation E-Class and CLS ranges. 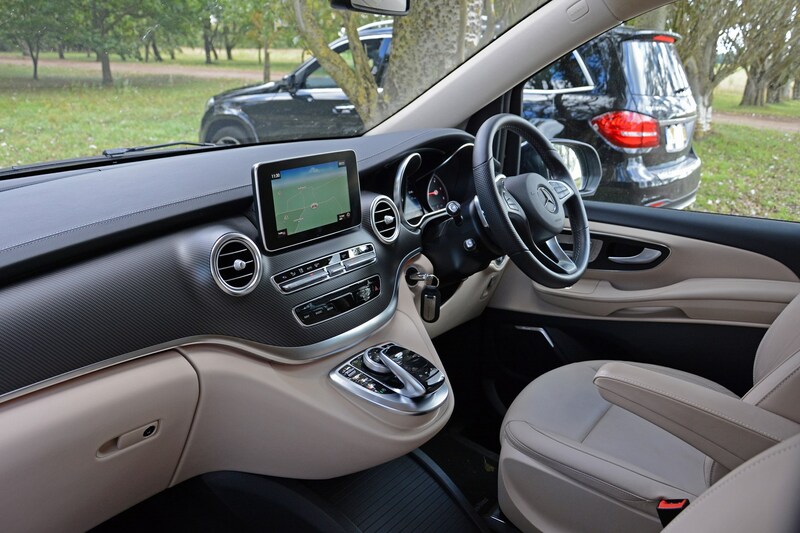 By contrast the V-Class is more akin to a contemporary C-Class, with more pleasing controls and a larger central screen between the analogue instruments. 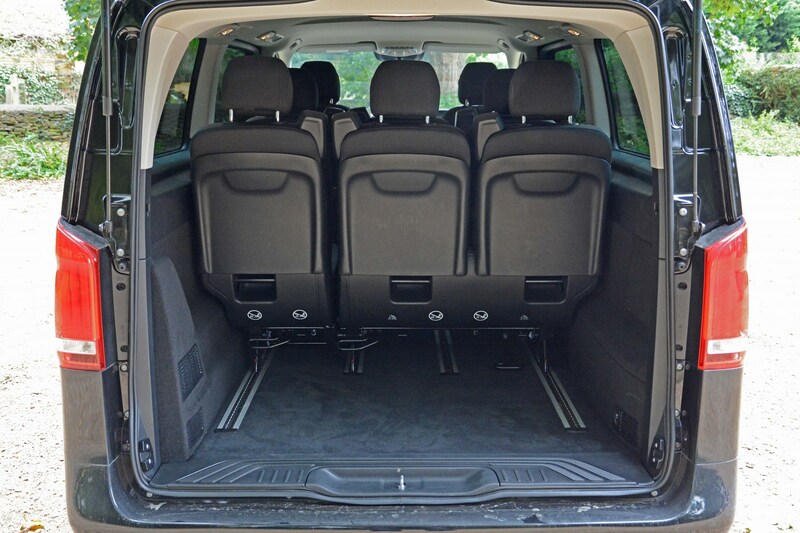 Once again the V-Class’s commercial vehicle provenance comes to the fore meaning you can carry seven passengers and their luggage, while in the GLS you, well, can’t. In fairness, you can’t in other similarly sized SUVs either, but there is still 295 litres of space in the boot with all the seats in use – that’s similar to a supermini. As and when you need to extend the space and sacrifice a couple of seating positions, the third row folds down (and rises up again) at the touch of a button. 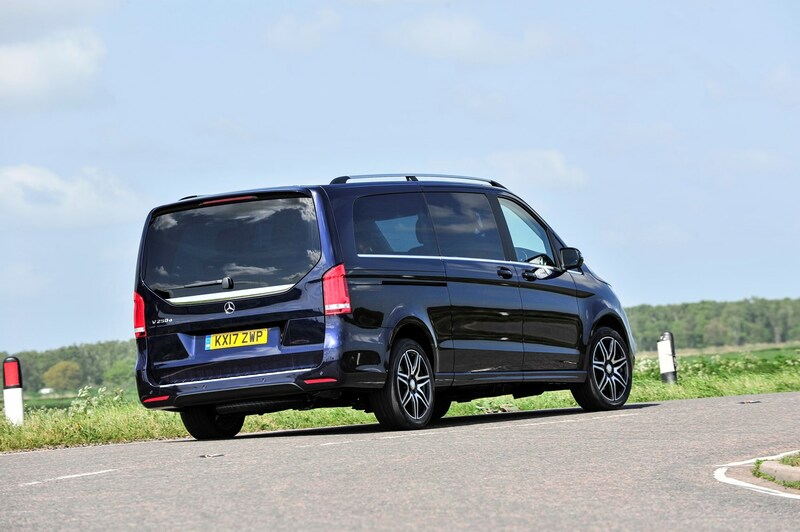 Still, the V-Class can’t be beaten and with its low loading-lip and tailgate glass hatch it simply rubs in its dominance over the GLS in the practicality stakes. One aspect I’ve not mentioned is the question of price, which somewhat skews the outcome. 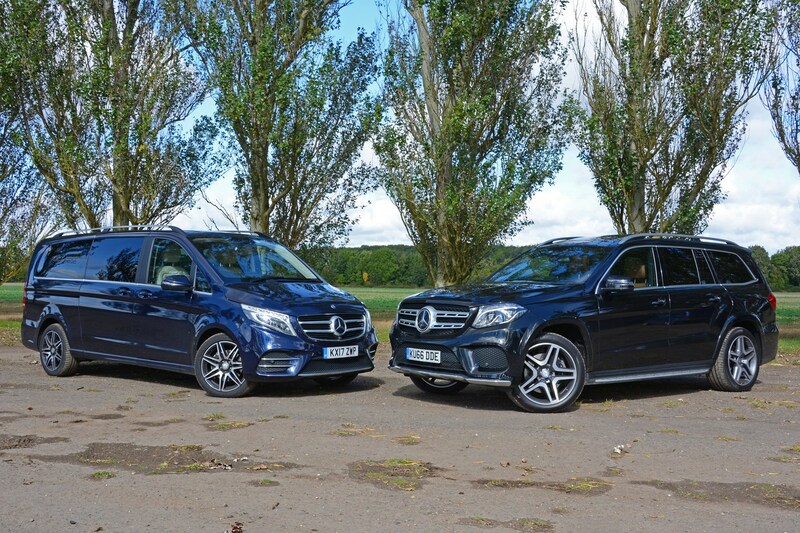 Forget optional extras and at £69,860 the GLS is over £17,000 more expensive than the V-Class. Which is best depends upon your primary needs. If carrying seven people and their luggage in comfort is the most important aspect for your Mercedes then the V-Class wins hands down. But that’s not to say the GLS is superfluous to requirements: it’s more comfortable in terms of ride quality, it feels more like a luxury car to drive than the V-Class could ever hope to and has the sort of gravitas as you drive along that makes you feel imperious. Yes, it can carry seven adults, but that’s not its chief remit. So, which would I go for? 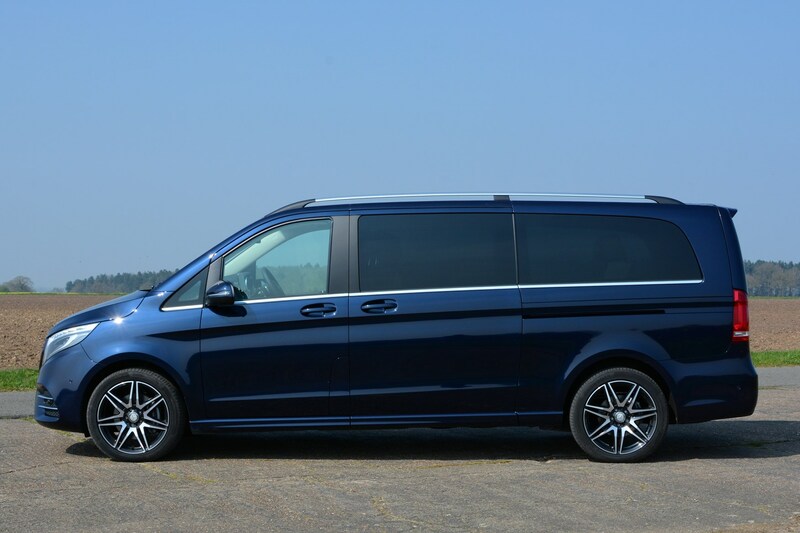 Easy – the V-Class has got under my skin because of how well it performs its people carrier role, so I’d buy one of those and hunt down a swanky E-Class Cabriolet (A124 generation) to buy with the change. You’re in a unique – and fortunate – bubble as a car journalist, constantly being exposed to freshly-minted motors and the scything blade of cutting-edge automotive technology. If one were so minded, it would be easy to become blasé about these opportunities and take such advances for granted, assuming that what had become one’s norm mirrored everyone else’s. That’s one of the reasons I enjoy taking family and friends out in cars that I’m testing. And I’m not talking about just high-performance exotica or plushly-lined luxury cars, it’s the mainstream market cars that most of us buy with our own money – and that’s what makes the views of non-car enthusiasts so fascinating. Demonstrating motoring technology to someone for the first time is the nearest experience I have these days to when I was a teacher: that open-mouthed wonder at the moment of realising what’s just happened is as close as I get now to hearing that metaphorical penny drop when a pupil ‘gets’ something. And so it was recently when I was ferrying a couple of, let’s say ‘senior’, relatives around in the long-term V-Class. Both of them have wits sharper than a surgeon’s scalpel, but they’re hardly car people. In fact, their current purchase was a supermini bought new 17 years ago and still running (surprisingly) strongly. 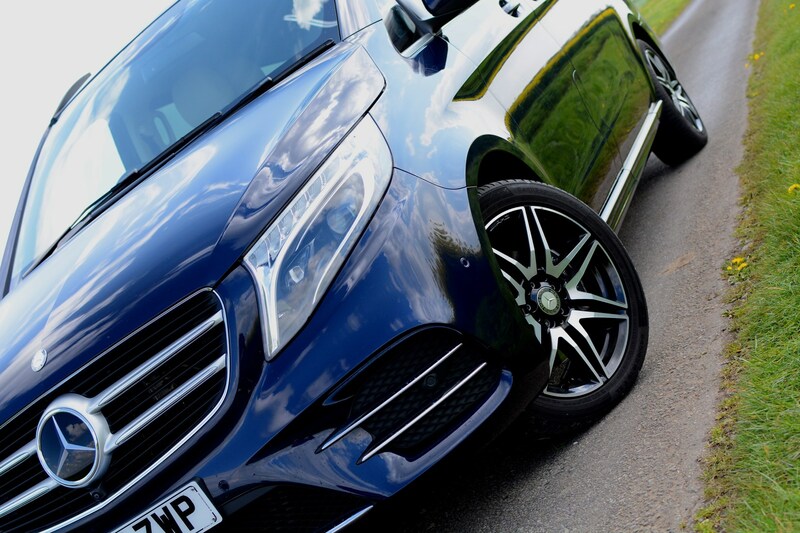 Suspicions were that they’d marvel at the Mercedes’ space given the diminutive dimensions of their small hatchback, but what would they make of the V 250 d’s party pieces such as the 360-degree camera system, adaptive cruise control and automatic main beam? After all, they’re widely available aspects of technology these days, but to my passengers they’d be a whole new world. Once aboard – and roominess remarked upon, as per expectations – we set off, with the inevitable catch-up chatter that comes from not seeing relatives for an embarrassingly long time. As it became duskier I was jolted by a shrill ‘ooooh! Look at these fancy orange lights’ from behind. My initial assumption was a passing car with pulsating indicators, but no, it was the V-Class’s LED ambient lights that had caught my passengers’ attention. ‘Mercedes calls that colour Solar,’ I ventured, turning the brightness up as I did so. In truth it’s more amber than orange, but they were re-engaged. ‘Watch this,’ I teased as I tweaked the rotary controller on the dash to switch it to Neutral (or white as most of us would call it). ‘Because this is Polar,’ I retorted flicking to the third and final of the V 250 d’s ambient choices, an icy blue. The joy from the back of the vast cabin was bordering on the unbridled variety. At that moment I had a penny-dropping moment of my own. You see, back in the office we inevitably talk cars. A lot. And frequently that conversation relates to what we often perceive as superfluous technology. Show us a press-release about a 64-colour ambient lighting system and I’ll show you a potential gold medal-winning team if Eye-Rolling ever becomes an Olympic sport. Such a raft of colour choices might not be necessary in the slightest to how a car actually functions, but if it helps capture the interest of someone who otherwise might not give a flying fig about a particular car, then this spectrum selection is wholly justifiable. It’s rather like Mrs Brown’s Boys. While that production unleashes something within me that suggests I’m method acting the part of a rabied dog in a chilling film noir, I can, just about, accept that its undoubted popularity ensures the BBC’s coffers are in such a state that it can afford to create shows I do want to watch. And so it is with cars. Sadly, it’s not an uncommon phenomenon on British roads to be needlessly cut-up by a driver who could otherwise be mistaken for the Missing Link. It happened (again) to me last Thursday evening on the A46 dual carriageway towards Lincoln. Having pulled out to overtake a van, its Mouthbreather of a pilot immediately pulled straight in front of me – without indicating, naturally – even though the lorry he was presumably planning on overtaking was at least half-a-mile up the road. As vexing as that was, the moment took a turn for the worse when I immediately spotted a stone hurtling towards me from its offside rear wheel. As I instinctively blinked I heard that sickening ping as it hit the windscreen. Sure enough, a star-shaped splinter the size of a penny had appeared towards the bottom-right corner of the glass. I barely need point out that at this point I obviously didn’t use any form of expletives. None. At all. 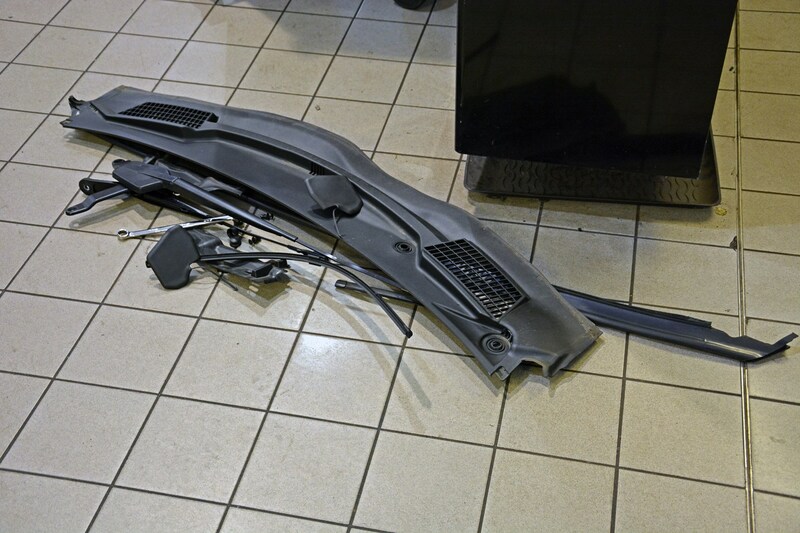 With speedy assistance from the press office tracking a replacement screen down, and the excellent service by Steve Kirk and his team at Mercedes-Benz Lincoln fitting me in the next day, a headache became nothing more than a minor inconvenience. It dawned on me I’d not watched a screen being replaced since my old man needed one for his 1978 Volvo 244 when I was a kid. It was a relatively straightforward task then, with little more than a thick rubber gasket around the screen’s perimeter needing to be removed. 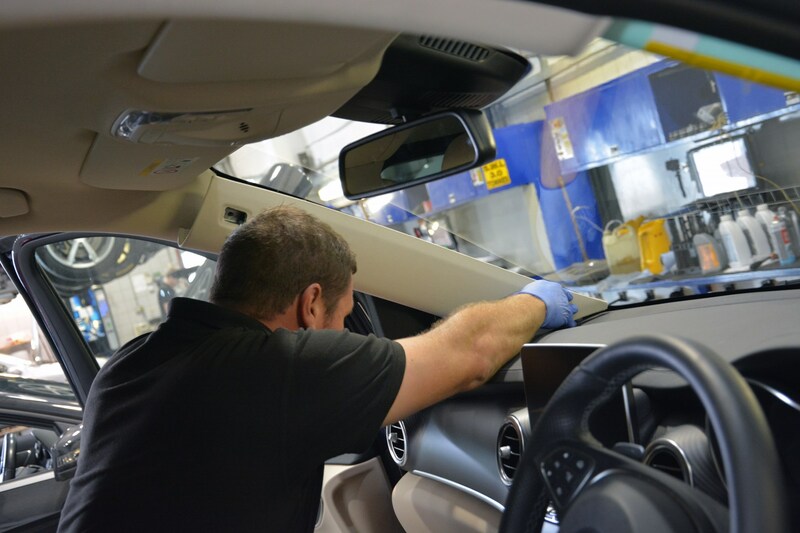 I watched with ever-widening eyes and rising brows as the wipers, under-bonnet plastic facades and interior trims were dismantled, and eight – yes, eight – electrical connections were disconnected before the old glass could be cut away from the V 250 d.
‘This is one of the easier ones,’ the glazier informed me. With 22 years’ experience, he’d know. Carrying it away was a two-man and four-suction cup operation, before the remainder of the original bonding glue was slickly trimmed away and the inside of the frame wiped clean. Cue the battery-powered sealant gun (I want one, but I’ve no idea why) leaving a peaked bead of black bonding agent and within seconds the new windscreen was lowered into position. Putting everything back together appeared to be a reverse operation of how it was dismantled, with all the engine bay paraphernalia put back before the cameras, sensors and aerials were reconnected to the mounts pre-installed on the screen. 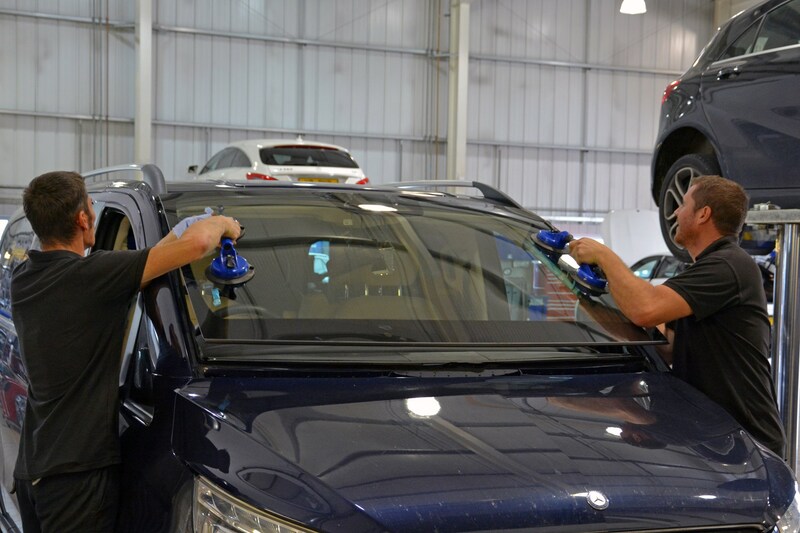 Final jobs simply involved replacing the interior trims and cleaning the glass down – the whole process taking just 34 minutes. All that’s then required is a few hours for the bonding to cure and the Mercedes is good to go. Forty-four-point-eight. No, not my IQ, but the official fuel consumption figure in miles per gallon for our long-term Mercedes-Benz V 250 d.
It’s a figure that seemed ambitious given that so far my average had only been 30.7mpg, but inspired by the feather-footed frugality demonstrated by my colleague Percy recently with his long-term Suzuki Ignis, I attempted to eke more out of the V-Class. Having just crept over 10,000 miles, surely the engine would be suitably loosened up to at least get closer to Mercedes quoted efficiency figure? Diesel tank brimmed – it’s got a 70-litre capacity – and kids loaded into the back, a 226-mile haul from the outskirts of Lincoln to the Garden of England’s seaside haven of Margate was decided upon. Save for the beginning and end of the journey, it’s all dual-carriageway or motorway driving, theoretically enabling steady progress at the 70mph mark, with little need for fuel-sapping accelerative bursts away from roundabouts or out of 30mph villages. The hypermiling gods were looking down on me, with virtually no delays along the A46 and A1, until I happened across the 40mph average speed camera zone on the A14, but at least that progressed steadily. That was soon dispatched, with the M11 and even the M25 proving to be free-flowing, with every opportunity to slipstream articulated lorries pounced upon. Dartford Crossing out of the way, I plunged into deepest Kent, but by now the wipers were going ten to the dozen sweeping away a constant deluge. 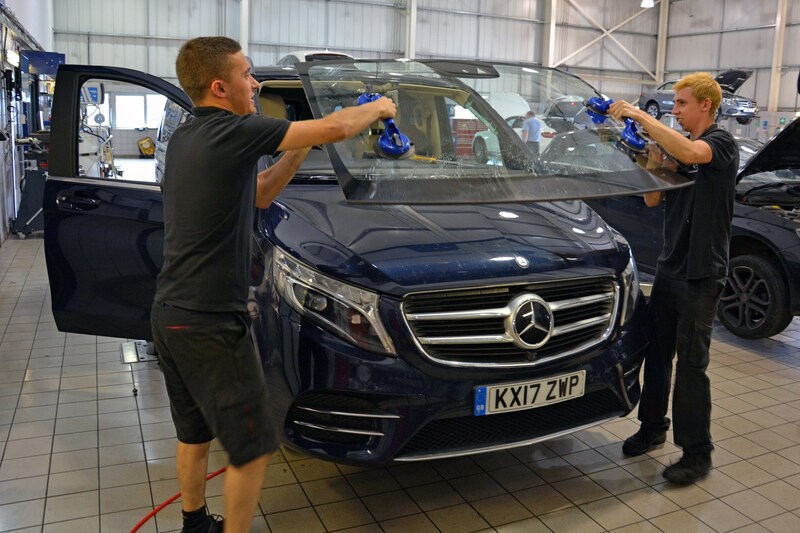 Inevitably this slowed everyone’s pace down – standing water on the M2 isn’t fun – while the combination of the wiper action and the climate control fan speed increasing to keep the V-Class’s vast cabin demisted inevitably placed additional pressure on the engine and electrical systems. And that means more diesel consumed. 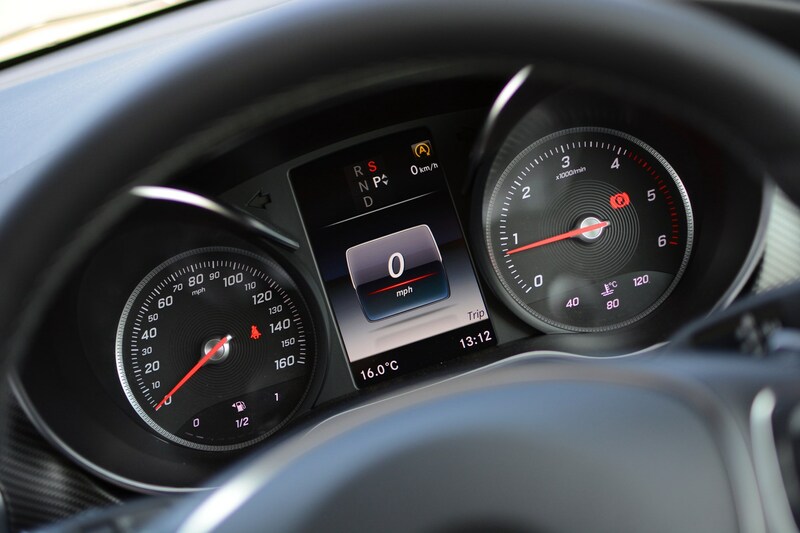 Usefully I kept the Mercedes in Eco driving mode meaning that throttle responses were dulled compared with my usual Sport preference, meaning gentler acceleration and keeping the seven-speed automatic gearbox in the most fuel-efficient ratio. 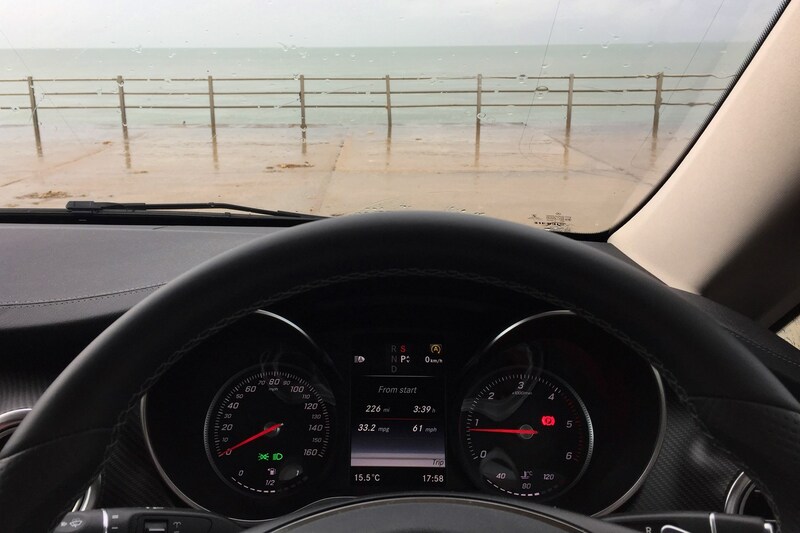 Almost three hours and 40 minutes later, I rolled up in the seafront car park and clocked the quoted 33.2mpg on the trip computer. I didn’t have to wonder for long how accurate it had actually been: a filling station was soon found using the V-Class’s sat-nav, quickly followed by inputting the required data into a fuel consumption spreadsheet (yes, I am that sad). The result? 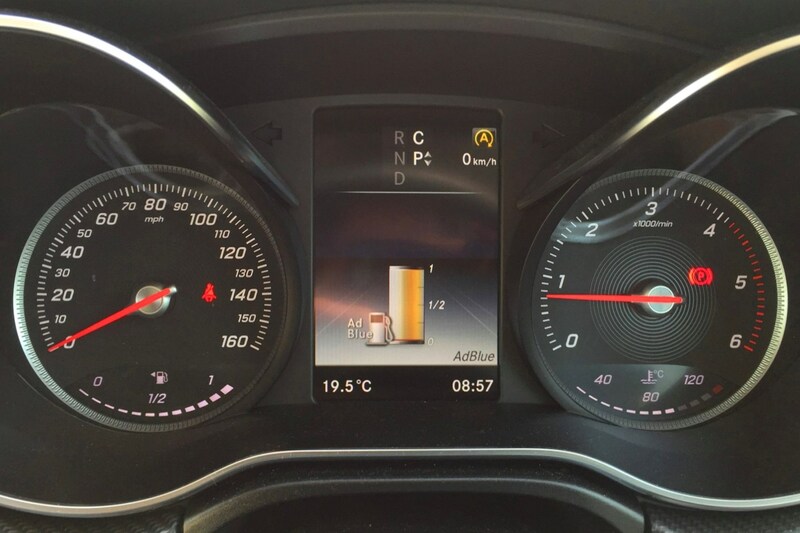 34.2mpg for that trip – even better than the car itself had suggested, although still only 76% of the official figure. Sadly, given progress on my commutes rarely features such consistent and smooth progress I fear I won’t see such heady heights too often, but that single run did stretch the overall consumption out further to 30.9mpg. I guess next time I need to remove all of the passengers – and their seats – and drive an enormous stretch of downhill road in the middle of the night. Percy’s still winning, for now. Ordinarily, visits to filling stations are rather solitary affairs, with little human interaction othern than ‘do you have a points card?’ when handing over my flexible friend as payment. So a trucker waving frantically at me while my hand was squeezing the pump trigger livened up an otherwise uneventful morning. ‘No, I know,’ I clarified, ‘it’s AdBlue.’ The helpful HGVer stopped immediately as though a tanker had earlier drizzled quick-drying superglue on the forecourt. ‘A car? Using AdBlue?’ he squeaked, before coming around to my side of the pumps to see that there were in fact two filler necks behind that awkwardly-positioned flap. 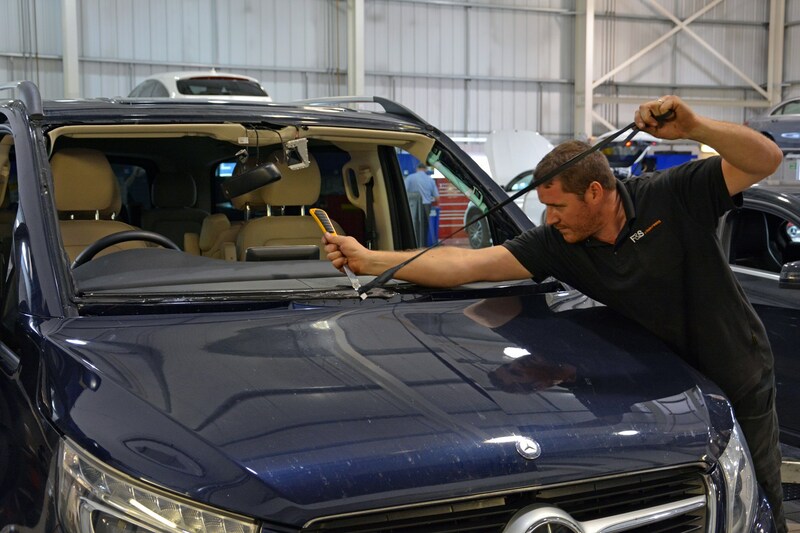 My first reaction was to fist-pump the air – I did it in my imagination only – because he’d referred to the V-Class as a car and not a van, before returning to Parkers mode and telling him that many new diesel cars have to use AdBlue to meet European emissions regulations. It was certainly news to long-distance Larry, and I’ve an inkling it could be to many car buyers who’ve not bought a diesel for a few years. 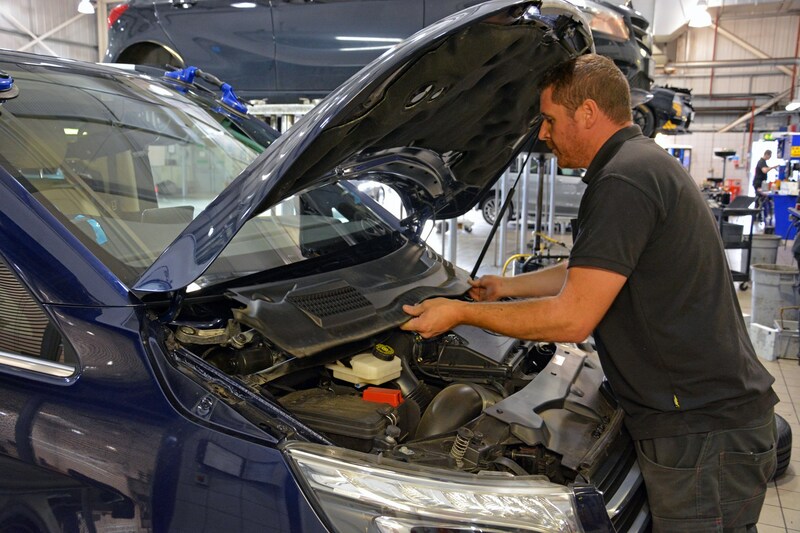 Essentially AdBlue’s a liquid used to reduce the volume of nitrogen oxide (NOx) emitted by modern diesels in order to meet stringent Euro 6 regulations. 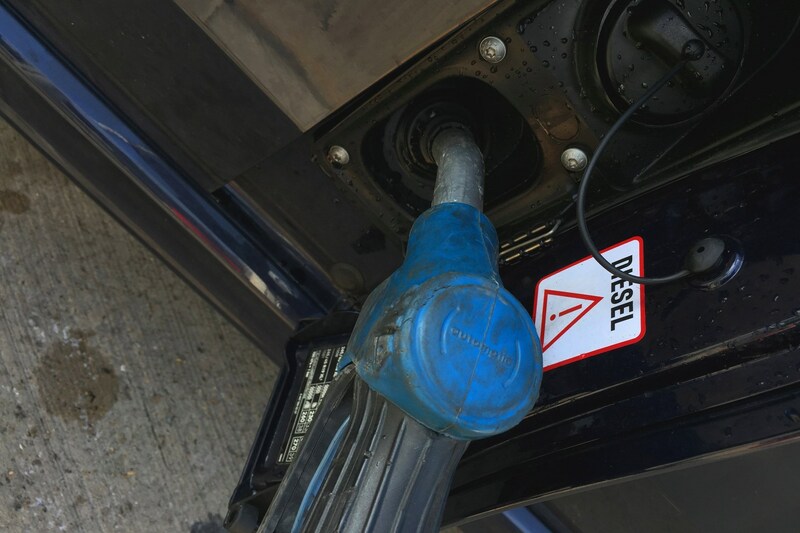 These ever-tightening exhaust emissions rules are applied to trucks before cars and vans have to follow suit, meaning lorry drivers have been familiar with AdBlue longer than most diesel car drivers. Between mouthfuls of Cornish pasty, my hauling buddy at the filling station suggested that with his old Euro 5-spec truck he’d have to refill his AdBlue tank every fifth time he replenished the diesel; on his newer Euro 6 one he’s lucky to get through three tanks of diesel before the low-AdBlue warning light’s flashing. 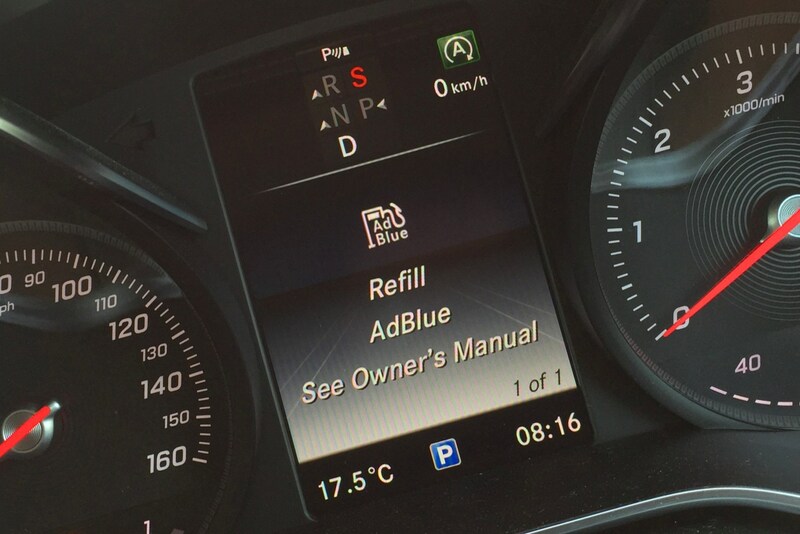 It’s a similar story in our long-term Mercedes-Benz V-Class: with a quarter of the AdBlue stocks remaining in its 11-litre tank, a warning message appears with an accompanying electronic bong every time the car’s started. 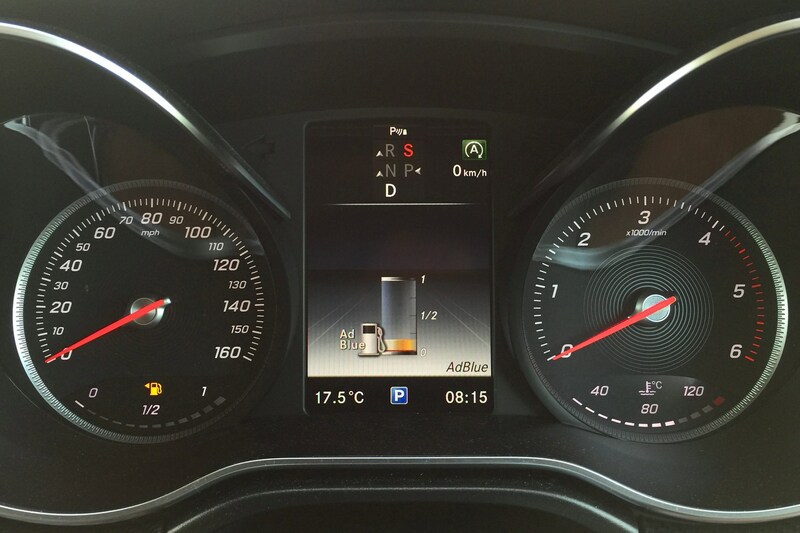 Ignore it and allow the AdBlue to run out, and the engine will be prevented from starting. After all, without the AdBlue it won’t meet the emissions regulations and consequently it’d be running illegally. Frustratingly, this is the second time in just under 9,000 miles that the V 250 d’s required an AdBlue refill, meaning a 3,000-mile run is typical before the warning message springs into life. That’s some considerable way short of the 12,500 miles I managed before my old Citroen Grand C4 Picasso long-termer required its refill, albeit with a larger 17-litre tank. Unlike the Citroen with its tank access under the third row of seats, the Mercedes has an external filler neck making the task much easier. 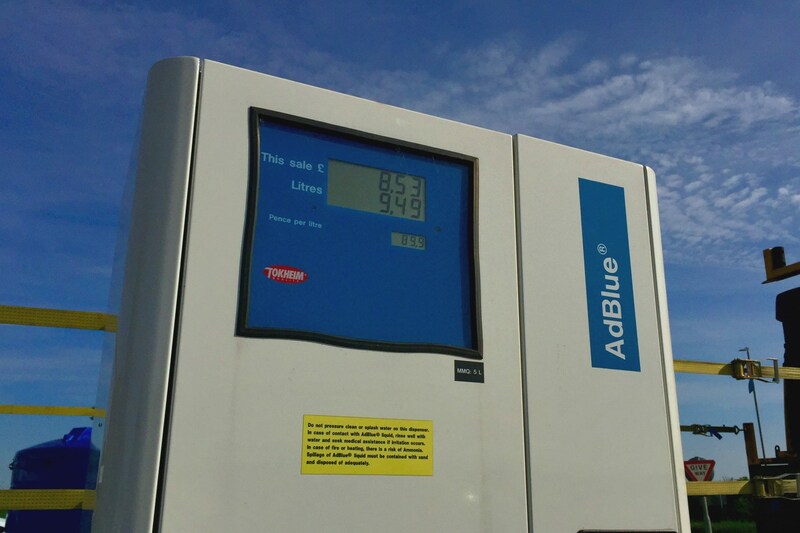 You can opt to have it filled at the service department of a Mercedes dealer or buy it in large bottles (typically retailing at around £15 for a 10-litre container), but one of my Twitter followers suggested using the AdBlue pumps at HGV filling stations, hence why I was where I was when the trucker approached me. It’s cheaper than buying it bottled – 89.9p per litre at the nearest outlet to where I live – and it works exactly the same way as a diesel pump, cutting off automatically when the tank’s full. Just remember to take a damp rag with you to clean up the inevitable dribbles: when AdBlue dries it expands and crystallises, looking like a particularly harsh frost wherever it settles. So, that’ll be it until the V-Class approaches 12,000 miles, hopefully. 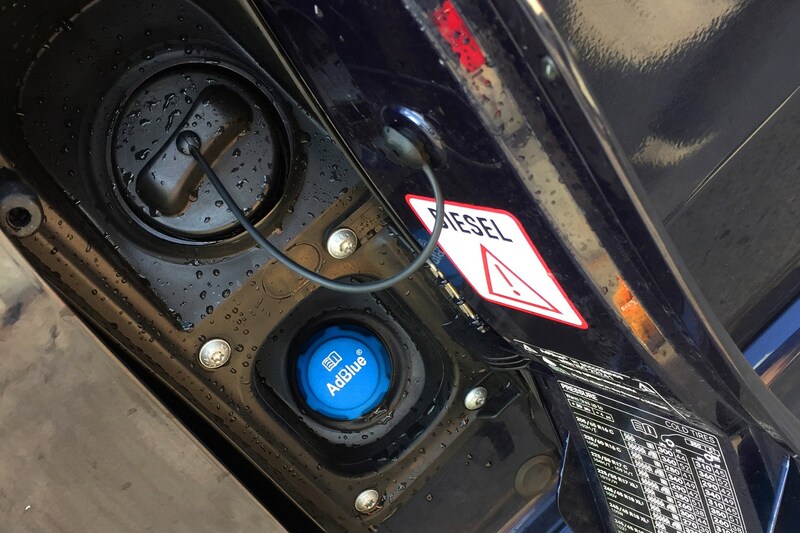 However, with news that Mercedes-Benz is recalling three million diesel-engined cars across Europe for emissions-related remedial work, it will be interesting to see if its AdBlue thirst alters once the tweaks have been made. 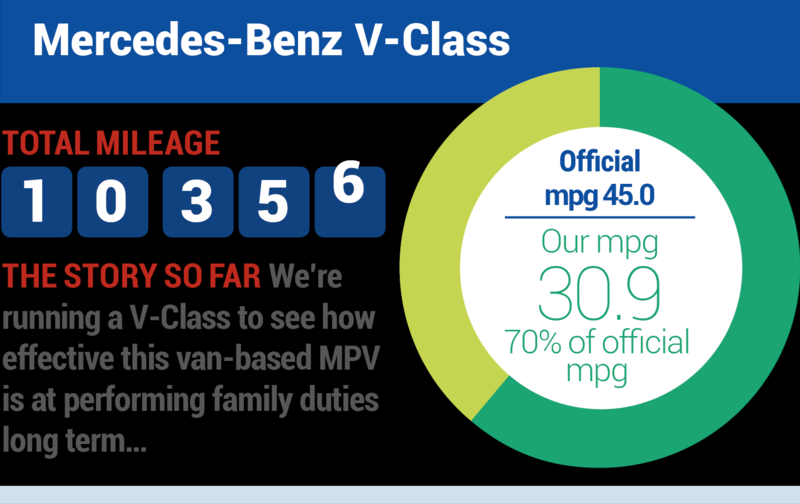 Are you running a Mercedes-Benz V-Class? 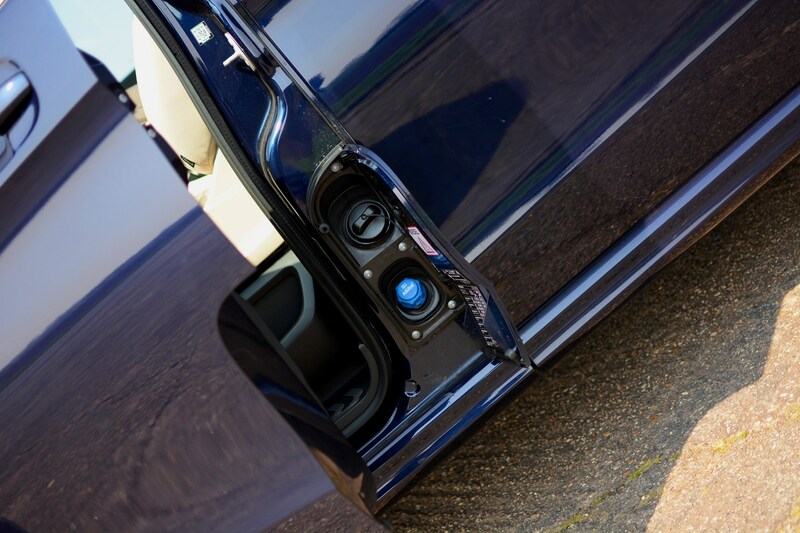 Get in touch on Facebook or Twitter and let us know how often you’re refilling the AdBlue on yours. When I was teaching, the fortnight around the end of June and beginning of July was always fraught. The external exams were just about finished, Year 6 students were joining us from local primary schools and there were inevitably changes to the way we had to teach as expressed by the inspection overlords at Ofsted. But what caused this early summer furore was none of those things – it was the onset of prom season. Ball gowns, tuxedos, formal dinners in grand surroundings, an eclectic mix of interesting cars (or farm machinery – this was Lincolnshire, remember) on transportation duties, and dancing, for those whose legs were inclined to participate. As much as I never expected to enjoy them, I always did. The students always behaved impeccably and saw it as a right of passage into the next stage of their young adult lives. When I’m asked if I miss teaching in my new(ish) life as a motoring journalist, it’s the proms that spring to mind first. 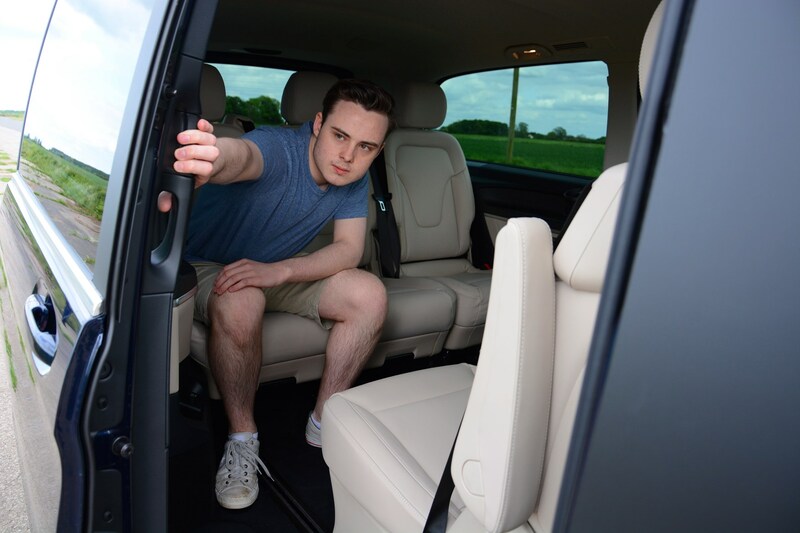 So when my Bauer colleague Paul Larkins asked to borrow our long-term V-Class to chauffeur a lad and his girlfriend from the running club he’s involved with, I was only too happy to oblige. 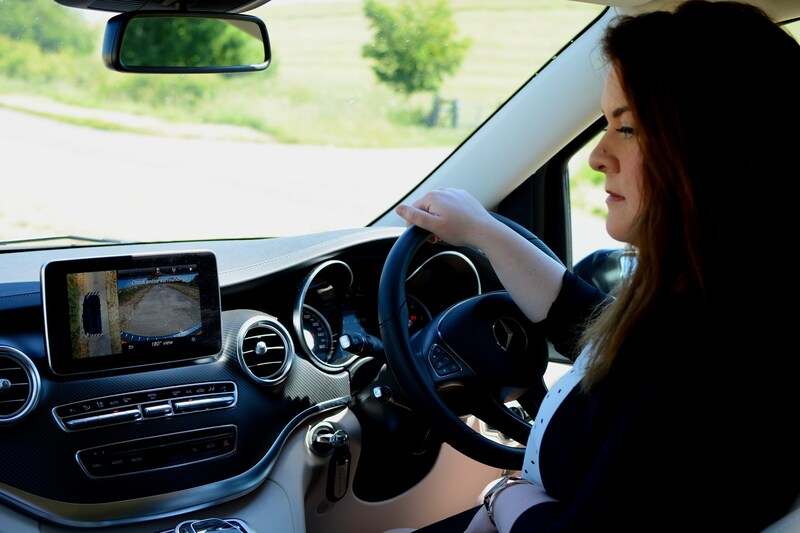 ‘It seems an odd statement to make given the state-of-the-art newness the Mercedes-Benz V-Class offers, but for me, climbing up into the driver’s seat was like taking a nostalgic step back in time. ‘In the early 1980s – shortly after passing my driving test – I found myself at college in Oklahoma for four years. ‘If you’re expecting me to reminisce about cruising arrow-straight highways in an enormous land yacht with a blancmange-soft ride, or performing burnouts in a V8 muscle car, then prepare for disappointment: all my early driving, as a member of the college’s track team, was done behind the wheel of an automatic van. ‘So, selecting D via the steering column control and placing my arm on the conveniently positioned door trim had me all misty-eyed and dreaming of many happy hours on Interstate 35 driving south to Dallas. ‘This is 2017 though, not 1982, as indicated courtesy of the techno-rumble through the steering wheel as I veered over the lane marker lines on the road – a brilliant feature to keep a driver in check, especially on a beast this large. 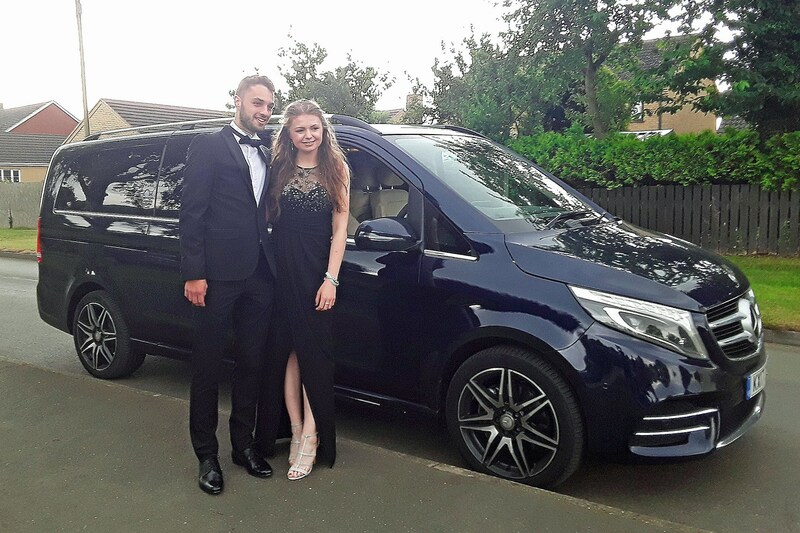 ‘The primary reason for driving the V-Class wasn’t to tan my forearm out of the open window while I relived my youth, but to chauffeur Dan and his girlfriend Tyler to their school prom. 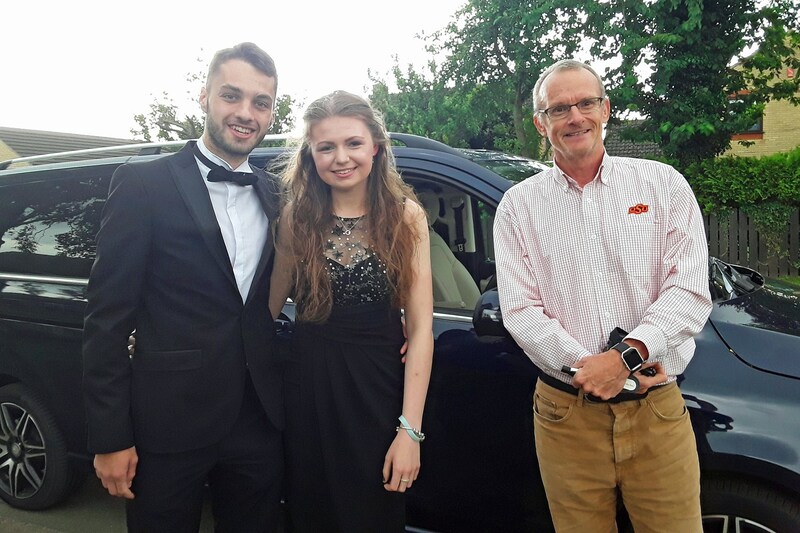 ‘Dan’s a member of the running club I’m involved with and last year went to the prom in his mum’s Astra – it did the job in terms of transportation, but was decidedly lacking in wow-factor. ‘His face was a picture when he saw the V-Class approaching his house but it wasn’t until I opened the sliding rear door – a task performed by pushing a button on the dash – that he saw me and twigged it was for him. 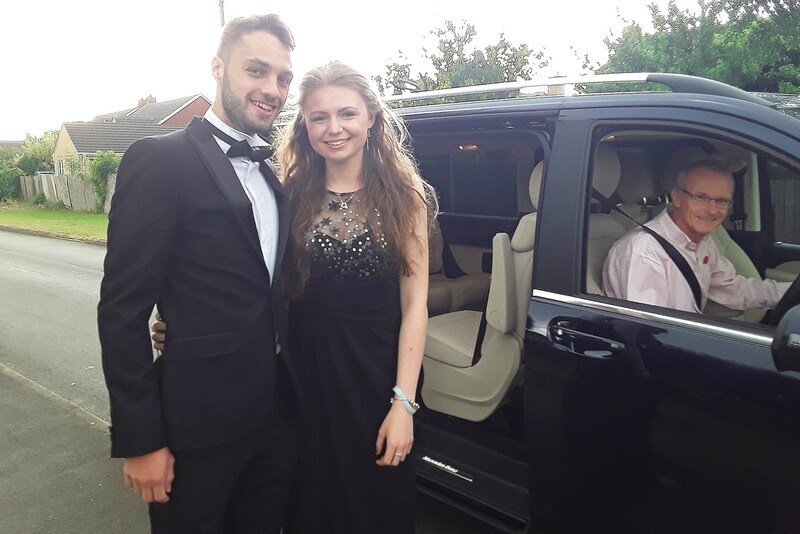 ‘Dark tinted windows, soft leather seats and seating for many of their impressed friends, Dan and Tyler looked like celebrity VIPs as we arrived at the venue. Job done and evening made. Spending so much time in one car, as I have done with our long-term Mercedes-Benz V-Class in recent weeks, means you inevitably get to know its fascinating points as well as its foibles intimately. But what if you spend most of your time in another car from the same marque? Would the experience of the V 250 d AMG Line be a positive one? Does it feel an appropriate-enough car to wear the three-pointed star? To answer these questions I roped-in/coerced/hassled (delete as applicable) my A-Class driving friend, Rebecca. 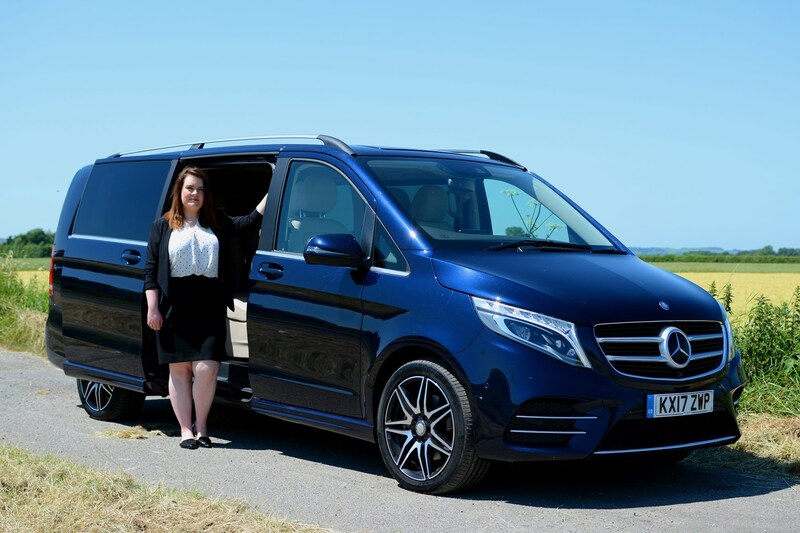 Her commute takes her from the seaside resort of Cleethorpes to her Lincoln office – a 64-mile round-trip – so on a day when her A 180 d was in for a service I chauffeured her in something altogether larger. ‘It’s a weird one because from the outside it’s clearly enormous, yet when you get inside it, it somehow feels even bigger than I expected. Like the Tardis. 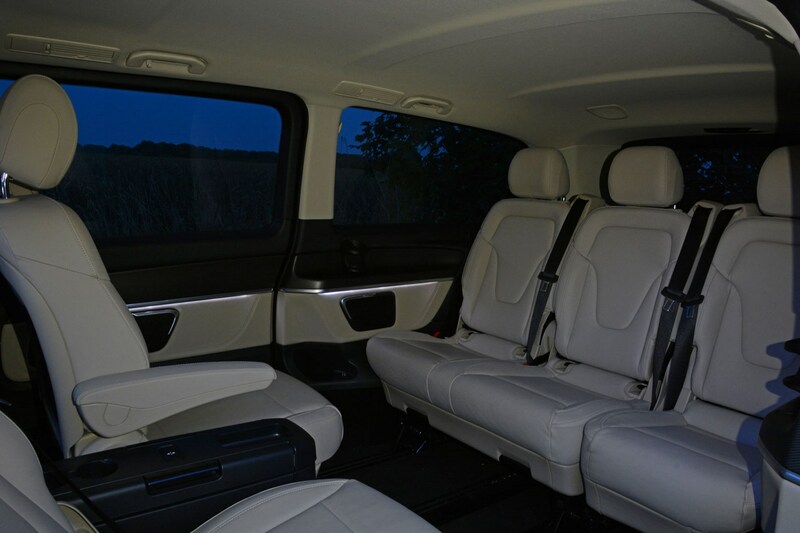 ‘The space in the back is incredible – there’s so much room to stretch out and relax in, and being able to recline the back seats would be great if you’re coming back from a stressful day at work. And it feels as though the ride is comfier in the back, too – far smoother. ‘Up in the front it feels less special as a passenger – the dashboard’s attractive to look at and it feels more upmarket than my A-Class, but you feel a bit more hemmed-in. The back’s definitely the place to be. ‘What also makes it feel more of a luxurious Mercedes than mine is the real, soft leather – not the man-made stuff mine has – and this one’s got a lot more gadgets, too. 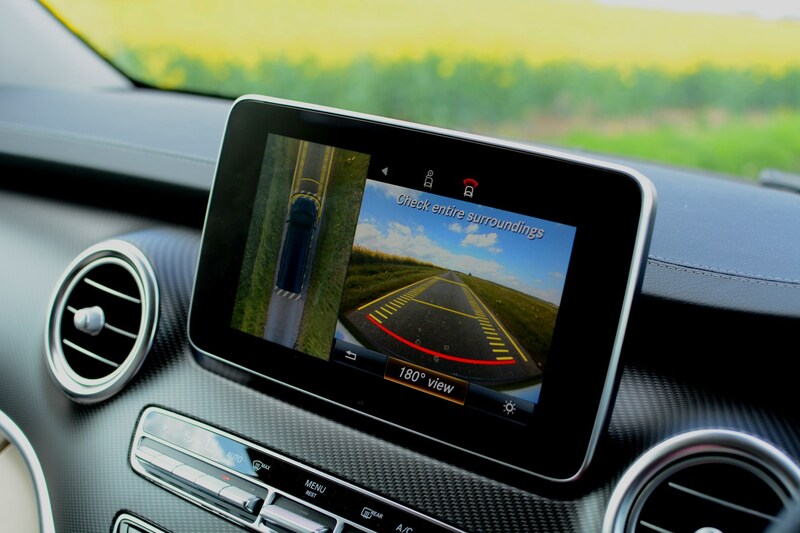 ‘I like the sat-nav screen – that’s much sharper than my one – and the 360-degree camera has got to be a must-have feature on a car this size. 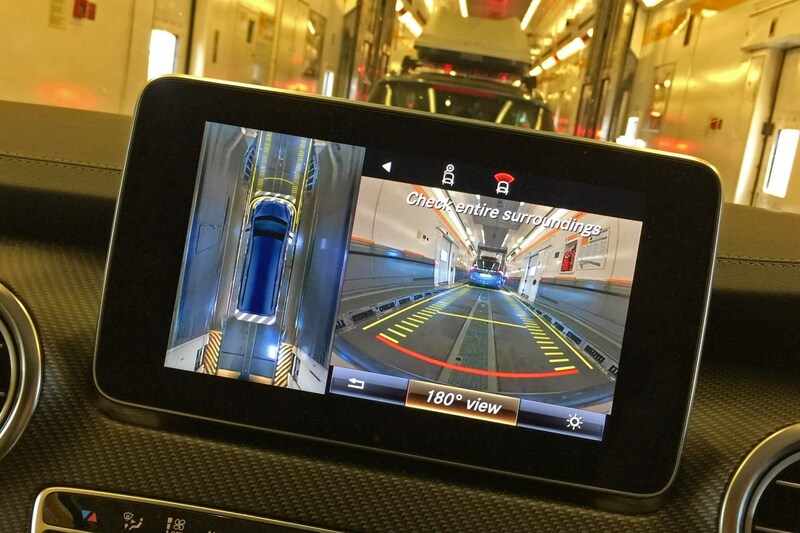 I’d like that on my A-Class, but at least the reversing camera on that has a clear display. ‘The best bit? It’s got to be that sound system – it almost feels like you’re in a concert hall with the 15 speakers surrounding you. Can I feel a ‘but’ coming..? ‘There’s one thing I don’t get, though, and that’s the table. 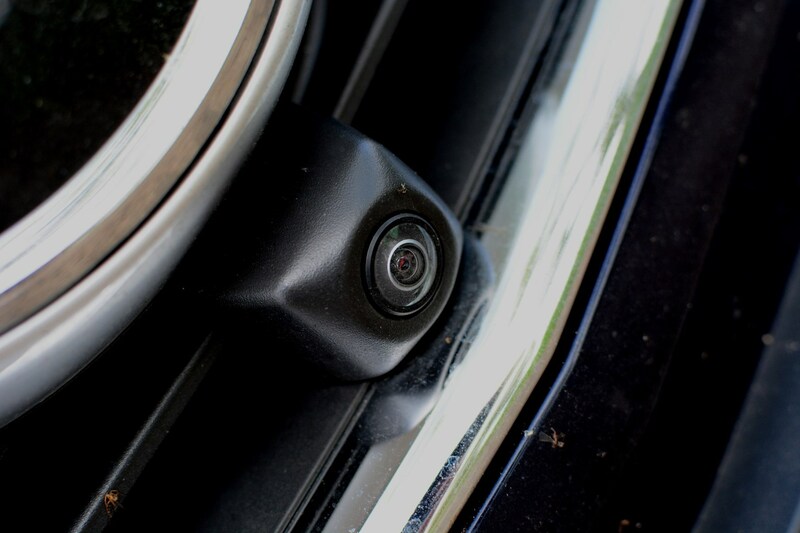 If you were driving about and your passengers were using it, then every time you went round a roundabout or braked heavily, laptops, notebooks and coffee cups would be flying all over the place. That’s not good. ‘It just seems redundant to me – if you stopped off for a break on a journey, would you really stay in your car to eat your lunch? I know I wouldn’t. And on a hot day it would soon become roasting inside without the air-con on. ‘My main problem with the V-Class is how it looks, though. Yes, it’s lovely inside, and it feels how I would expect a more expensive Mercedes to feel, but from the outside it still looks like a delivery van. Rebecca’s views are in line with the thoughts and conjecture of many of my non-Mercedes-driving friends that the V-Class is fantastic inside and vantastic outside. I could live with the looks if I was buying one, but maybe I’m in the minority. 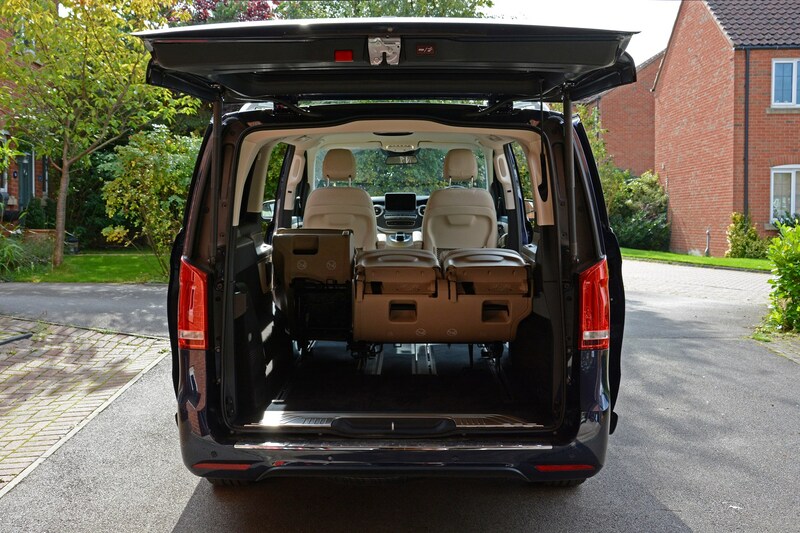 From now on, anyone having a lift in it for the first time will be blindfolded so that they fall in love with the space and luxurious appointments on offer before they can judge its perpendicular bodywork. When my routine’s out of sync, I invariably forget something. And it’s usually something rather vital. Normally I’m in the office by 7:30am, but on this particular Monday I was setting off later after completing school run duties. I felt on edge being a couple of hours behind my normal schedule, but I couldn’t fathom out what was niggling me. It was as I pulled onto the driveway that I realised what the vital thing was I’d forgotten: the house key. I was locked out and thanks to the A1 being gridlocked, I wouldn’t make it to the office until after lunch. What to do? 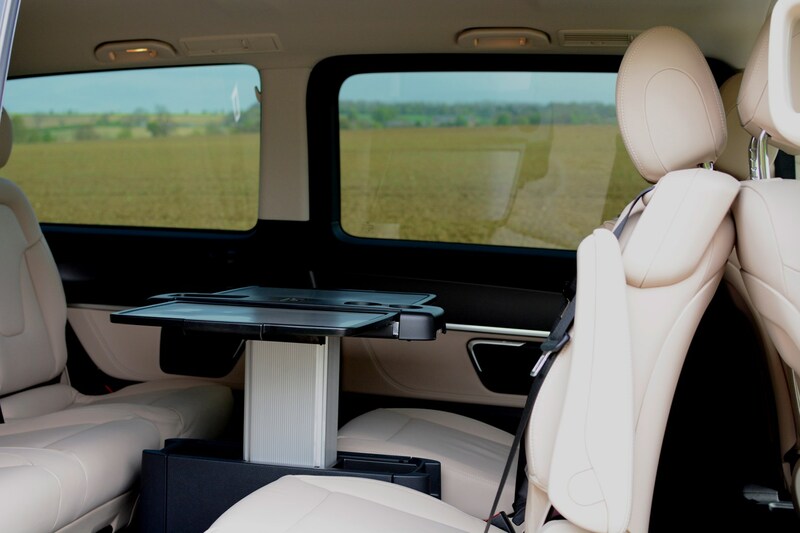 V-Class – the ultimate hot desk? 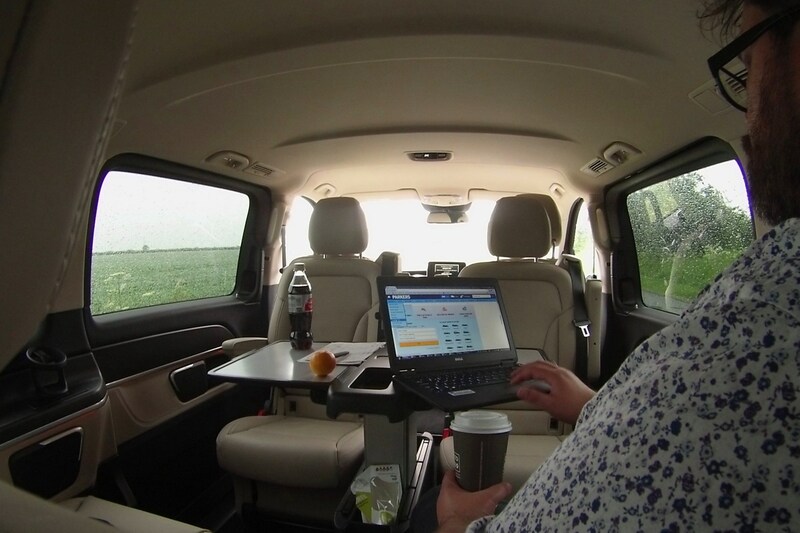 Ever one for quick-thinking (no need to raise your eyebrows in surprise), it dawned on me I could use the V-Class as a mobile office. After all, it’s got a desk – okay, a pop-up table in the back – and, when you tether your smartphone to it, WiFi as well. 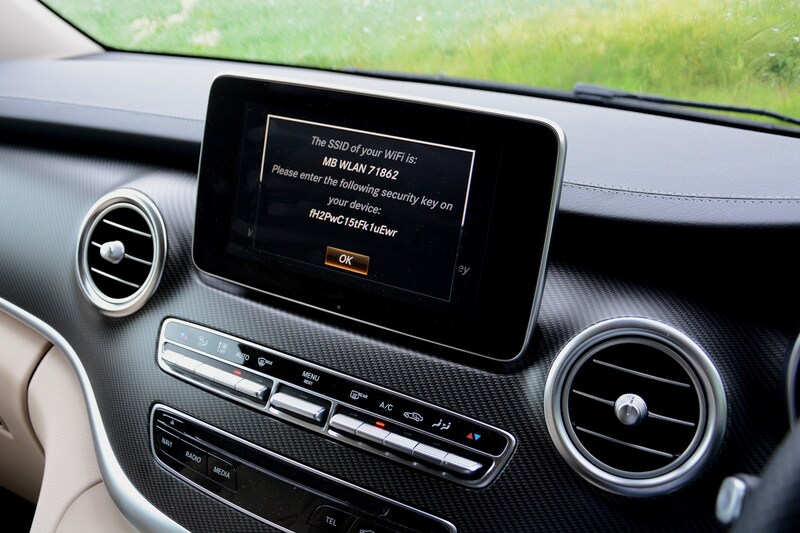 9:04am Scroll through the Mercedes’ multimedia settings to find the V-Class’s WiFi code (I’ve since changed it before you try and logon and ramp up my tethering bill). 9:06am Open out the table, connect laptop to the WiFi, have coffee and begin wading through emails. 9:44am Start writing a feature. 9:46am Take a break from feature to look at old car brochures on eBay. 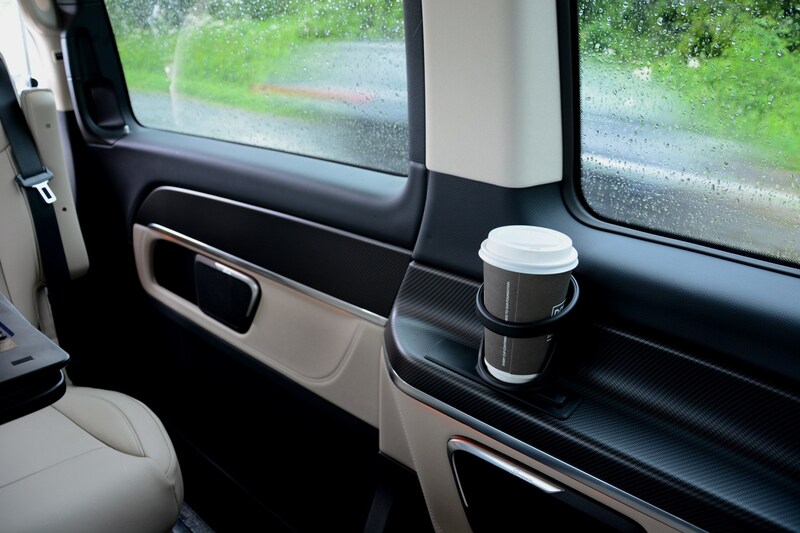 9:47am Almost knock coffee off the table – use dedicated cupholder instead. 9:58am Get back to feature. 10:22am Feel a bit nippy, so start the engine and turn up the heating in the rear compartment for a bit, with warm air blowing down gently from the roof-mounted vents. 11:14am Finish feature, upload it to the website’s back-end CMS and have my sandwich. 11:38am Bid on a couple of the brochures I saw earlier, put my rubbish in the under-table bin (I think it’s more of a storage area but it makes for a useful waste receptacle). 11:42am There’s a break in the rain, so I take advantage and stretch my legs. 11:50am Back to work editing photos from a couple of recent shoots. 1:41pm Upload images to the server and begin researching model histories for review updates. 1:50pm Decide that it's a pity I didn’t have any meetings scheduled as the V-Class would be an ideal small conference room. 2:20pm Recline one of the individual seatbacks, close my eyes and contemplate Tuesday’s workload. 3:04pm Head off for the afternoon school run and hope one of the kids has a house key on them. 4:05pm Use one the kids’ keys to get back in the house, settle down at my desk in my study and continue working. And nobody back at the office was any the wiser… Oh. Regular readers will be aware – just as those who know me in the real-world often hear me lamenting the fact – that my kids have no interest in cars. Or anything car-related, come to think of it. If I suggested visiting a classic car show one sunny Sunday, the three of them would sooner volunteer to sift out the cat litter with their bare hands for the next 100 years. They’re as likely to sit down and watch an F1 race as I would be to endure a half-hour episode of Hollyoaks (although if I did, I’d have to say hasn’t Lysette Anthony aged gracefully…). 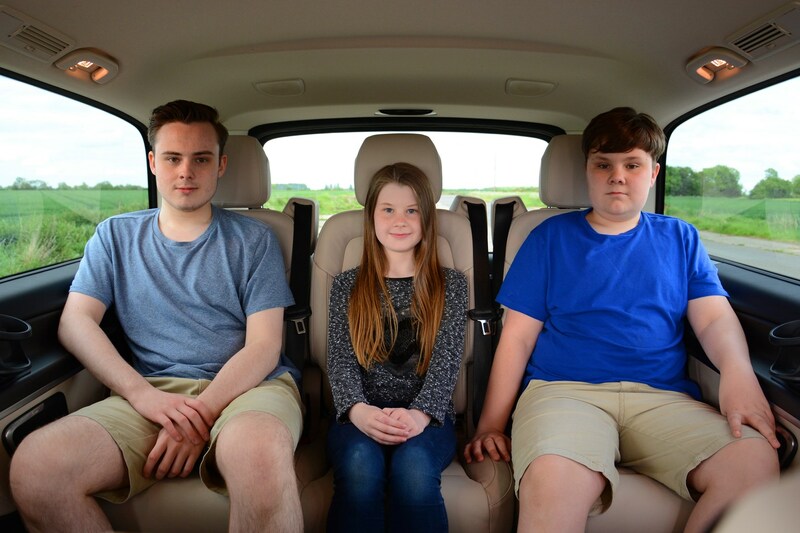 Now, I’m not suggesting that the arrival of the Mercedes-Benz V-Class has heralded the awakening some deep-seated motoring passions within them, but Jack (16), Fin (13) and Lily (11 going on 17) are now able to travel without winding each up incessantly, and consequently I’m less hoarse on the school runs. 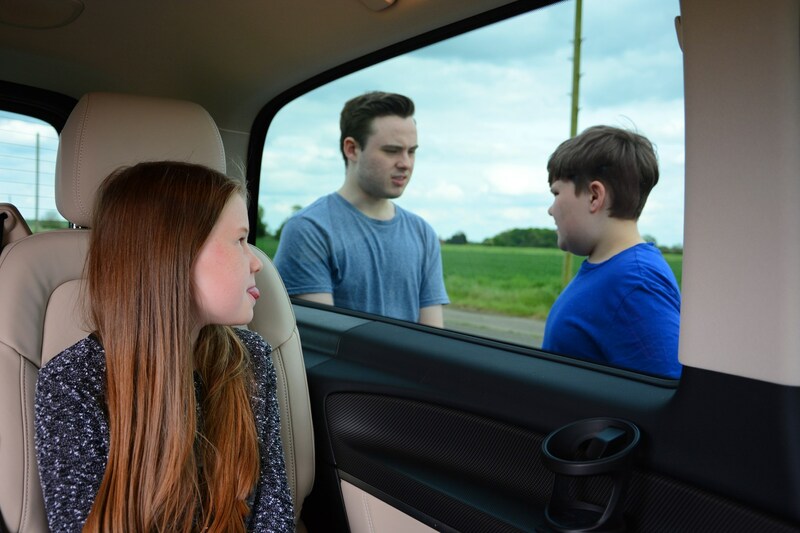 So 4,000 miles in, what do the three of them think of the V 250 d MPV? Inevitably, I received their thoughts via email, WhatsApp and iMessage. ‘I like the space it has inside – it’s not a surprise considering how big it is, but its layout’s generally well-designed, the windows are tinted for privacy and the electric sliding doors are convenient. They’re also amusing when you see onlookers’ faces as they open and close without anyone touching them. ‘One aspect I do find inconvenient is getting out of the car when facing backwards in the middle row. Maybe it’s my height, or maybe I’ve just not figured out how to bend myself properly, but I almost always bang the back of my head or neck on the top of the door frame as I twist out. 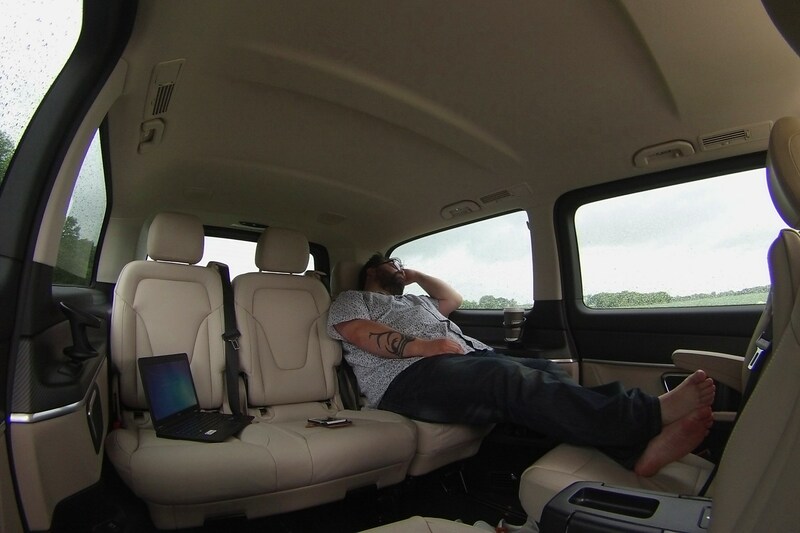 ‘There’s loads of legroom in it, so you can really stretch out, especially if there’s nobody sitting opposite you. I’ve not been in it yet with the seats all facing forward but I imagine it wouldn’t feel as spacious. ‘I really like the light-coloured leather too. So many cars seem to be black and it’s boring. But what I really like are the air-con vents in the roof. 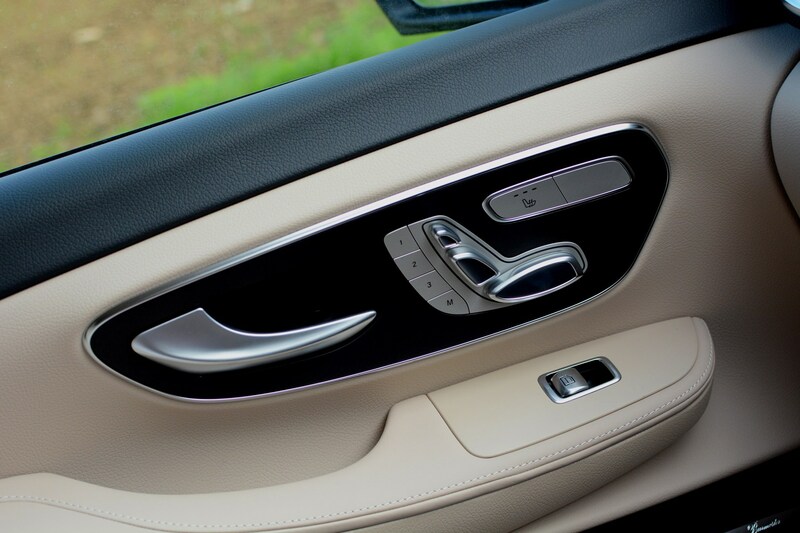 They’re really good at keeping you cool – you don’t even notice that the windows don’t open in the back. ‘I don’t like sitting in the middle seat of the back row if someone’s pulled the table out. It’s not when it’s in use that it bugs me, just when it’s not been slid back and your legs are cramped up or spread apart. Why is the middle seat always the worst? ‘Well, I like how the seats are facing both directions in the back, so you can talk to people much easier if you want to, and the air conditioning in the back is better than any other car I’ve been in. ‘What I really like most are the windows that are so tinted that they look black from the outside so people can’t see in and look at what you’re doing. ‘The thing I miss the most though is that it doesn’t have a glass roof to make it even lighter in the back. [She’s then told that you can have a glazed roof on other V-Classes] Why didn’t you ask for one of those then, Dad?? Duh! One perennially enjoyable facet of car testing is catching out drivers who’ve been prejudicial in assuming what I’m behind the wheel of lacks pace. After clocking up 3,000 miles in the V-Class, it’s safe to say I’ve not driven anything that’s been subjected to such narrow-mindedness on the road. This isn’t some kind of automotive sourcery, but rather good, new-fashioned German engineering – specifically, a rich seam of 440Nm of torque available from the depths of the 2.1-litre diesel’s rev range. Officially it’s sufficient for a 9.1-second 0-62mph time, yet given the V-Class’s 2,155kg heft and physical immensity, it feels much faster than that. Desired cruise control speed resumed, I’m always rather glad that the automatic gearbox has slithered seamlessly up to seventh as it heralds a more tolerable tune from the engine. There’s no escaping that as you press on it booms like a Massey Ferguson impersonating Brian Blessed, so its preferable to ease off the loud pedal and let the motor settle. This gentler, more sympathetic approach pays dividends aurally, but not whenever you encounter a bend in the road. 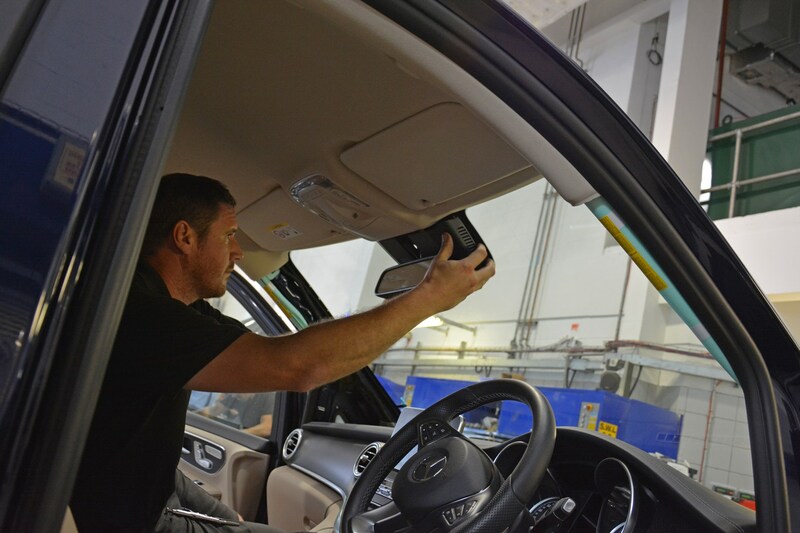 A mere curve signals no let-up in the V-Class’s progress, but as you wind on the steering to tackle something representing a more acute change of direction, the effects of the Electronic Stability Program (ESP) are as obvious as they are immediate. Enter a corner with any sort of enthusiasm and immediately you can feel the car braking itself; turn the wheel an extra few degrees and yet more speed dwindles away. You can’t help but feel as though the ESP’s system’s playing it too safe, especially as you can override its nannying by caressing the rubber-studded throttle pedal to tease the speedo up a few miles per hour without any drama. Like more conventional Mercedes models, the V-Class has adaptive driving modes – Eco, Comfort, Sport and Manual – to vary the responsiveness of the accelerator and gear changes, as well as the firmness of the suspension. I’ll explore these further in a future update, but so far I find I drive most of the time in the Sport setting. Not only is more of that low-down performance accessible, which is useful for getting up to speed quicker than it will in the default Comfort mode, but the ride quality becomes a smidgen stiffer. 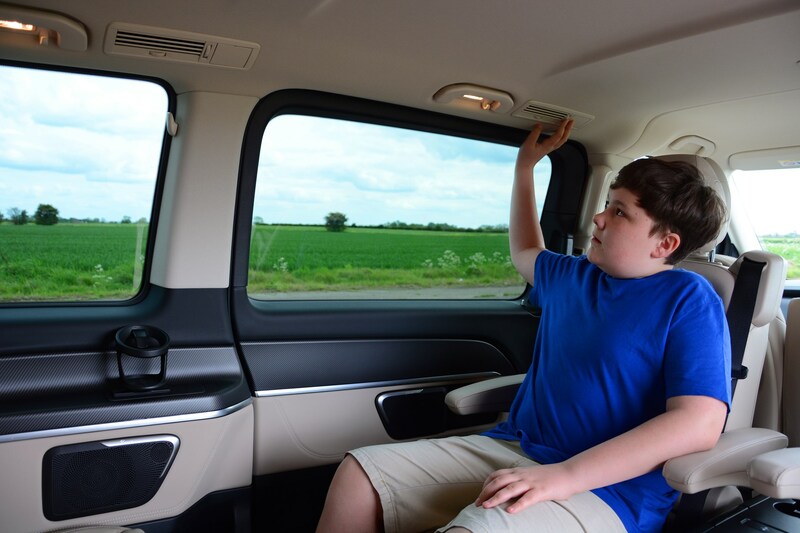 My kids – all three of whom are prone to varying degrees of motion sickness – appreciate the Sport setting because it dials out the inherent floatiness of the V-Class’s air suspension system, something exacerbated by the Extra Long version’s colossal wheelbase. Feeling more of the road’s imperfections, without ever being harsh, seems to quell their unease before it develops any significance. 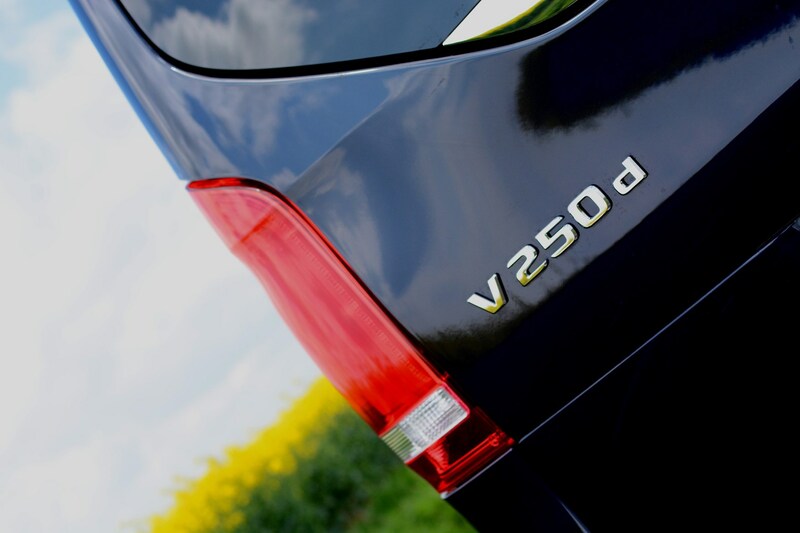 Having the fruit of my loins in the V-Class acting as human ballast also settles the V 250 d at higher speeds – with just the driver on board you’re aware of more vibration being sourced from the rear wheels. It doesn’t go as far as to unsettle it into a full-on B-road shimmy, but you’re aware of it all the same. Inevitably, there are times when it’s necessary to scrub off speed in short order, and in this regard the V-Class impresses. 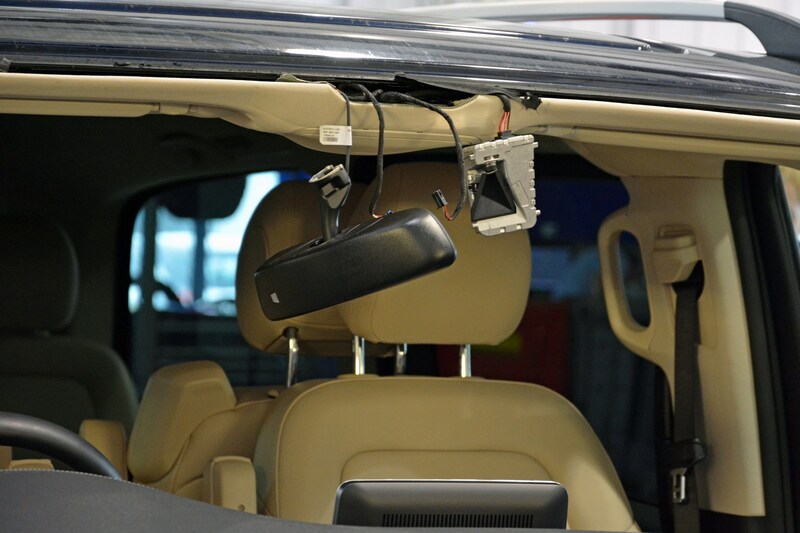 Not only do you have the back-up of a not-too-intrusive autonomous emergency braking package, but the brake discs front and rear are ventilated to make them more effective. 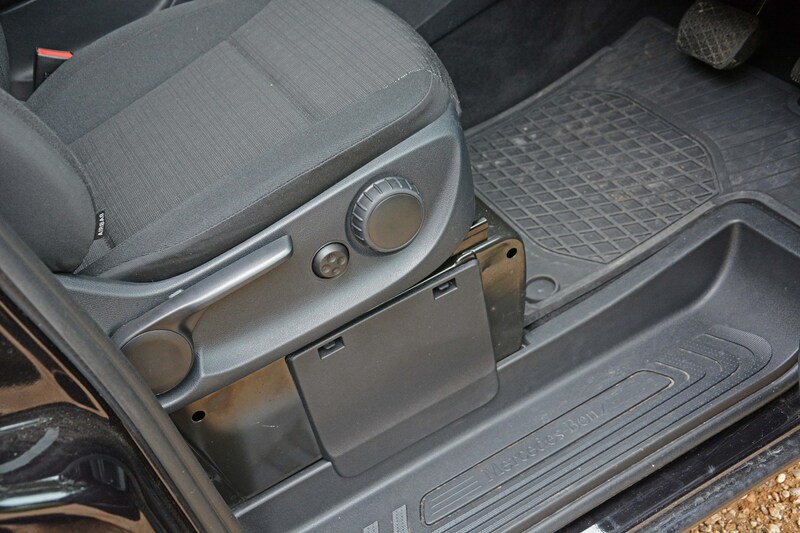 They’re easy to modulate, which is useful as they’re designed to stop the car safely when it’s been driven seven-up, but what they can’t disguise is the weight transfer during deceleration. You soon adapt to that and begin to use it to your advantage, particularly as you brake into a bend, increasing the front tyres’ grip of the asphalt as the Mercedes’ nose becomes heavier. Not that much of that adhesion is telegraphed through the steering wheel, sadly, and being perched so high you’re hardly driving by the seat of your pants either – you simply learn to trust that the grip is there. Your faith is reinforced by the thick, leather-wrapped rim acting as a conduit for road surface undulations, but that’s as much as you get in feedback terms, but that sort of misses the point. After all, as much as it can be hustled around surprisingly briskly, the V-Class’s role is to transport people around in unruffled comfort – and on that metric, it excels. 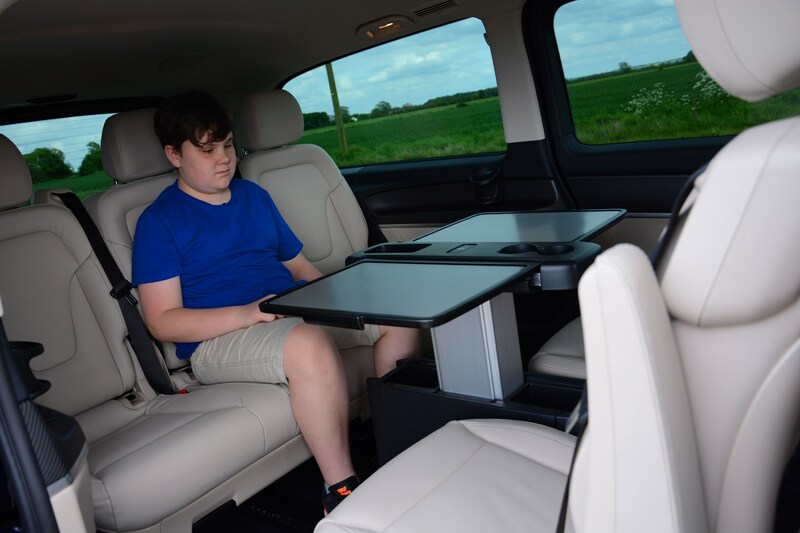 After wafting away nearly 2,000 miles at the wheel of our Mercedes-Benz V-Class, there’s been plenty of opportunity to explore its fixtures and fittings. There’s much that’s standardised for its £52,470 on-the-road asking price, but the optional extras list was plundered to the tune of a further £5,790 – are they proving worthwhile? Today’s V-Class line-up comprises of two trim levels, both of which are available across all three length options. Despite being the most gargantuan, the Extra Long body is the middle-ranking in terms of price, courtesy of the medium-sized Long (that’s not confusing, is it?) having a glass roof as standard. As an entry-level trim, Sport’s hardly basic, with electric side doors and tailgate, rear privacy glass, self-parking function, sat-nav, soft Nappa leather seat facings and LED headlamps. I’ll explore the V-Class’s lighting in a future update, but it’s worth pointing out that while the headlamps offer superb illumination that adapts to your speed and steering angle, the automatic main beam is merely an on/off function. 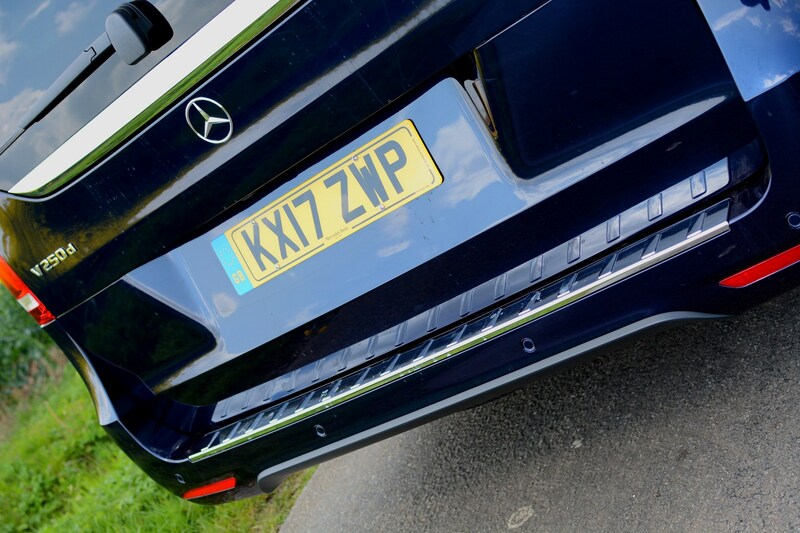 Mercedes’ superior matrix system – that moves a portion of dipped beam so as not to dazzle oncoming traffic – isn’t on the V-Class’s kit roster. 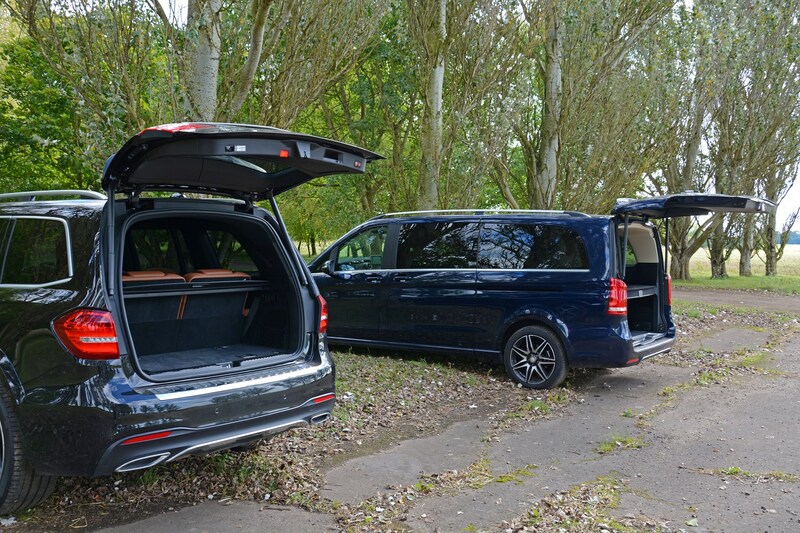 So what does AMG Line add to the V-Class party for an extra £2,140 over the Sport? Frankly, it’s almost entirely superficial. Firstly, the alloy wheels are upgraded to smart, two-tone 19-inchers with a barely discernible alteration to the ride quality thanks to the V 250 d’s air suspension. There’s no archetypal AMG woofling exhaust heralding potent performance, though – it still has 190hp after all – but the looks have been beefed-up. Its bodykit is subtle – which pleases me as I’m not a fan of such fripperies – with a reprofiled front bumper, sill extensions, a discreet tailgate spoiler and, utterly unnecessarily, a back bumper applique hinting at a rear diffuser. Is there a more tenuous link to Formula 1 I wonder..? 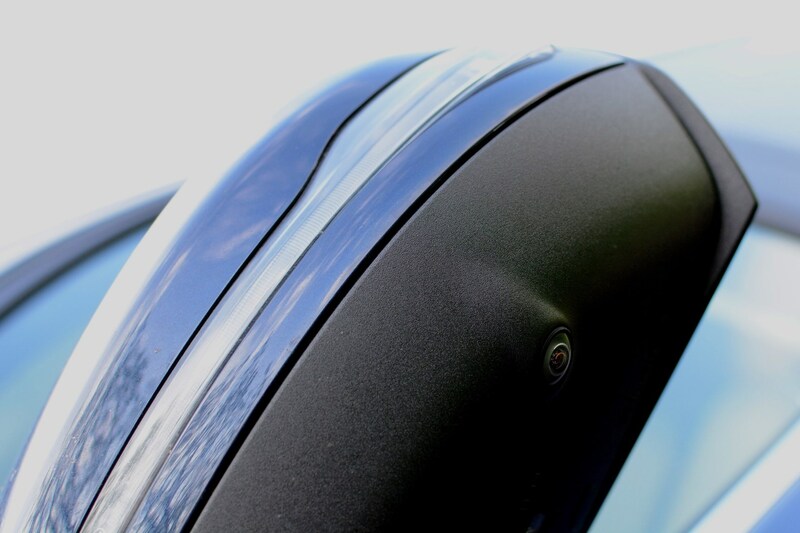 Metallic paint – in this case Cavansite Blue – is also part of the AMG Line package. Once inside the changes are even fewer in number: the swirly pattern dashboard plinth and door trims are replaced by faux carbon-fibre (see previous F1 question), while the circular air-vents are circumferenced in chrome. 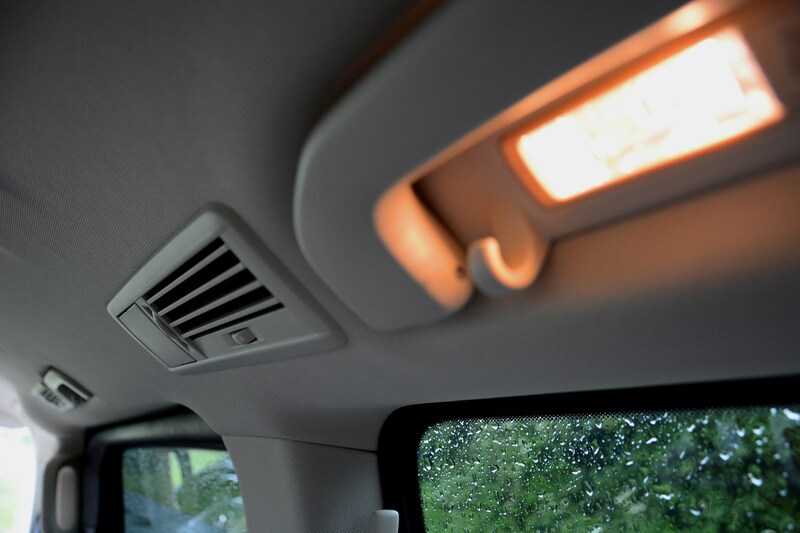 Those, along with roof-mounted vents in the rear and ducting at carpet level, are the outlets for the three-zone climate control. Given the van-like volume of space inside, I’m already most impressed that even on warm days I’ve not had any complaints about the passenger compartment being too hot. So why go for the AMG Line? It’s essentially an aesthetics argument, and one not everyone will like, but while both trim levels are expected to retain 52% of their value over three years and 30,000 miles, Mercedes expects more used buyers will be attracted to V-Classes with the AMG pack, making it easier to sell on. Time will tell. 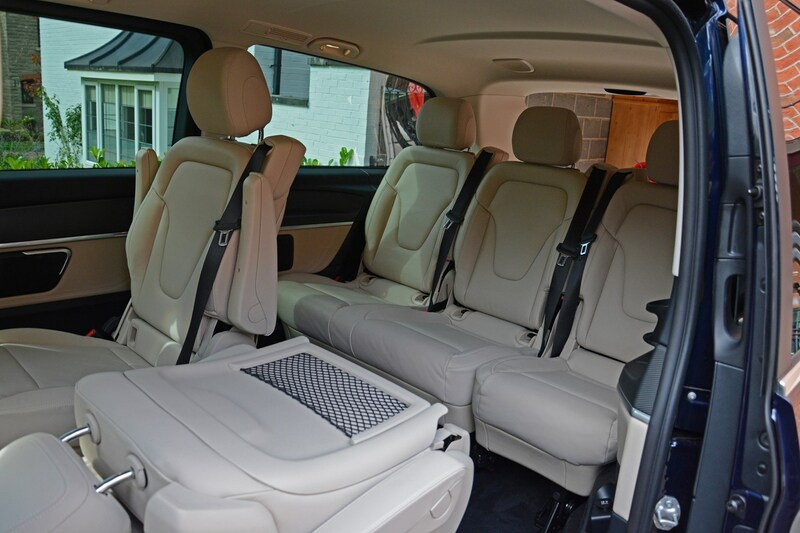 Speccing the V-Class as a seven-seater rather than an eight means that the middle row seats comprise of a pair of captains’ chairs with arm rests in place of another three-passenger bench at no extra cost. Neither is there a charge for switching from standard black to Silk Beige leather. It also includes a pop-up table that slides along the floor rails and a couple of removable cup-holders for the rear-row occupants. So far I’ve left the middle chairs in the vis-à-vis formation shown in the photos, but they do unclip to face forwards, something I suspect will liberate more legroom and I’ll cover in the coming weeks. 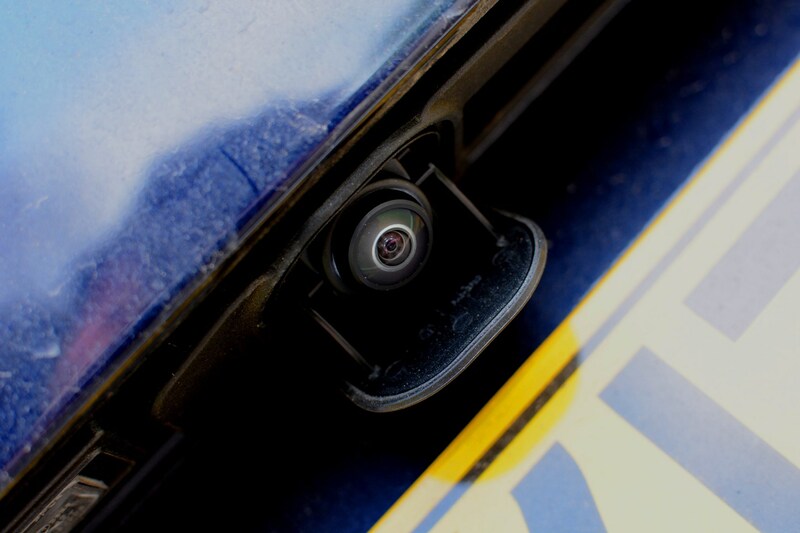 Invaluable for manoeuvring the 5.37m-long V-Class at low speeds is the 360-degree camera system. 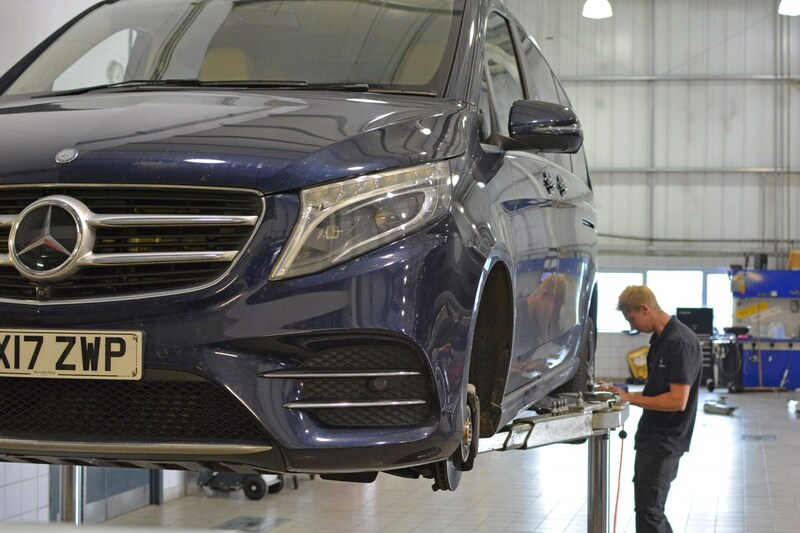 The lenses are positioned below the three-pointed star in the grille, under each door mirror and behind a flap in the tailgate which keeps the rear one clean when not in use. Those images are cleverly stitched together to form a composite birdseye view illustrated on the multimedia screen, with controls to allow you to zoom in for specific views. £335 well spent. 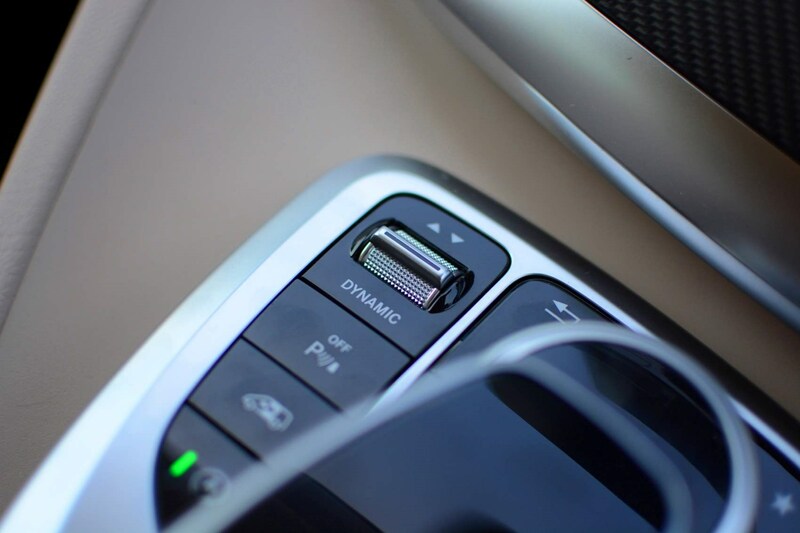 Whether you can justify the £1,225 for the electrically adjustable front seats with three-position memory function will depend on how many people regularly drive your V-Class. If it’s only likely to be one person, then save your money. Again, a point of note when having the middle row seats facing backwards, if you recline the front pair too far they will foul the chairs behind, requiring you to have them manually slid out of the way. 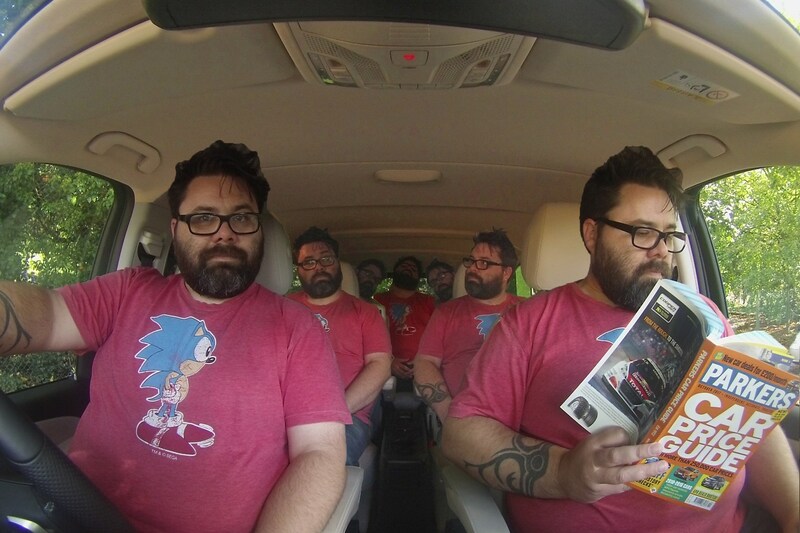 It wouldn’t be a problem if all seven passengers are facing forwards. 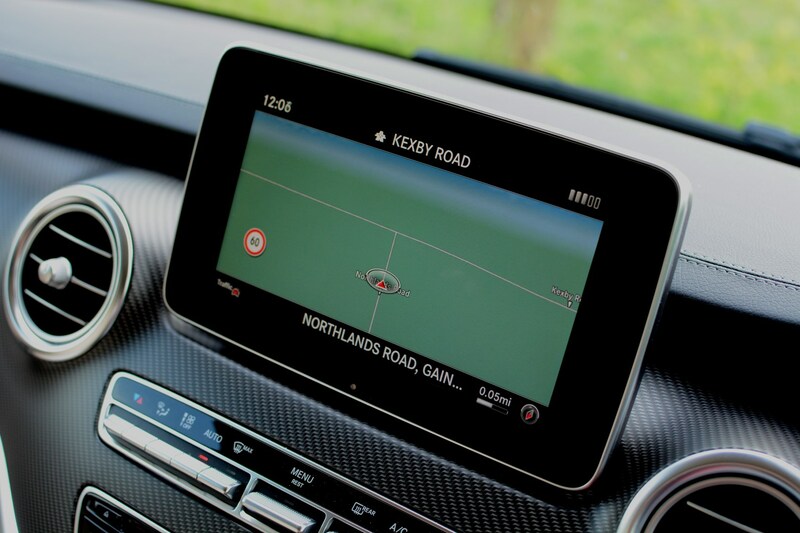 Comand [sic] is the upgraded multimedia system with an 8.4-inch screen, an uncluttered and quick to refresh sat-nav, live traffic updates and internet access among other features. 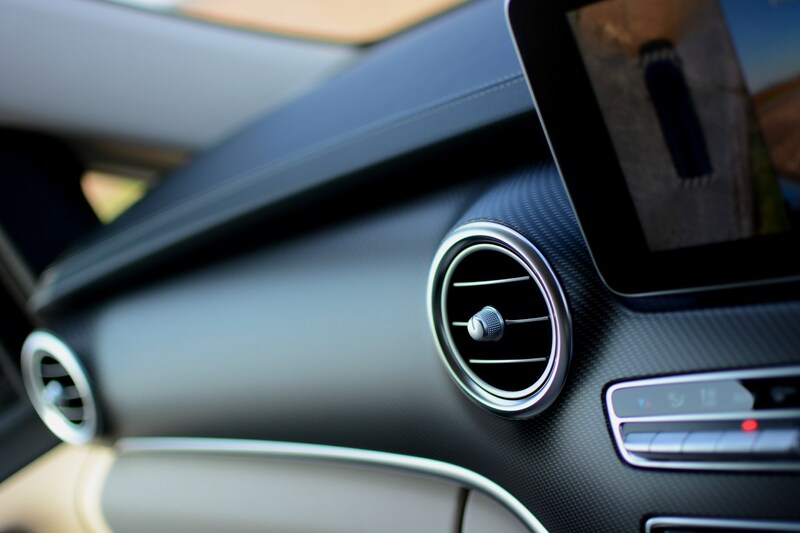 Whether it’s £1,795 better than the standard multimedia system is a moot point, but many used buyers seek it out, and arguably it looks more upmarket mounted on the C-Class-esque dashboard. 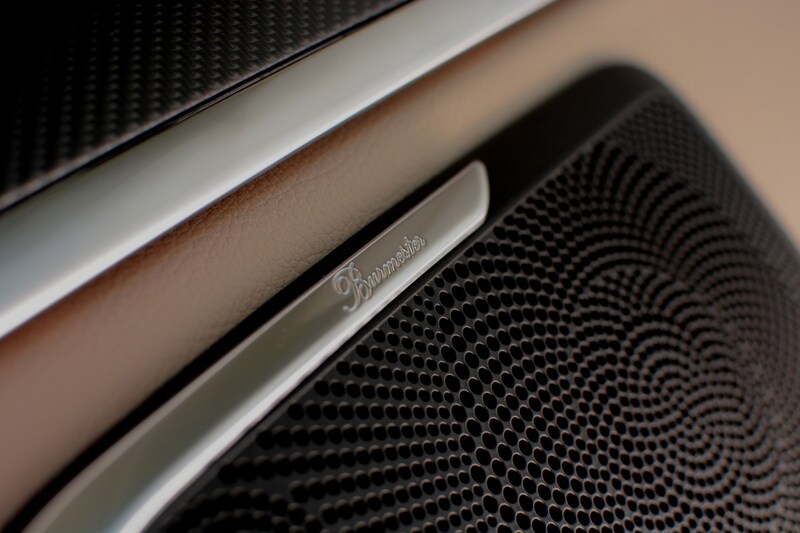 Complementing Comand is the 15-speaker Burmester surround sound upgrade. It’s a £675 option and includes speakers in the dash, front and side doors, third row side panels and the roof above the boot area. They deliver superb sound reproduction, reminding me that not all the tracks on my phone have crackles in the bassy sections. 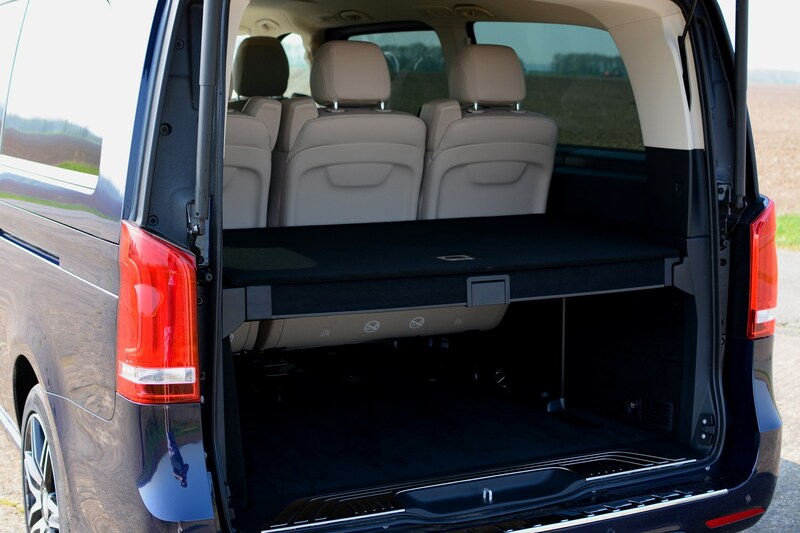 Talking of the boot, the space has been with a £400 load compartment divider – essentially a carpeted box with a hinged lid. Its value is greater than the sum of its parts, though. Primarily it acts as a second boot floor, allowing heavy objects to be placed above smaller, more delicate ones if needs be. 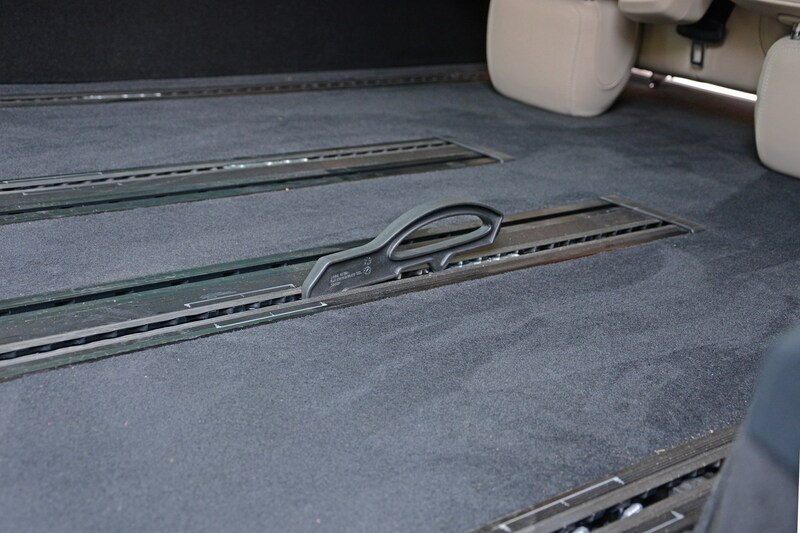 That additional level is great if you don’t have room to open the enormous tailgate because it lines up with the base of the glass hatch, adding to the convenience. 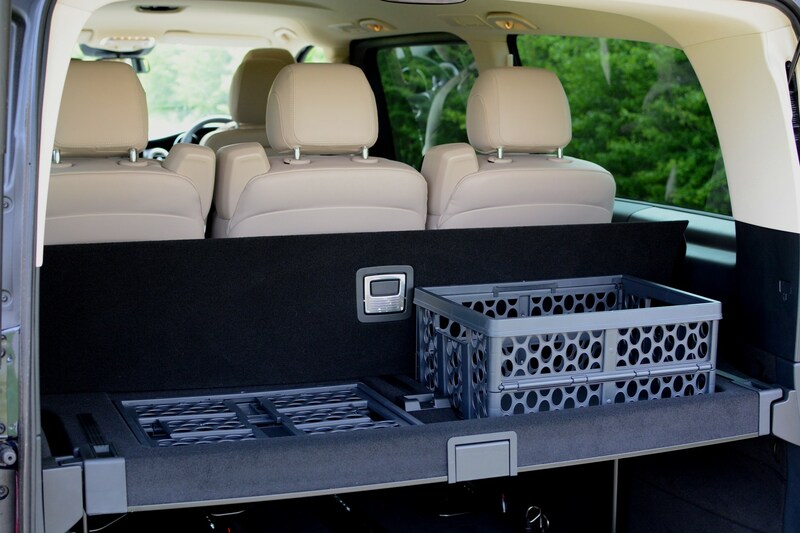 Further functionality is apparent when you open the lid of the divider to reveal two collapsible plastic boxes, useful for stopping lighter groceries from sliding around inside the boot – plus you can carry them straight into the house afterwards. And, if you need to carry taller items, the shelf flips up vertically or can be removed altogether. There’s no escaping how expensive the V 250 d AMG Line Extra Long is to buy in the first place, but the car-to-cash ratio makes it feel like good value compared with smaller MPVs. As a rule I’m not one for giving cars names. After all, the Mercedes-Benz V 250 d AMG Line Extra Long, which I’m the custodian of over the coming months, already has a perfectly conventional moniker – if one that hardly slinks seductively off the tongue – without me bestowing it with something twee/naff/cutesy (delete as applicable). Yet, on account of its cetacean-like dimensions and Cavansite metallic paintwork, I find myself affectionately referring to it as the Blue Whale. That must make me its Ishmael, if I’m going to venture off on a Herman Melville-esque tangent… Which I won’t. 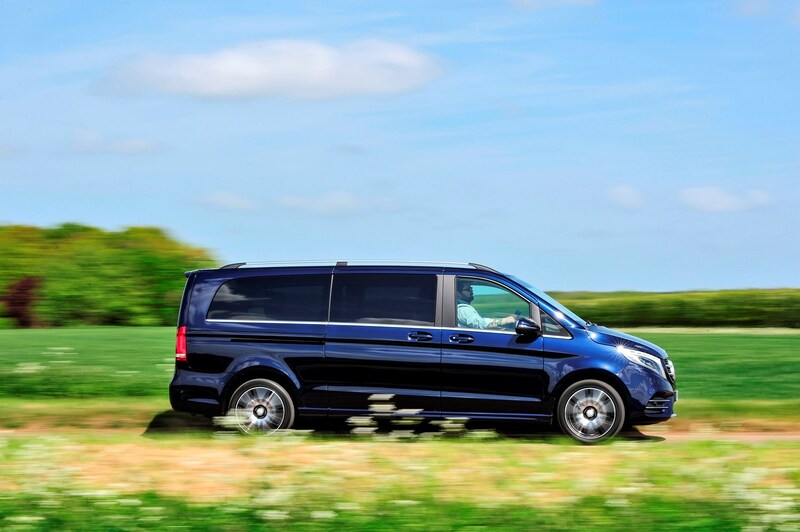 Although the V-Class is sold by Mercedes’ car division (and dealerships), there’s no escaping that this third-generation of MPV is van-based, sharing its underpinnings, and much of its bodywork and mechanical paraphernalia with the humble Vito commercial vehicle. But unlike the first-generation V-Class – and the Viano that preceded this iteration – the latest model has been differentiated more than ever before so that it feels more car-like. There’s little that can be done to hide its van-like origins – although its chamfered corners make it look as though it might have been squeezed out of a tube when compared with its most immediate rival, the sharper-edged Volkswagen Caravelle. At least the cabin feels suitably upmarket. 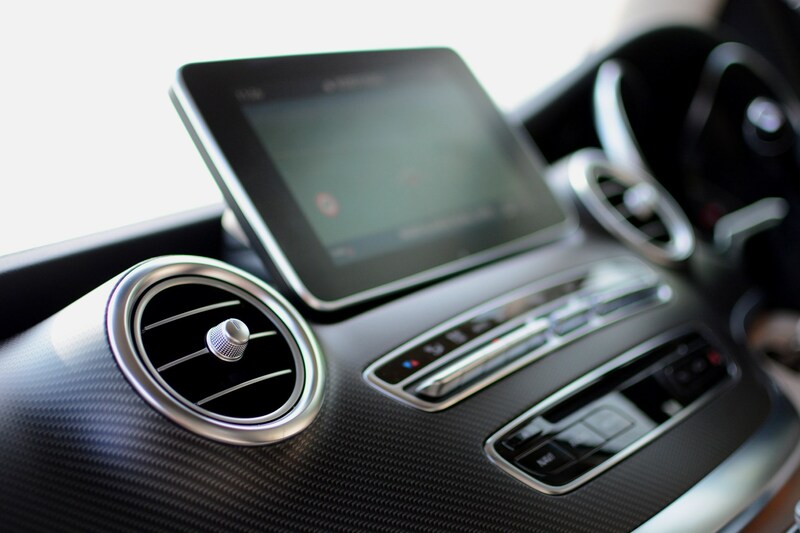 Up front it feels – and looks – not dissimilar to the C-Class, with a swoopy dashboard punctuated by circular air vents and Merc’s familiar tablet-like multimedia screen sat proud of the faux carbon-fibre applique. 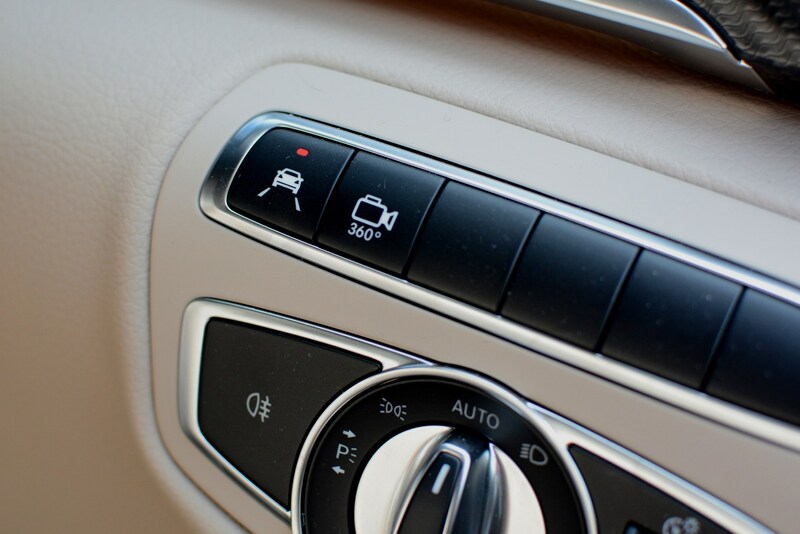 Below is the rotary-and-touchpad multimedia control module that many upmarket Benzes feature, while the other switchgear feels suitably well-engineered and reassuringly familiar. 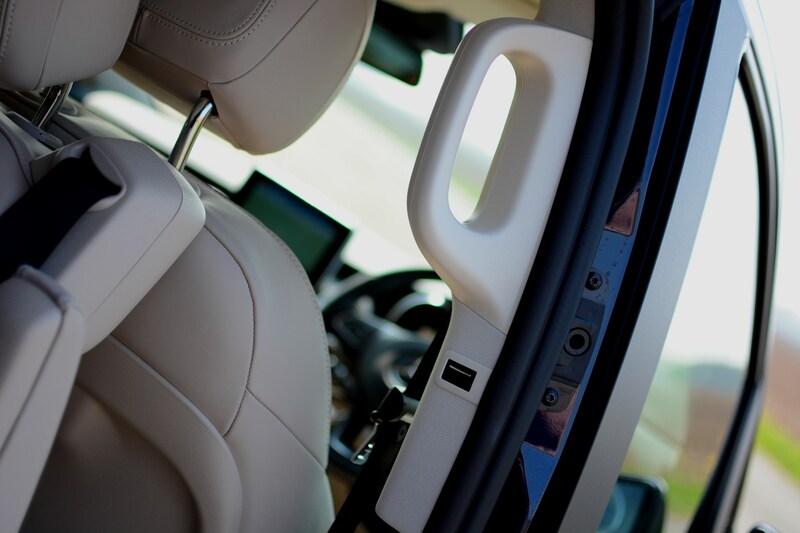 Access to the rear compartment is via two electrically operated sliding doors (controls for which are on the doors themselves, the pillars immediately behind the front passengers’ heads, within the pod for the multimedia controller and on the key), revealing space for five adults. 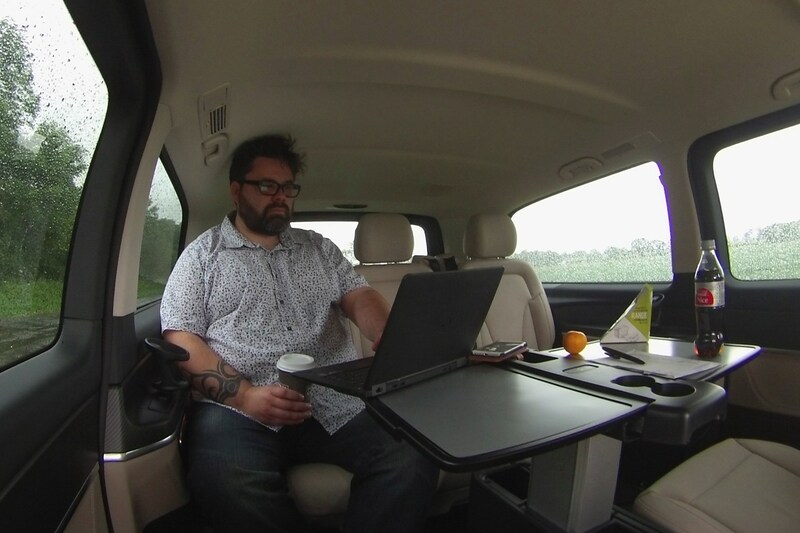 As standard there’d be two benches with space for six back there, but I opted for two captains’ chairs and a pop-up table instead – a zero-cost change when ordering a V-Class. Those van-like dimensions allow tall passengers to sit comfortably even in row three, despite the roof gently tapering by this point, while the middle pair of seats can be faced rearwards in this lounge configuration, or unclipped to point in the direction of travel. Measuring 5.37m nose to tail, the Extra Long body has an extended wheelbase compared with the shorter two V-Classes, yet this is more to the benefit of boot space than passenger comfort. 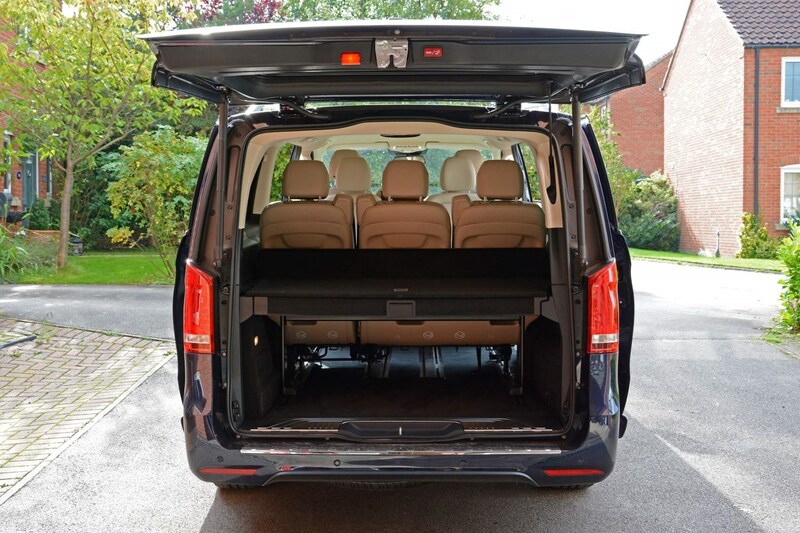 With all seven seats in use there’s 1,410 litres of capacity, expanding to a, err, van-like 4,630 litres if all of the seats barring the front pair are removed. 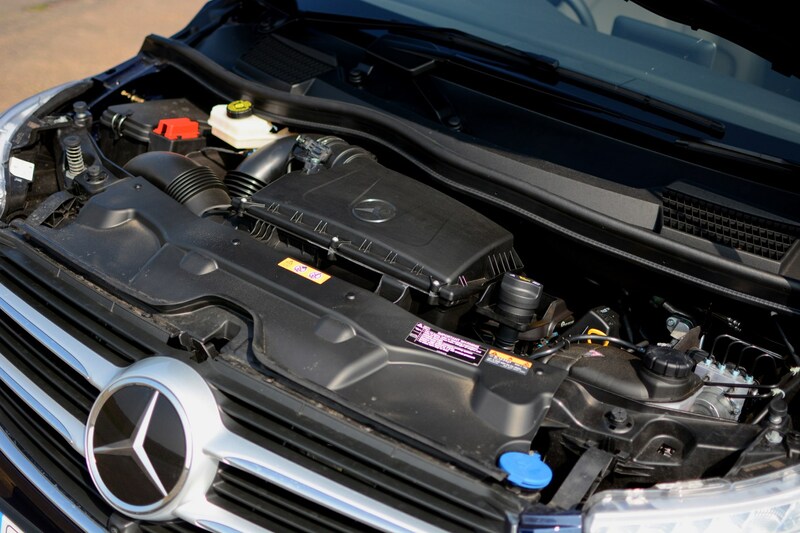 Don’t be fooled by the 250 aspect of this V-Class’s nomenclature, for under the short bonnet nestles Mercedes’ venerable – and clattery – 2.1-litre four-cylinder twin-turbo diesel. Maximum power’s a not-all-that-impressive 190hp, but in a 2,155kg leviathan like this its peak torque of 440Nm at just 1,400rpm is useful for getting up to speed briskly when pulling away from junctions. Top speed’s officially quoted at 129mph, while the 0-62mph sprint is said to be a unshabby 9.1 seconds. Certainly its pace does catch out those who expect it to be an easy overtake when exiting roundabouts on dual-carriageways. According to the stats it should average 44.8mpg but so far while I’ve been running it in gently it’s only mustered 29.4mpg. No manual gearbox is offered in the UK, meaning the smooth-shifting seven-speed automatic, complete with its steering column-mounted lever is sensibly standardised. There’s a pair of wheel-mounted paddles if you want manual control. I’ll pore over the many intricacies of the flagship AMG Line specification in a future update, but suffice to say the differences over the entry-level Sport are minimal, and primarily superficial – so dampen any hopes you had that this is really a Mercedes-AMG V 63 pretending to be something more subdued. Could you imagine..? Chief among the changes are a subtle bodykit – the gaping grilles in the front bumper are easier to spot than the sill extensions, tailgate spoiler and a (mock) rear diffuser. Those black and machine-finished silver alloy wheels are 19-inchers (realising this enables you to appreciate how big the V-Class is) but thanks to the standard air suspension, the ride remains supple, especially with a few people in the back. Inside the tell-tales are restricted to some chrome bezels for the four circular air-vents in the dash and that mock carbonfibre trim mentioned earlier. 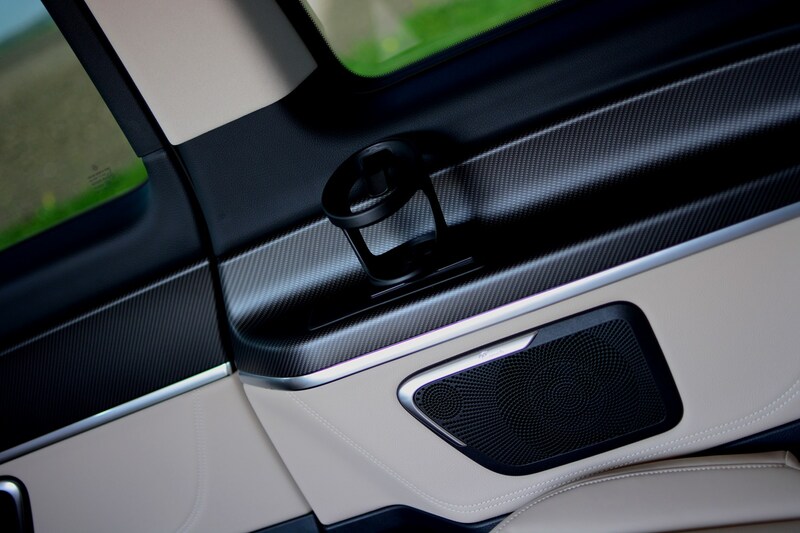 I’ve also plundered Mercedes’ options list to reflect how V-Class buyers typically spec their cars – again, these will be explored in a forthcoming update – but two stand-out additions are the excellent Burmester surround sound speaker system (£675) and the invaluable 360-degree camera package. 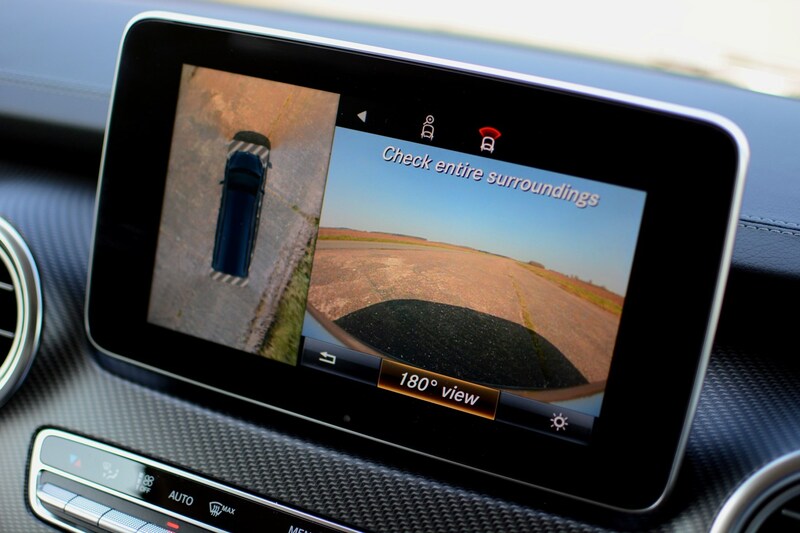 At £335 the four cameras are a no-brainer and make the V-Class significantly easier to park. All of the optional extras bump the price of Parkers’ long-term V-Class from an already not inconsiderable £52,470 to £58,260. That’s significantly cheaper than a studio apartment in Kensington for almost as much space. So, nearly 1,000 miles in already and it’s proved to be faultless except for one gripe I’m already finding a tad tiresome: the fuel filler flap. Not only does it betray its van origins further (you have to open the passenger door to release the flap) it’s situated too low down, making you stoop during diesel replenishment. Either that or it makes you look like you’re scanning the forecourt floor for loose change (we’ve all been there, but it’s less sociably acceptable when bending over next to a 17-plate Merc). 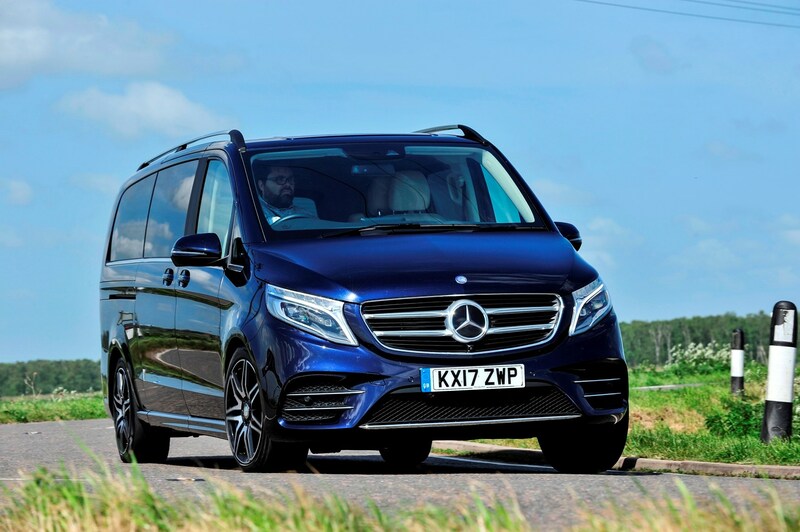 Even so, the overriding first impressions are positive – let’s see if they remain so as much is asked of the V-Class over the coming months as we determine whether it really is the Mercedes-Benz of MPVs.